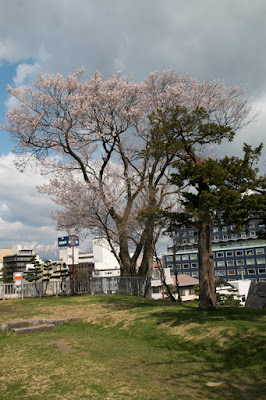 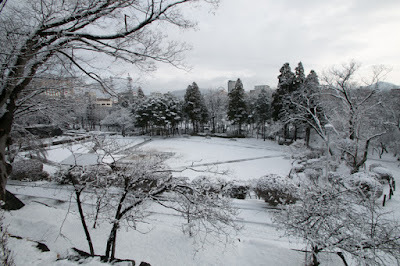 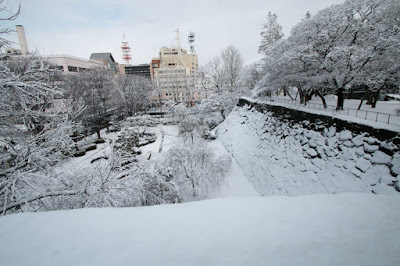 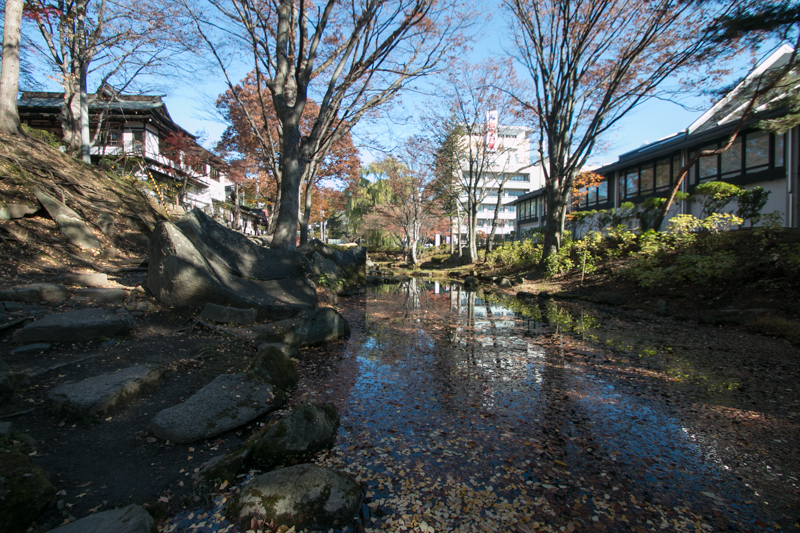 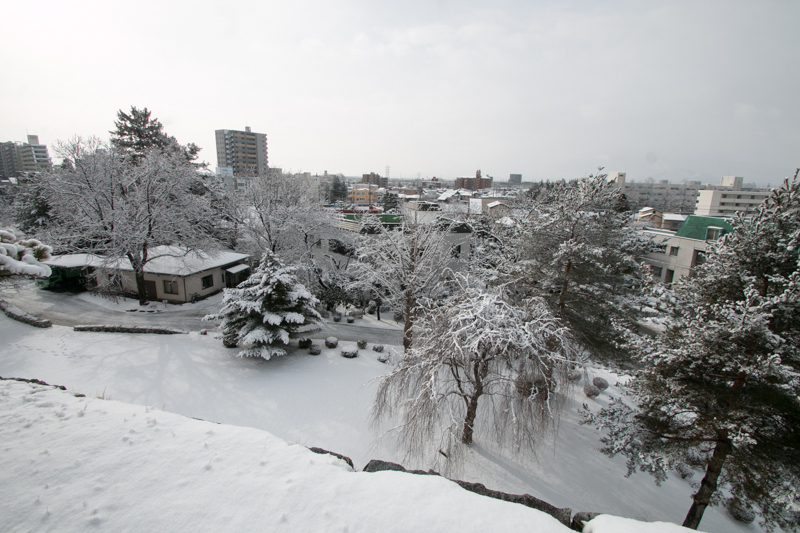 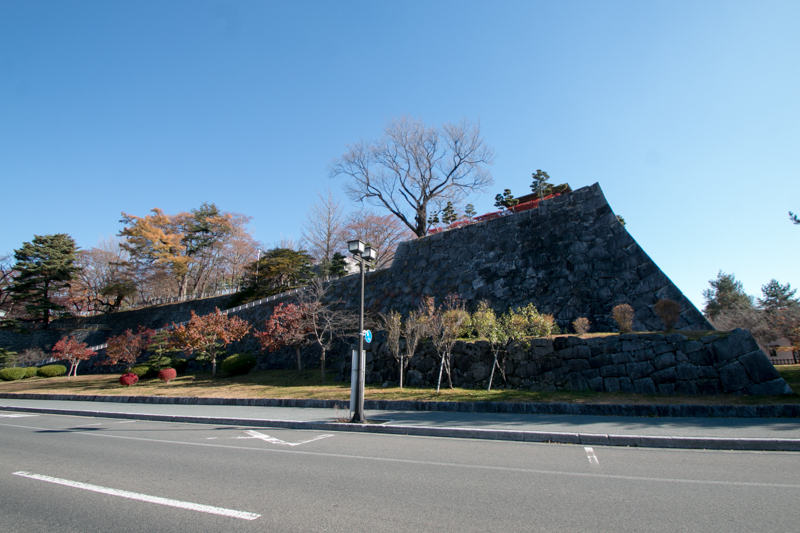 Morioka castle is located on the hill aside Nakatsugawa river, in the center of Morioka city. 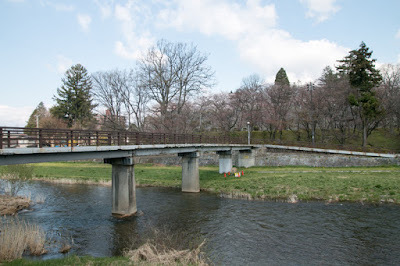 Morioka city is placed at the center of Iwate prefecture, and crossing point of Oshu Kaido way runs north and south bound along with Kitakamigawa river, and east and west bound way from Sanriku coast of Pacific ocean to Akita prefecture across Oshu mountains. 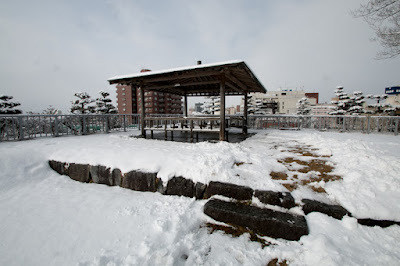 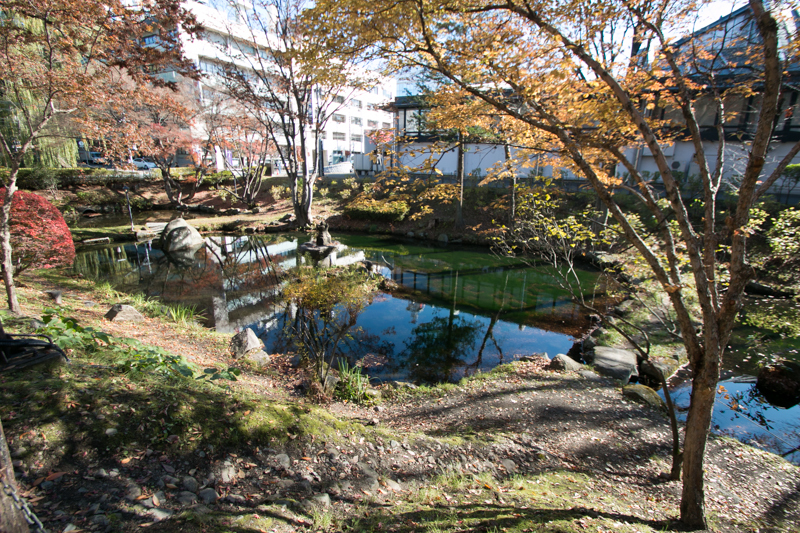 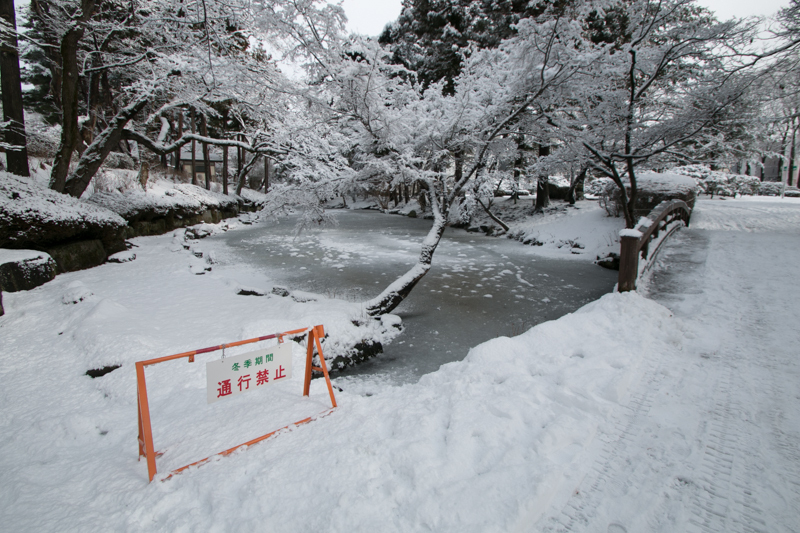 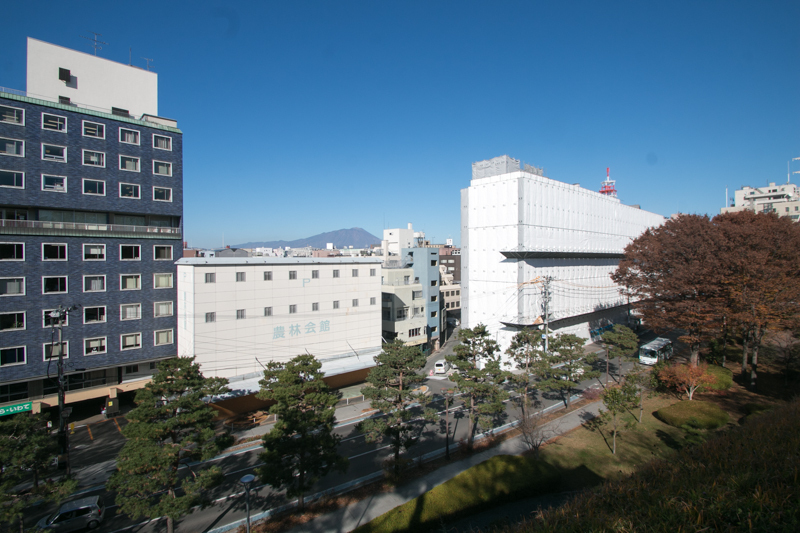 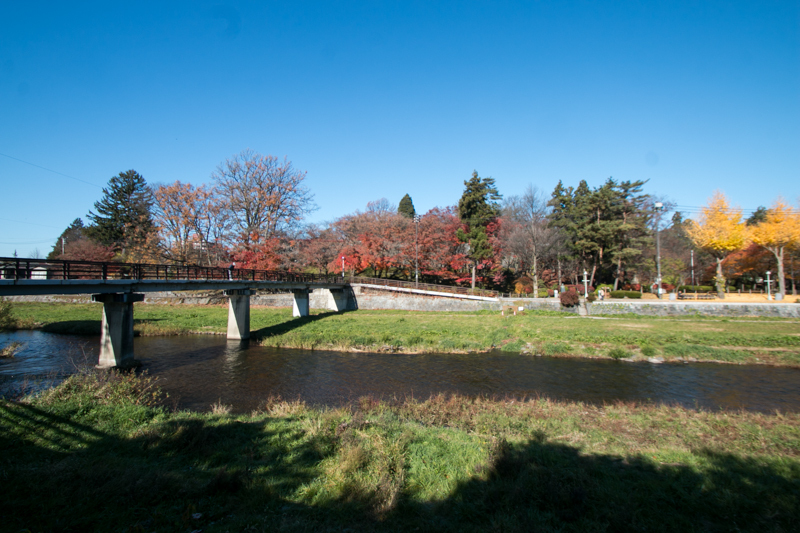 Because of this geographic condition, Morioka area had been the center of north Tohoku area since Yamato dynasty built Shiwa castle as a local base in 9th century. 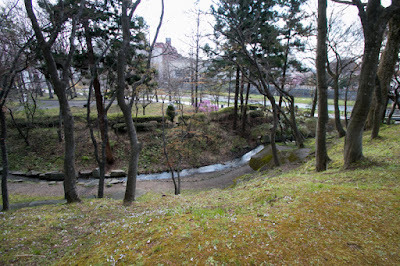 Later in 10th century Morioka area became the base of local lord Abe clan which expanded its territory toward major part of north Tohoku region, but Abe clan was subjugated by alliance of Minamoto clan and Kiyohara clan at "Zen Kunen no Eki (former nine years campaign). After the fall of Oshu Fujiwara clan which ruined Kiyohara clan, Morioka area had been governed by Oshu Kudo clan, which was originally the retainer of Kamakura Shogunate. 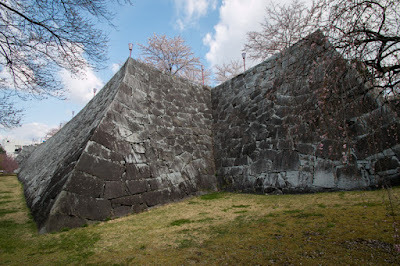 But after the fall of Kamakura Shogunate, people of Kudo clan conflicted each other dividing into Emperor Godaigo side and Muromachi Shogunate side and significantly decreased their power. 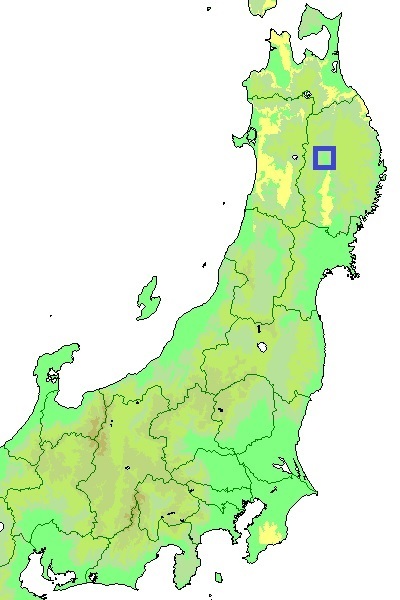 Looking at this situation, Nanbu clan which already advanced into the north part of Iwate prefecture ascended into Morioka area. 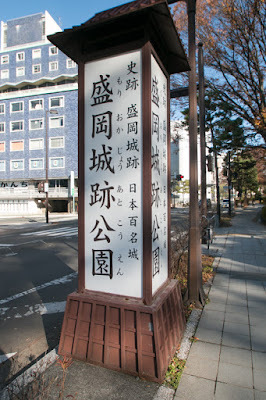 Nanbu clan was originally a branch family of Minamoto clan. 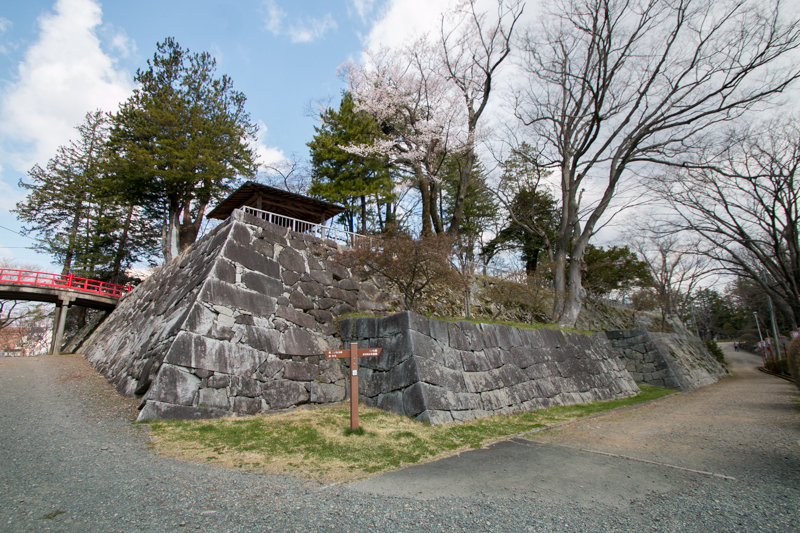 In 1189, Yoritomo Minamoto (1147-1199), founder of Kamakura Shogunate, extinguished Oshu Fujisawa clan which dominated Tohoku region. Nanbu clan made achievement in this battle and was appointed as a lord of east part of current Aomori prefecture and north part of Iwate prefecture. As one of the traditional and powerful clan along with Date clan or Ashina clan, Nanbu clan gradually expanded their power during Muromachi era. 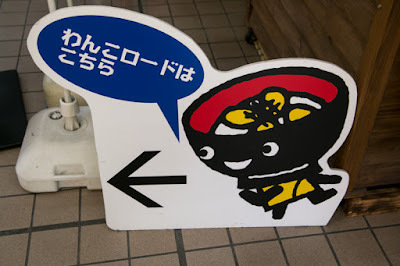 At the period of Harumasa Nanbu (1517-1582), the territory of Nanbu clan expanded to whole part of Aomori prefecture and north half of Iwate prefecture. It was the peak period of Nanbu clan and it was said that the territory of Nanbu clan was so wide that it took time crescent moon changes to full moon to pass it. 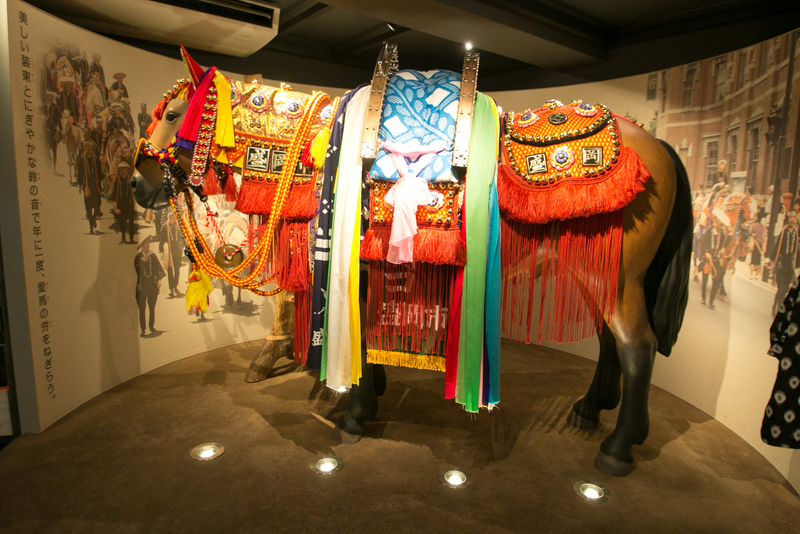 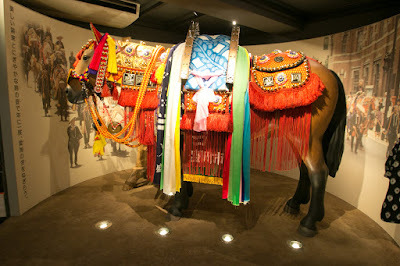 Harumasa also felt necessity to communicate with central rulers, thus sent good hawks and horses to Nobunaga Oda (1534-1582) to make friendship. 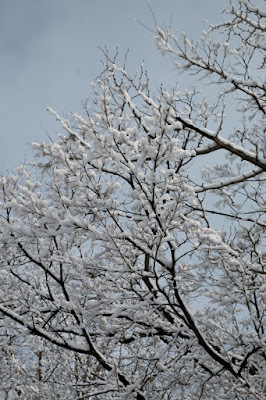 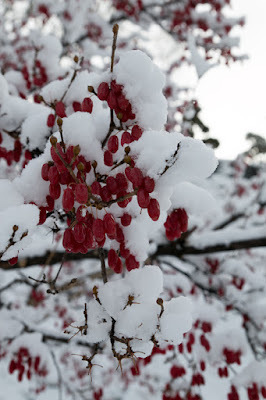 But territory of Nanbu clan was too vast and isolated especially in winter season, Nanbu clan was a mixed up of branch families and not so centralized. In addition to this, Harumasa at first did not have his real son and adopted his cousin Nobunao Nanbu (1546-1599) as a successor, but later had his actual son Harutsugu Nanbu (1570-1582) Nanbu thus a conflict arouse the position of next successor. 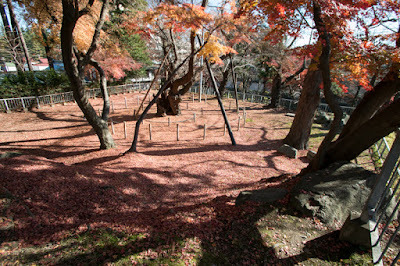 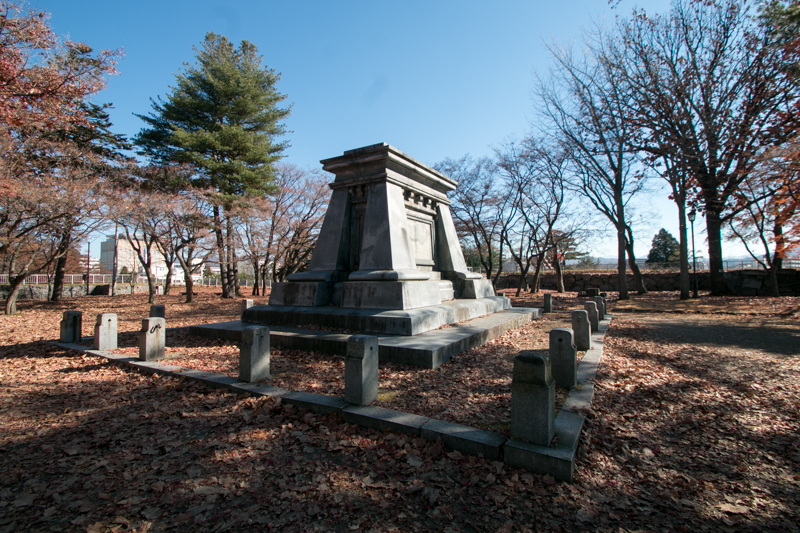 In 1582 Harumasa died in ill and once Harutsugu succeeded the position. But Harutsugu died in the same year in accident, and as a result, Nobunao took over the leader. 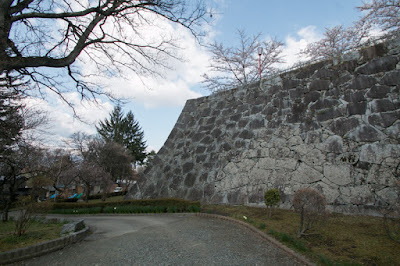 It is said that the death of Harutsugu was assassination by Nobunao, and other powerful retainer Masazane Kunohe (1536-1591) who was the core of Nanbu army and planned to place his relative to new leader strongly dissatisfied with this succession. 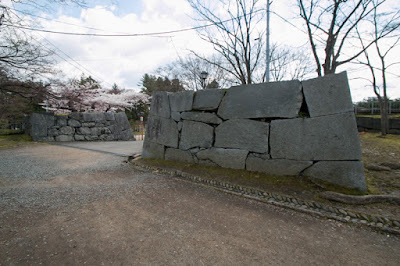 Utilizing this situation, Tamenobu Oura (1550-1608), a branch family of Nanbu clan and commander of Tsugaru area (western half of Aomori prefecture), suddenly left Nanbu clan and declared independence as Tsugaru clan. Harumasa could not suppress this revolt because of internal confusion, and in the meantime Tamenobu Tsugaru already negotiated to Hideyoshi Toyotomi (1537-1598), ruler of central area after Nobunaga, and was approved his status. Later in 1590, Nobunao Nanbu also visited Hideyoshi at Odawara campaign and subordinated to Hideyoshi and was guaranteed their land, but they could not stop the independence of Tsugaru clan. 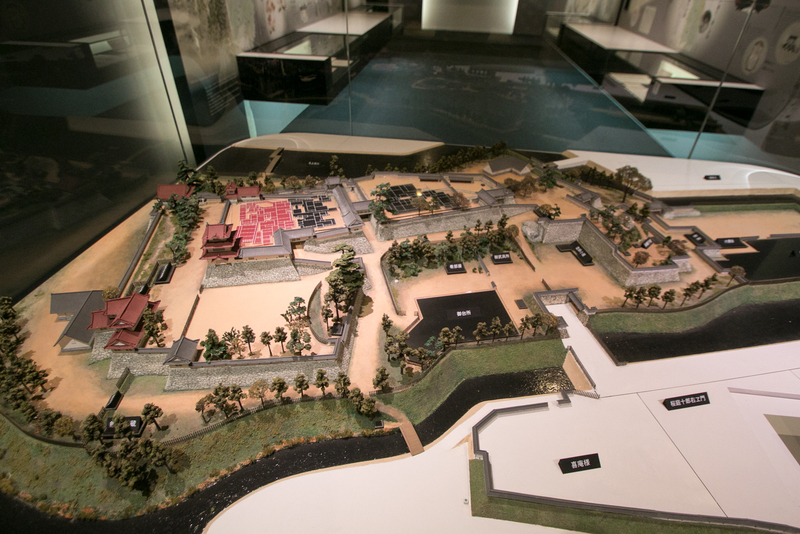 From this time Nanbu clan and Tsugaru clan became hostile, and later Edo Shogunate considered that Nanbu clan and Tsugaru clan do not place in the same room at Edo castle. 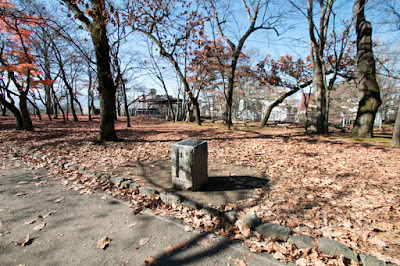 In 1591, Masazane Kunohe who do not admit Nobunao at last revolted to Nobunao at Kunohe castle. As Kunohe clan was the core of military power of Nanbu clan, Nobunao could not suppress this by himself and asked assistance to Toyotomi government. 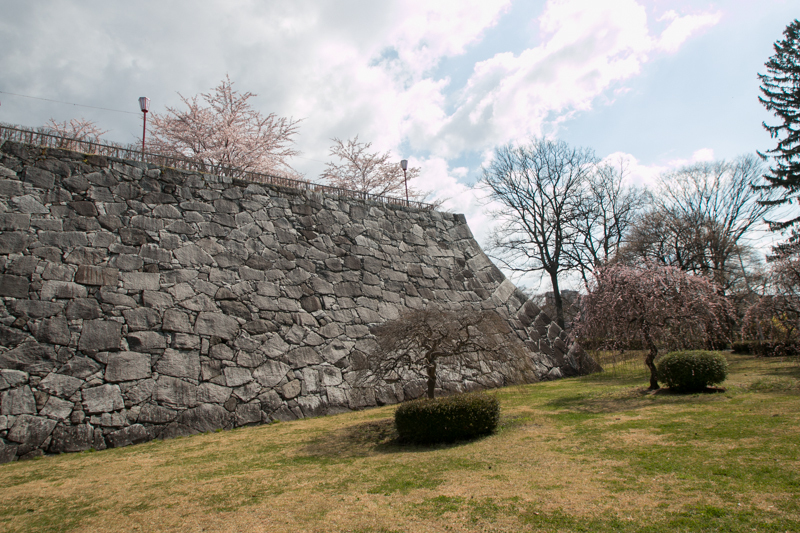 For Toyotomi government this was a challenge to their authority, thus they send numerous solders to Kunohe castle and extinguished Kunohe clan. At last, situation of Nanbu clan has stabilized. 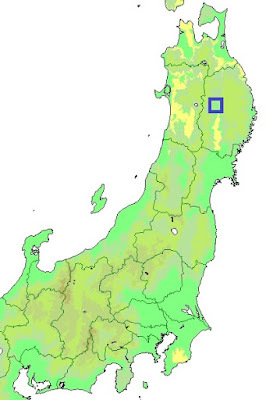 Under Toyotomi government, as a compensation of Tsugaru area, Nanbu clan achieved middle area of current Kitakami city and Hanamaki city area. 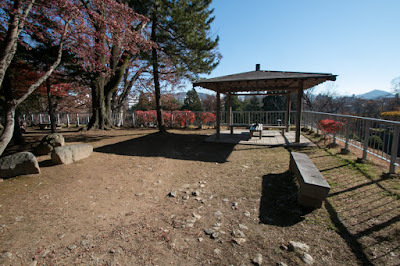 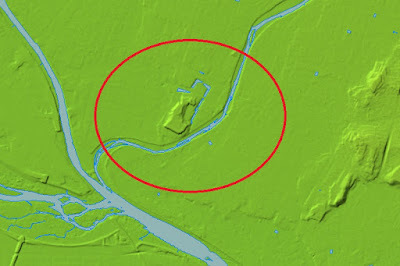 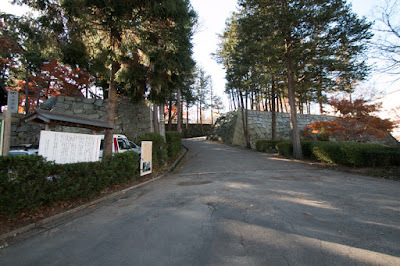 Former main base of Nanbu clan such as Sannohe castle or Kunohe castle located too north, thus Nobunao decided to move his residence southward. 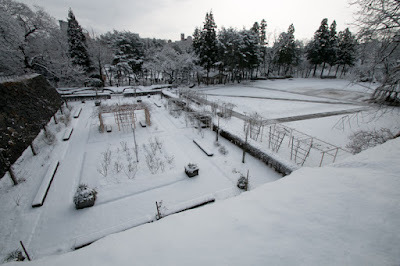 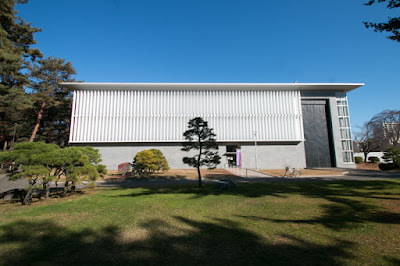 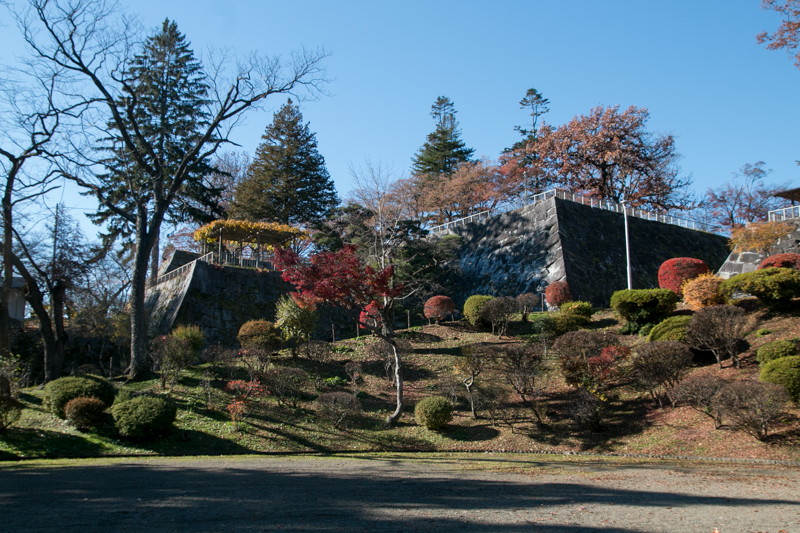 Originally there was Kozukata castle built by retainer of Nanbu clan at the site of Morioka castle, and Nobunao started to renovate Kozukata castle in 1598. Just at that time Nobunao visited Hizen Nagoya castle (Saga prefecture) which was the main base of Hideyoshi for foreign expedition and built by latest technology, and Nobunao might have used Hizen Nagoya castle as a reference of his new castle. Furthermore, Toyotomi government informally supported Nanbu clan to build castle, as a restraint to Masamune Date (1567-1636) who was the lord of Sendai area and still had ambitions. 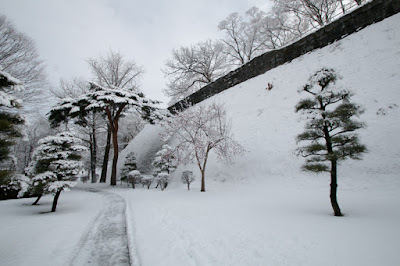 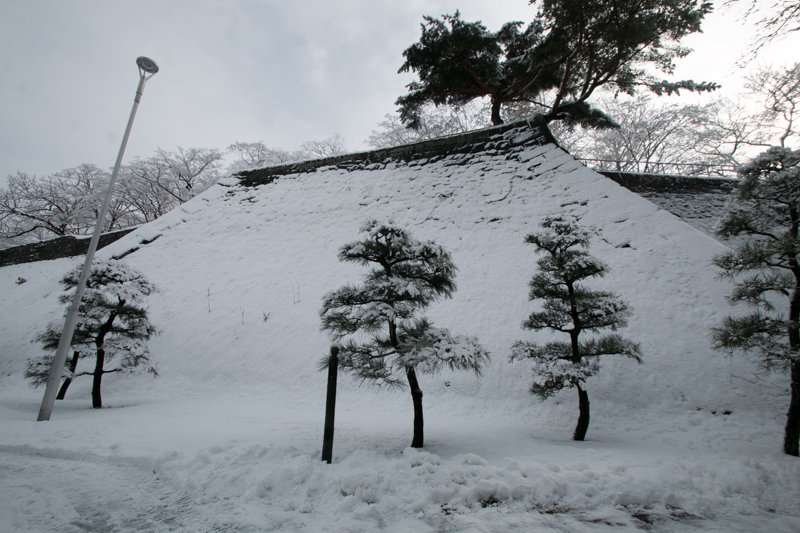 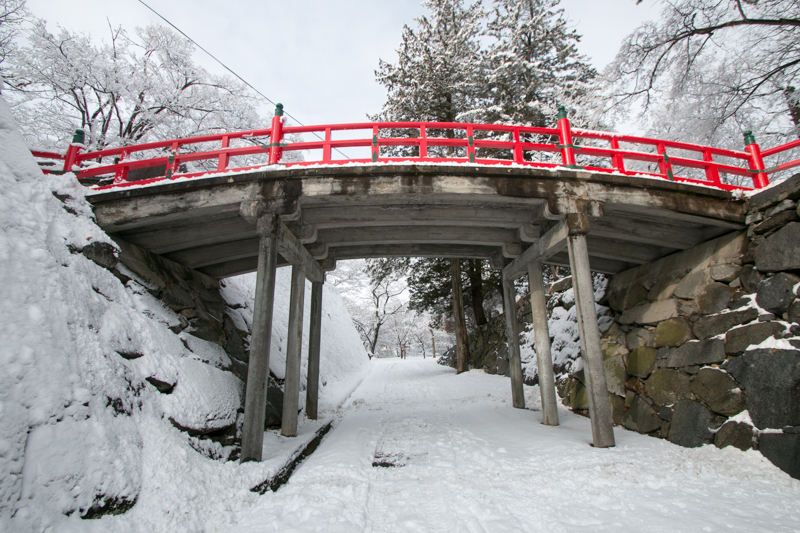 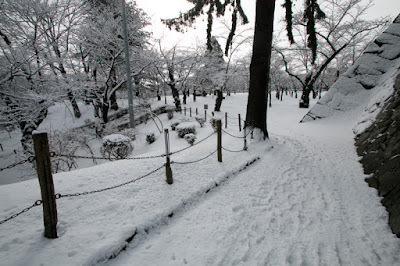 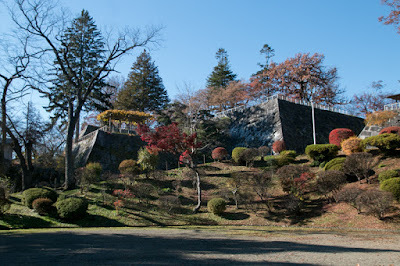 Morioka castle spreads over a long and narrow elliptical shape hill of 300 meter long and 100 meter wide. 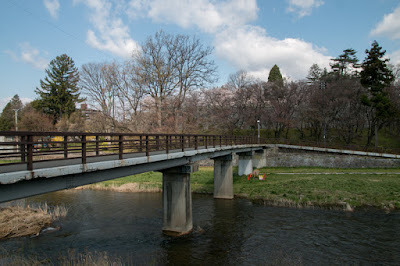 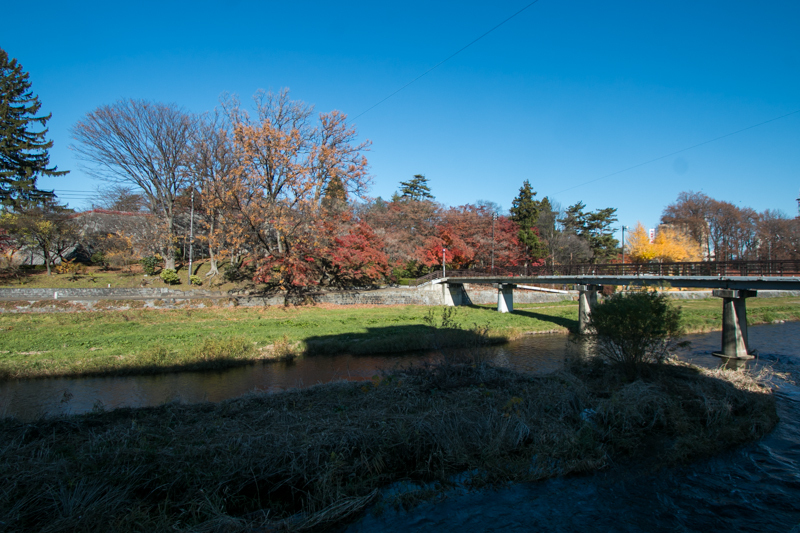 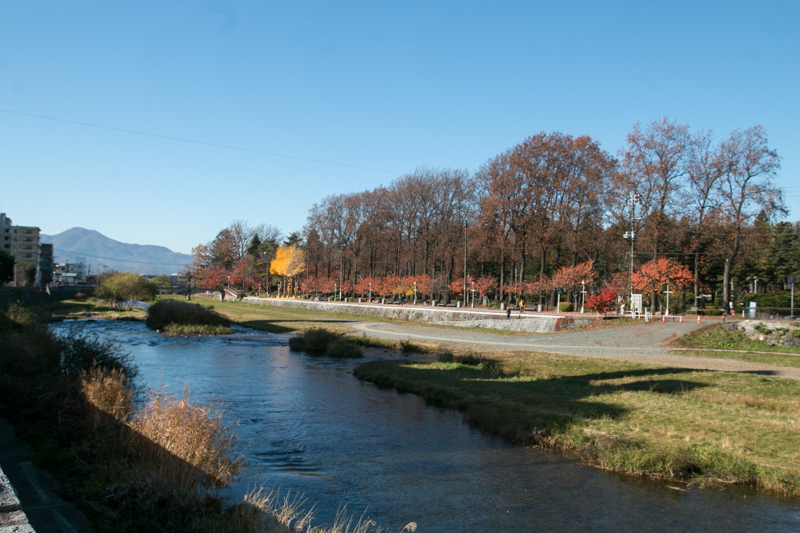 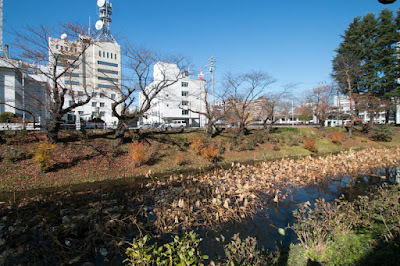 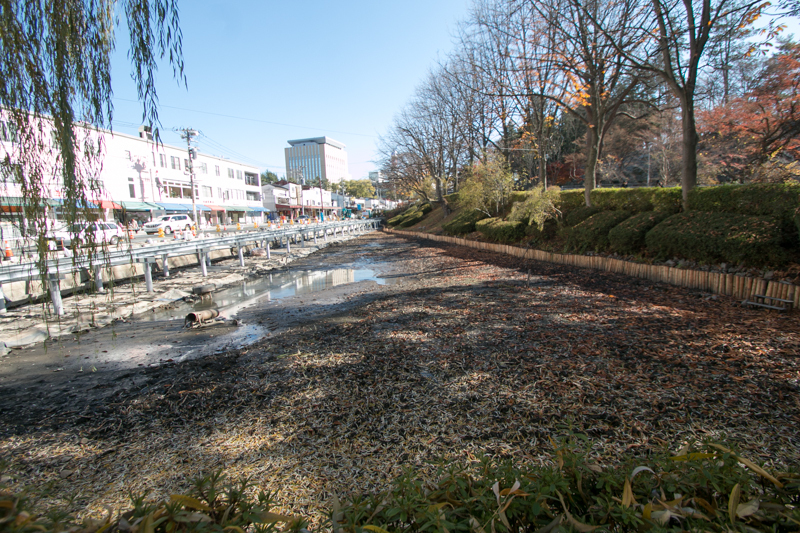 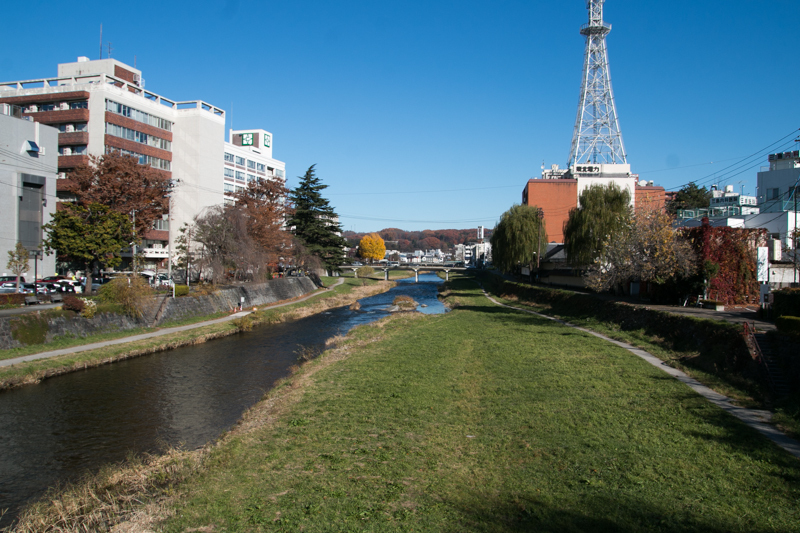 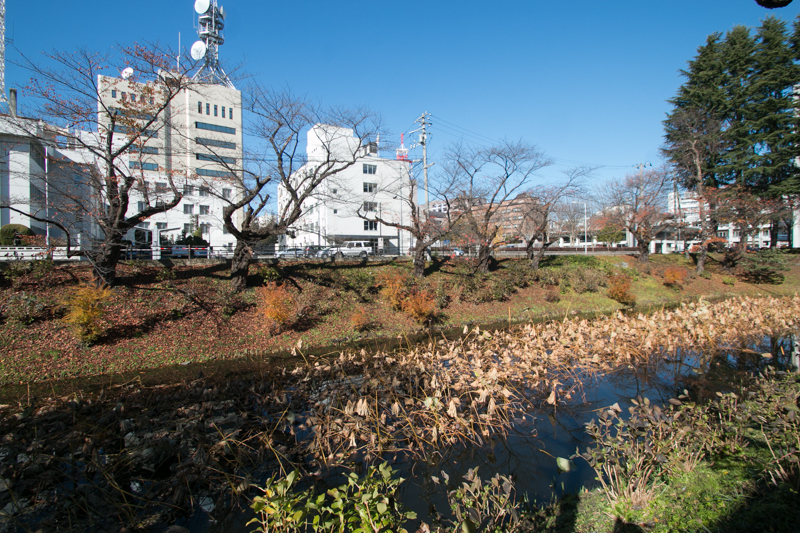 Now only south eastern side faces Nakatsugawa river, but formerly main stream of Kitakamigawa river runs meandering at western side of the castle, and whole direction of the castle was protected by rivers and water moats. 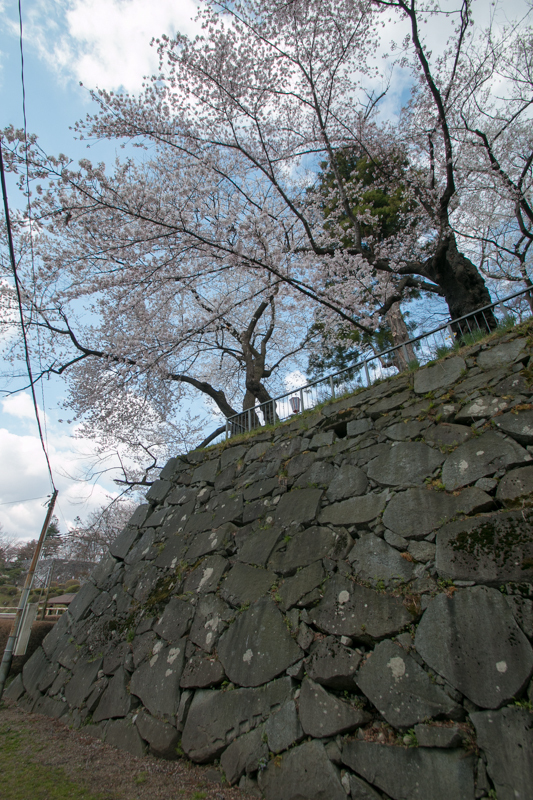 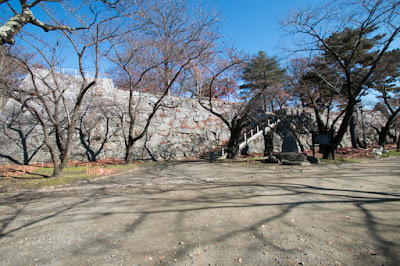 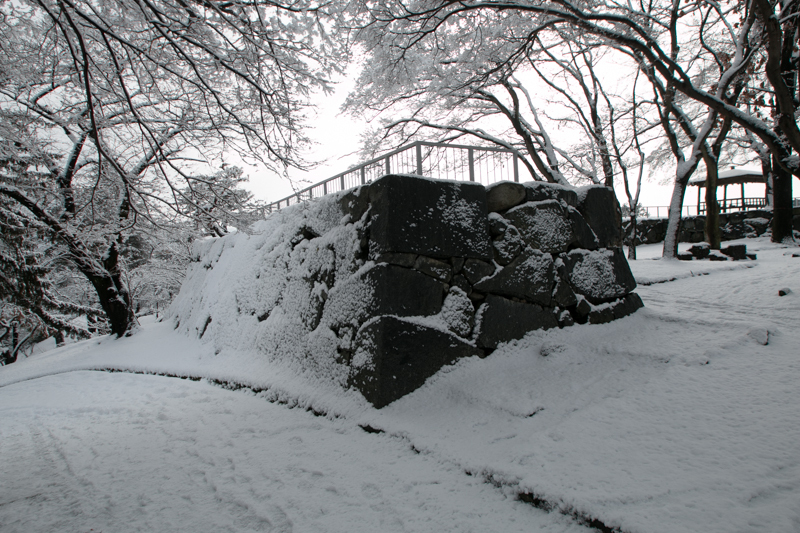 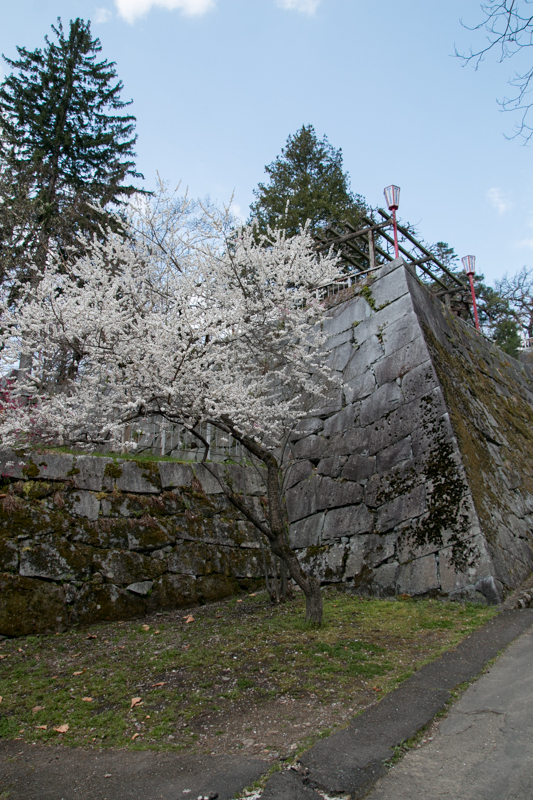 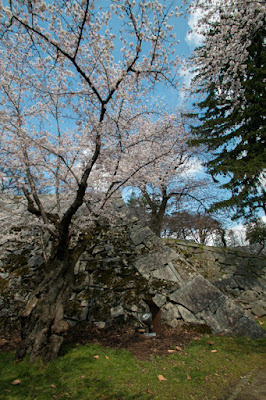 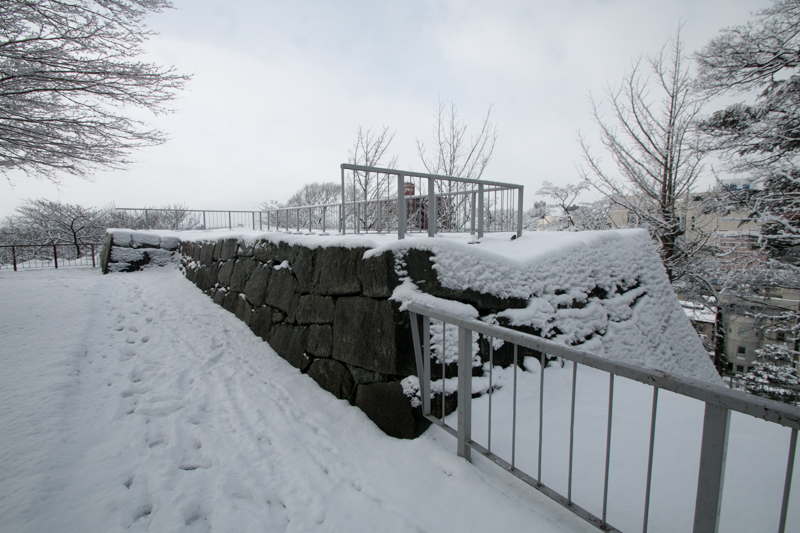 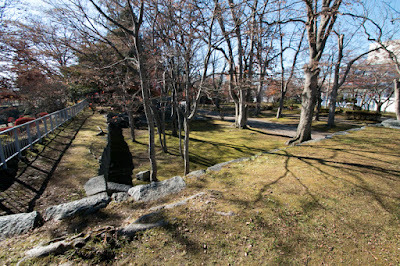 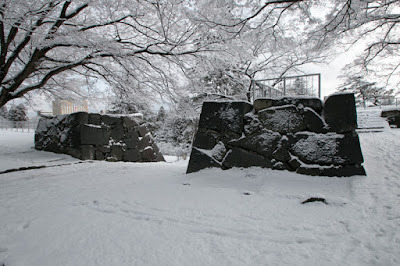 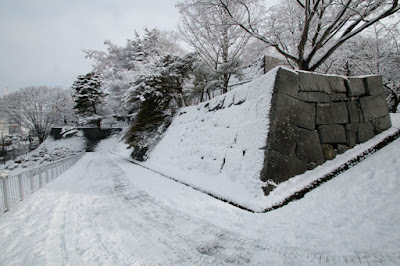 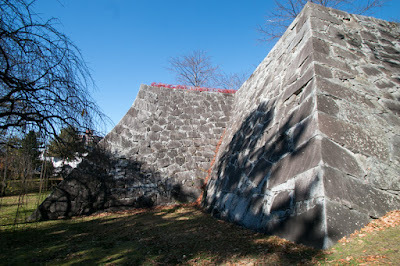 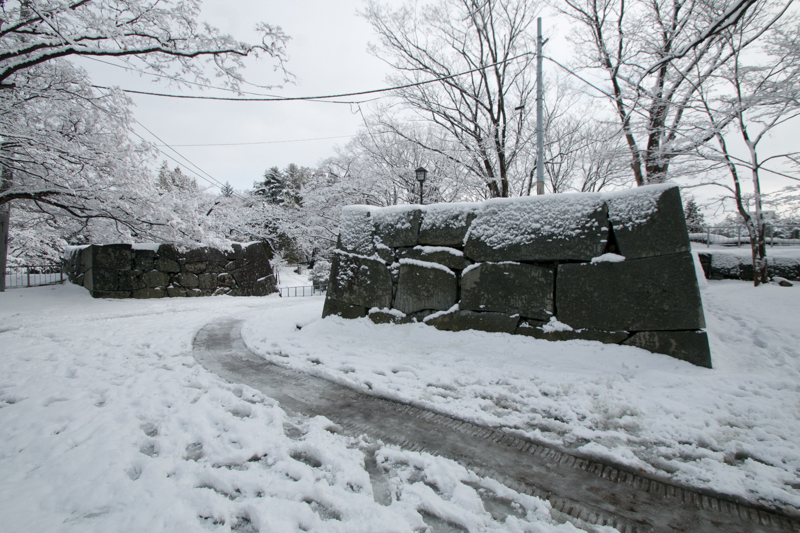 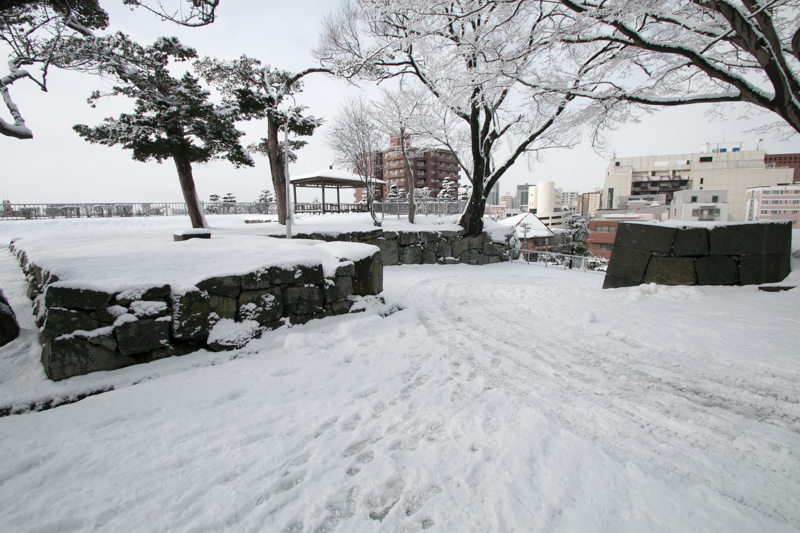 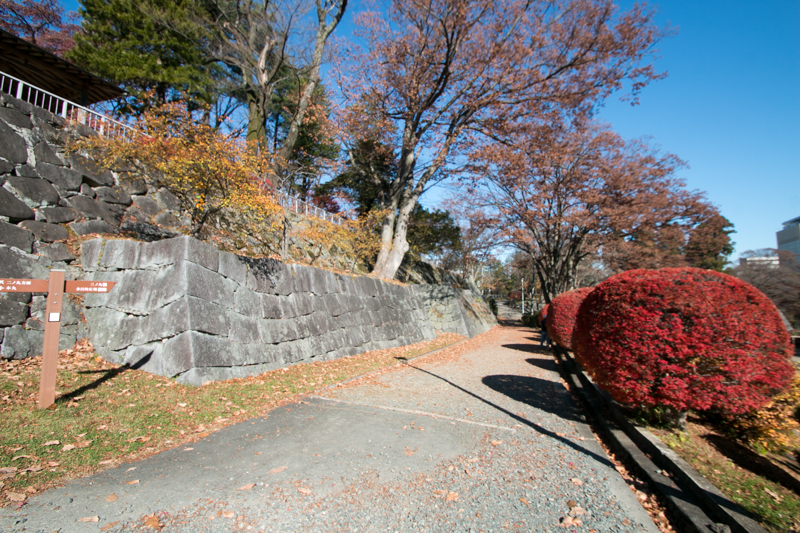 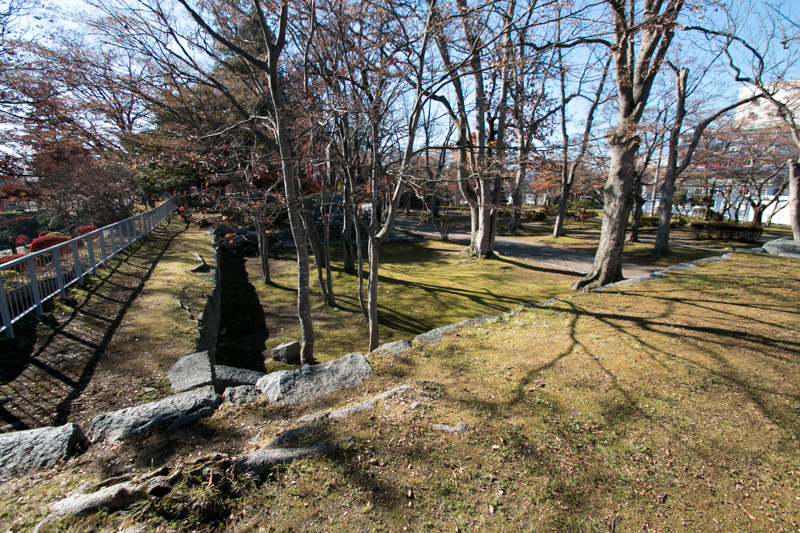 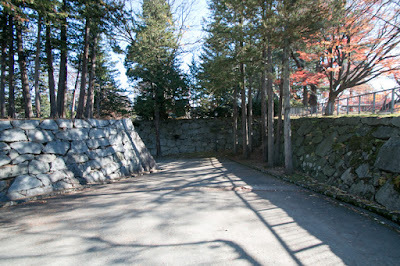 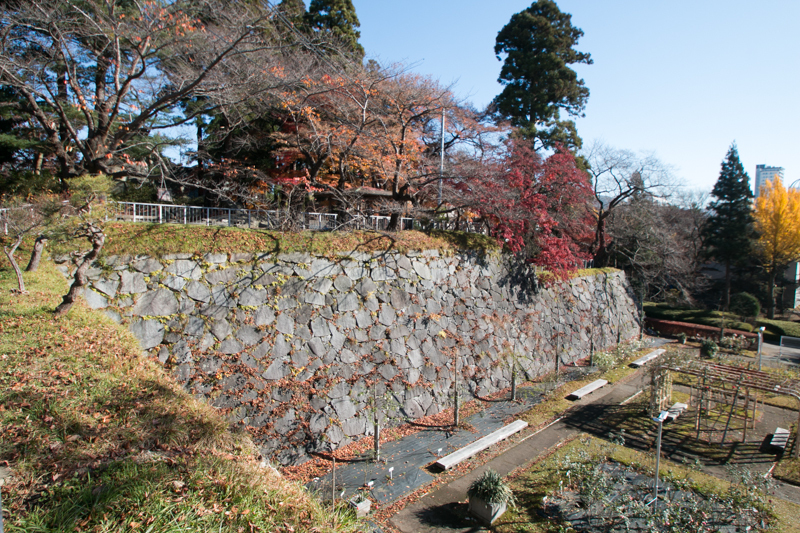 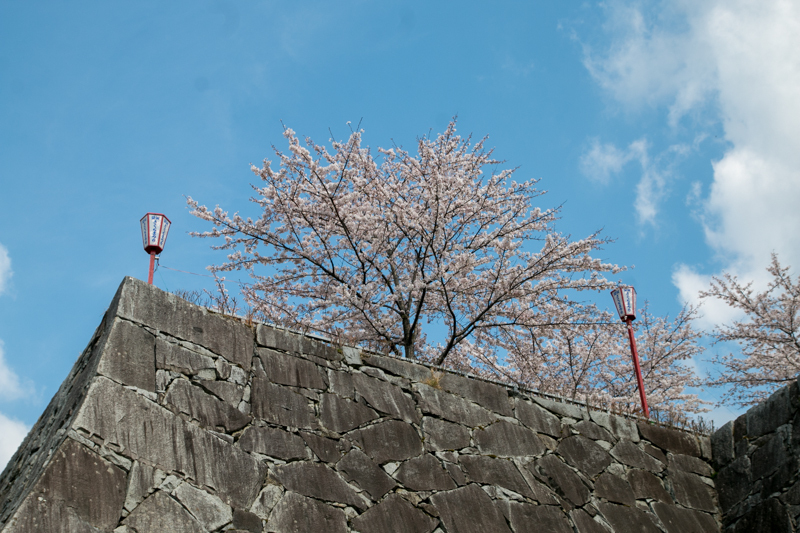 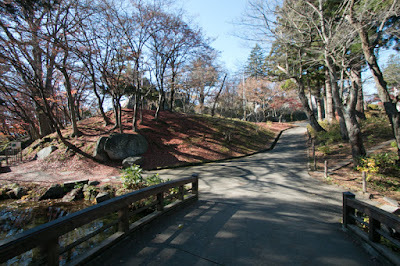 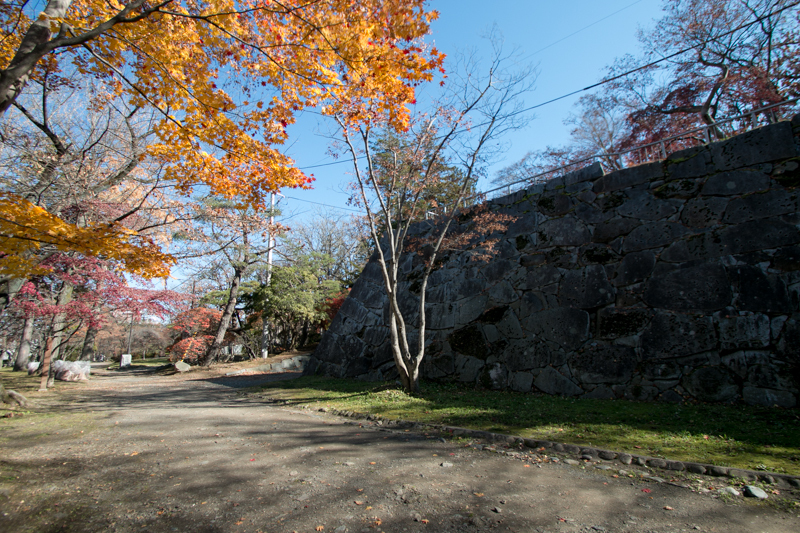 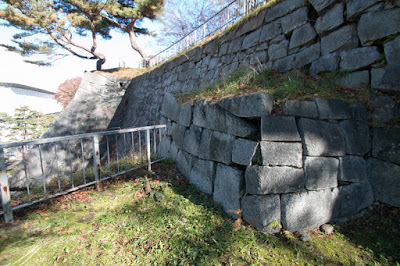 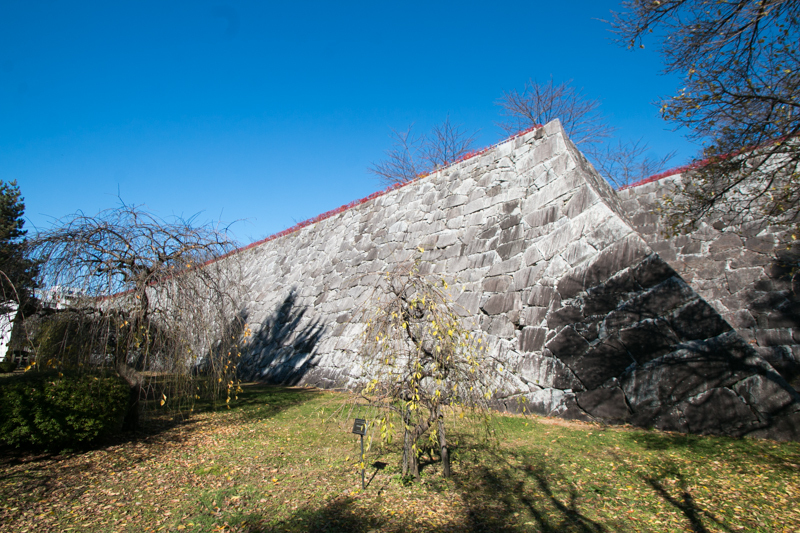 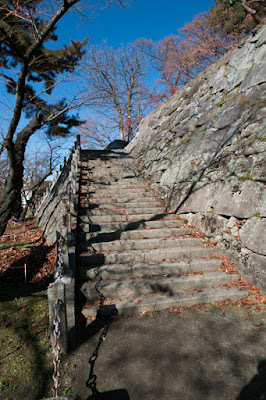 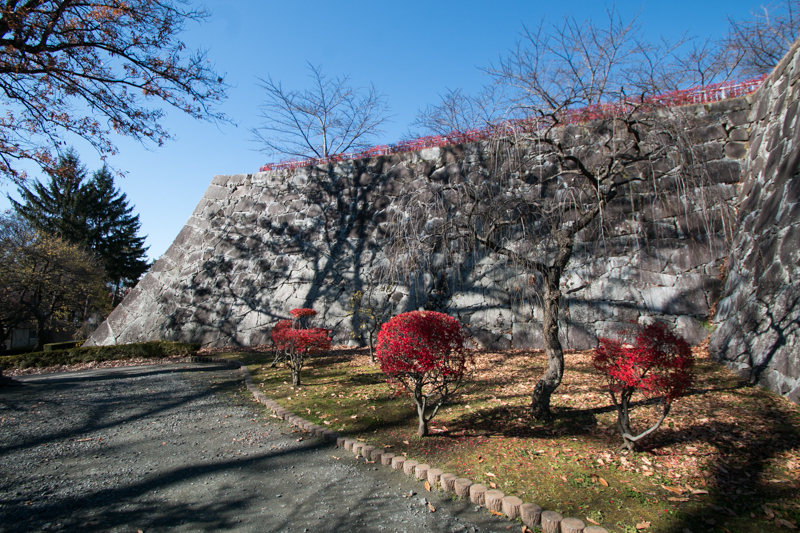 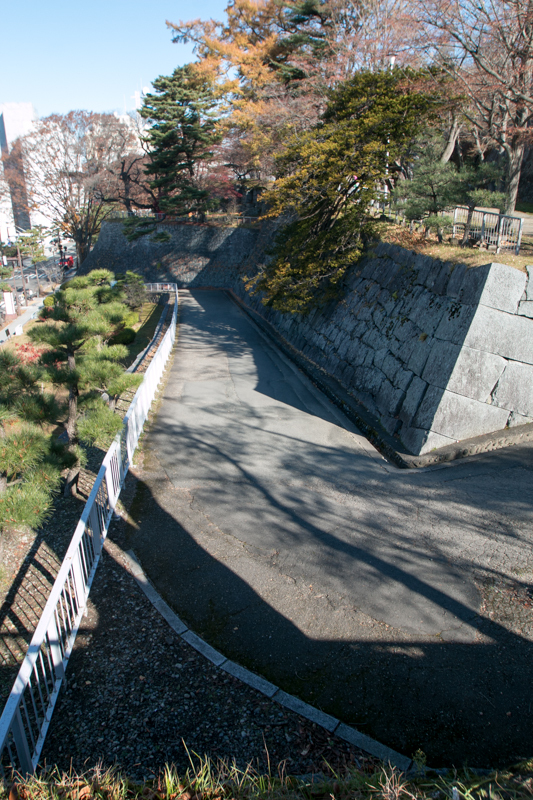 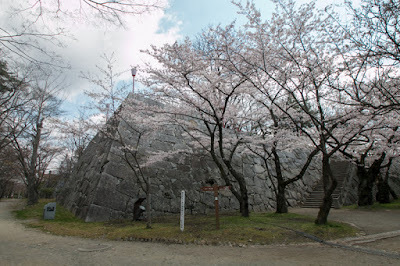 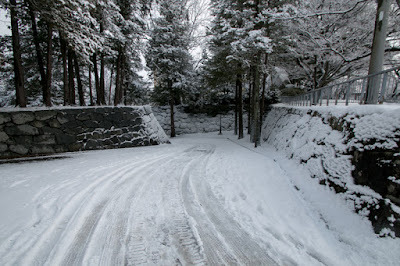 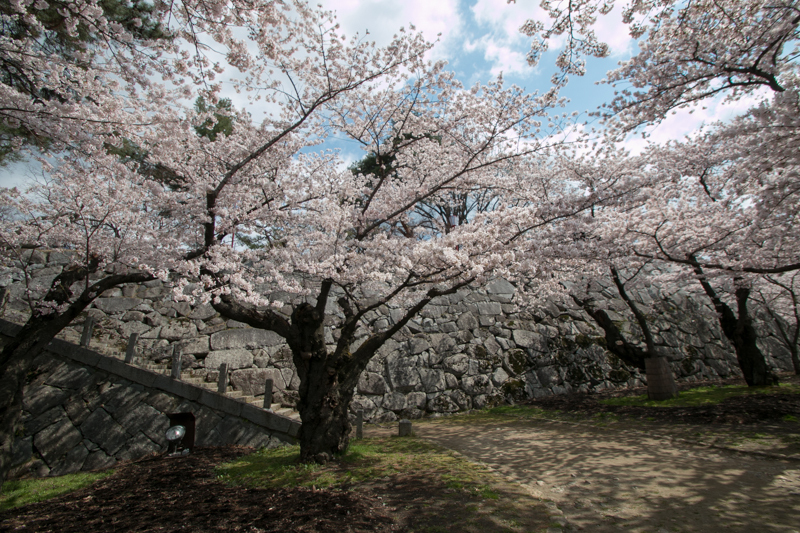 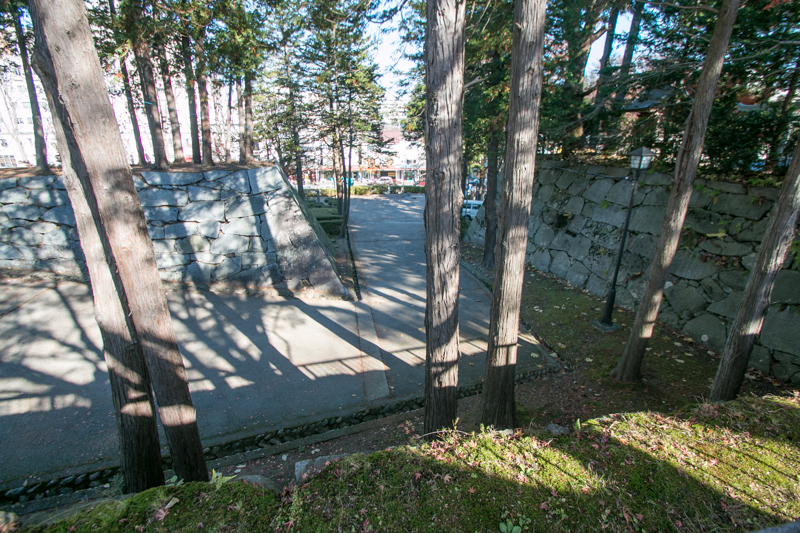 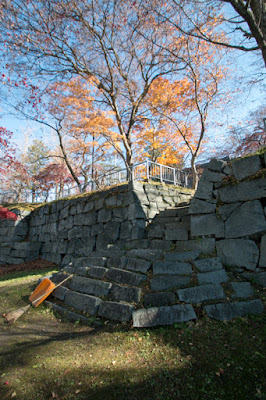 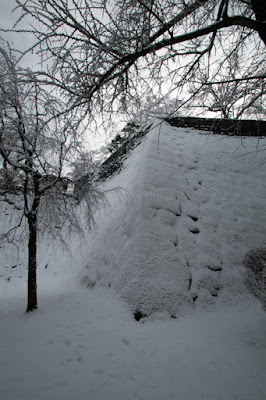 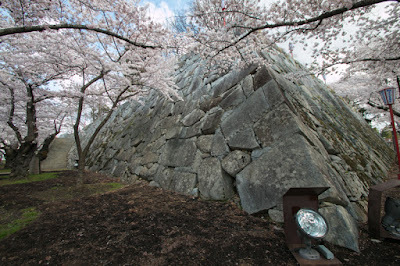 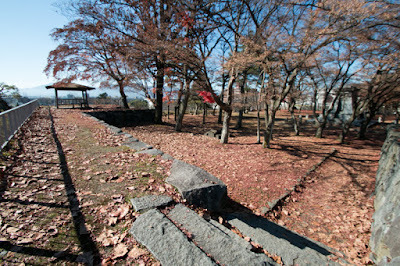 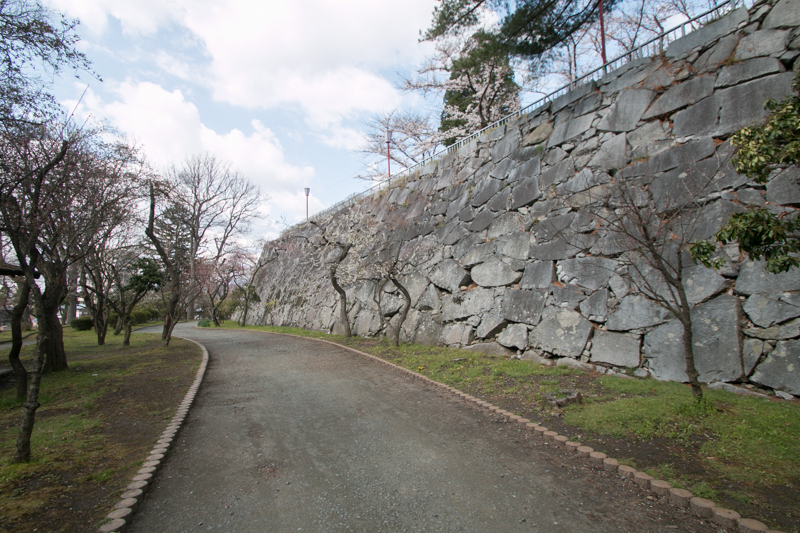 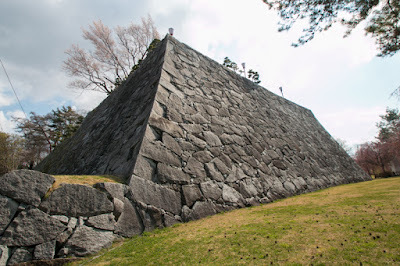 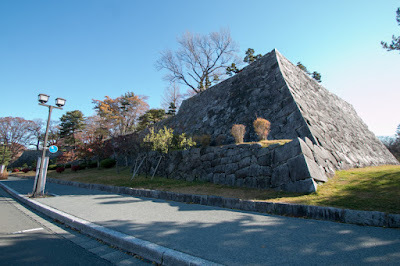 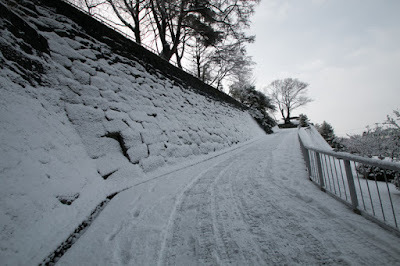 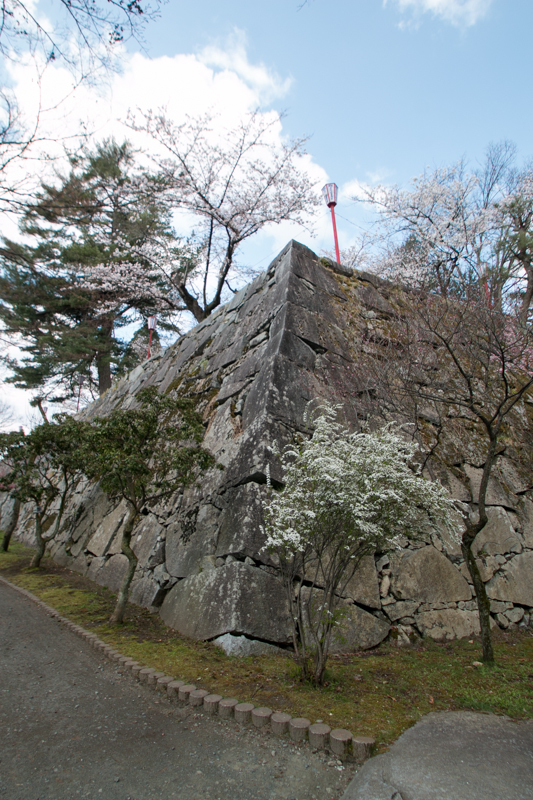 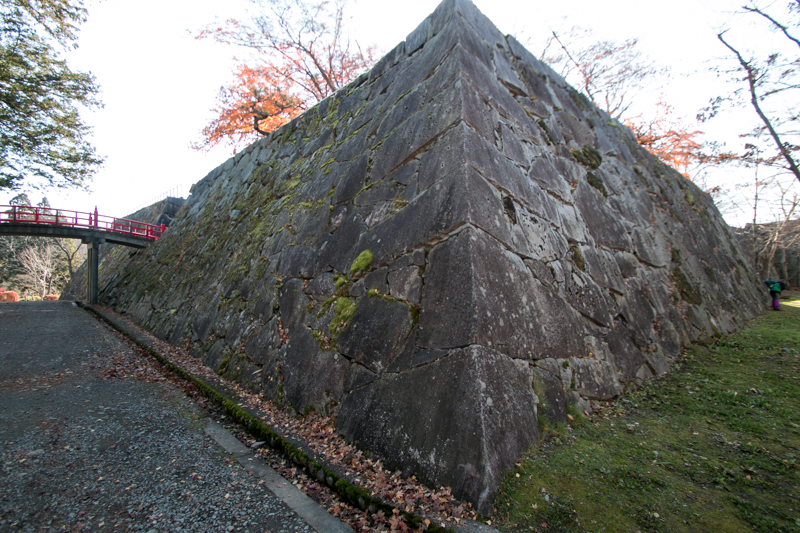 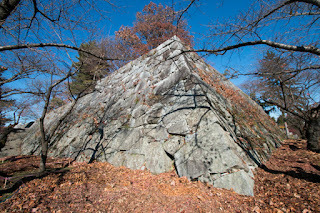 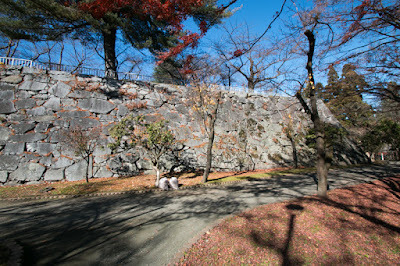 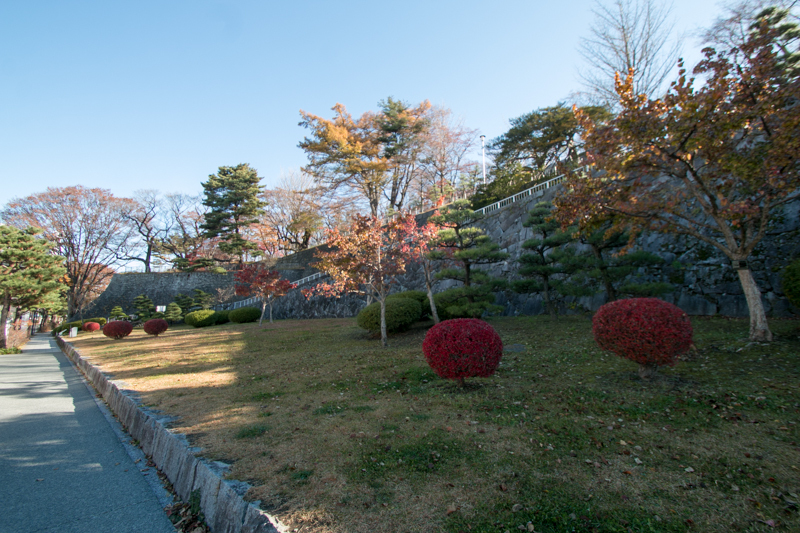 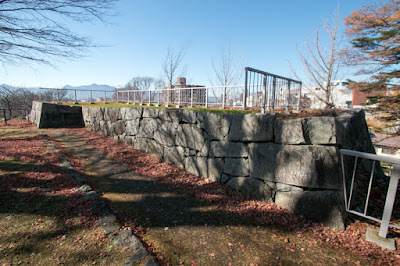 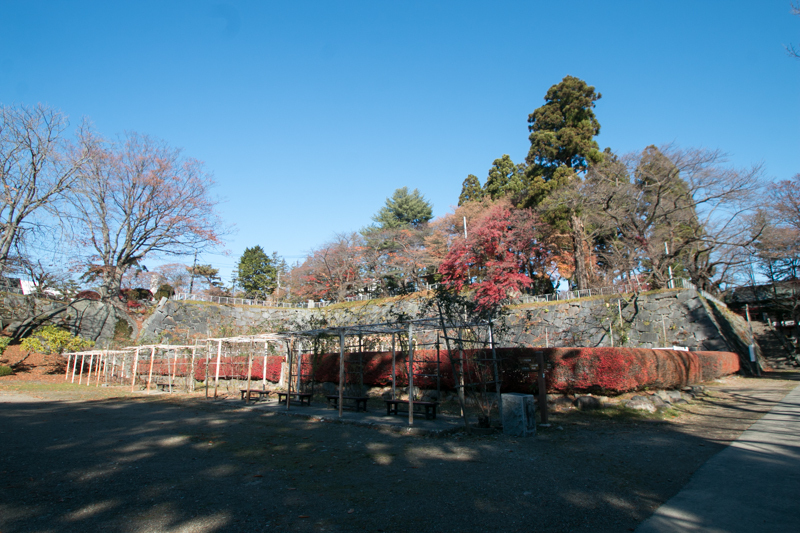 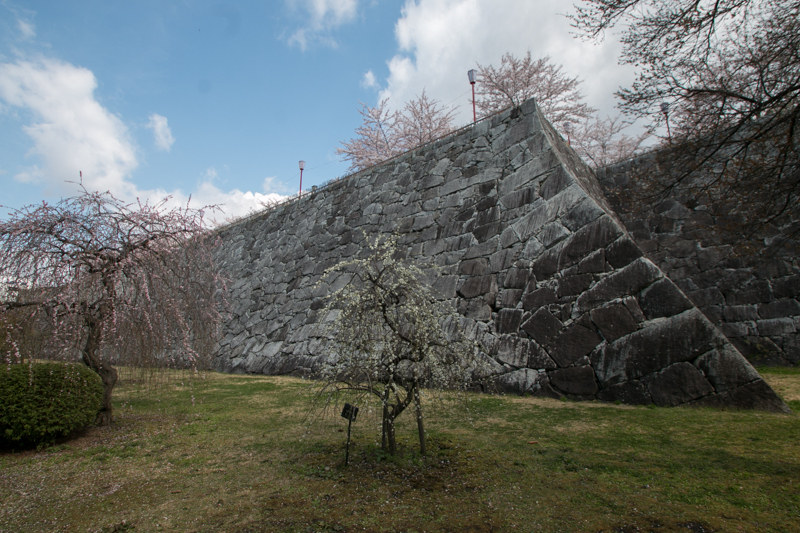 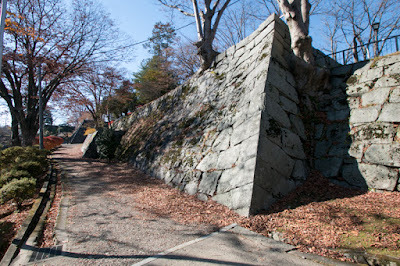 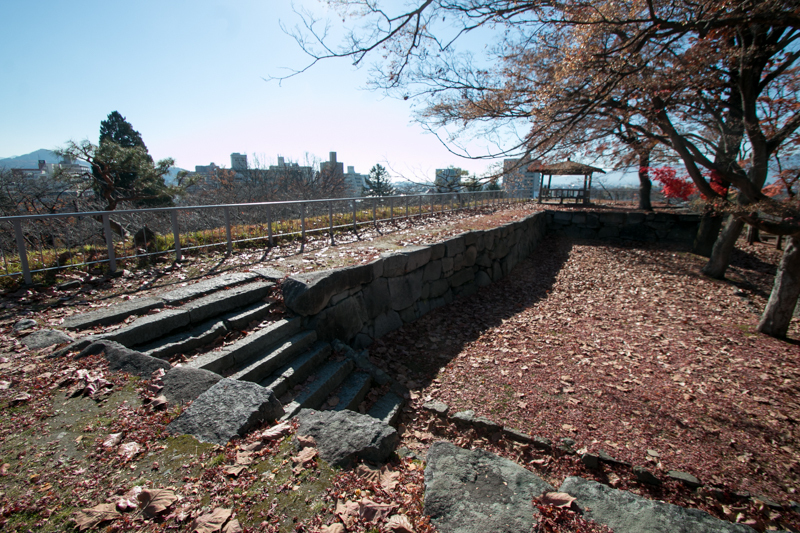 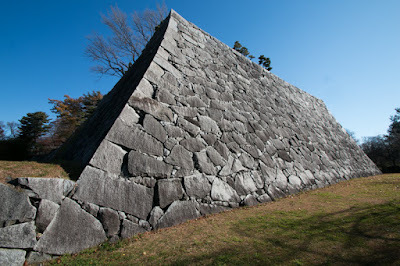 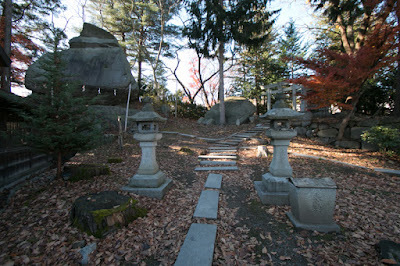 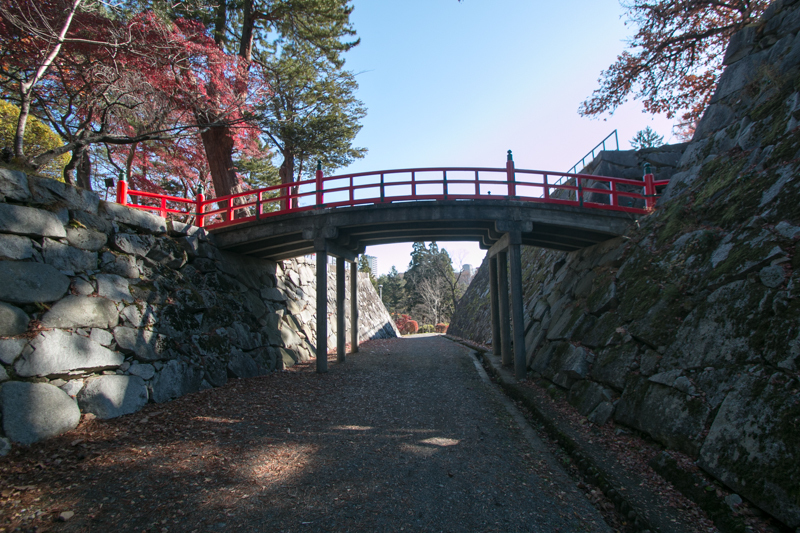 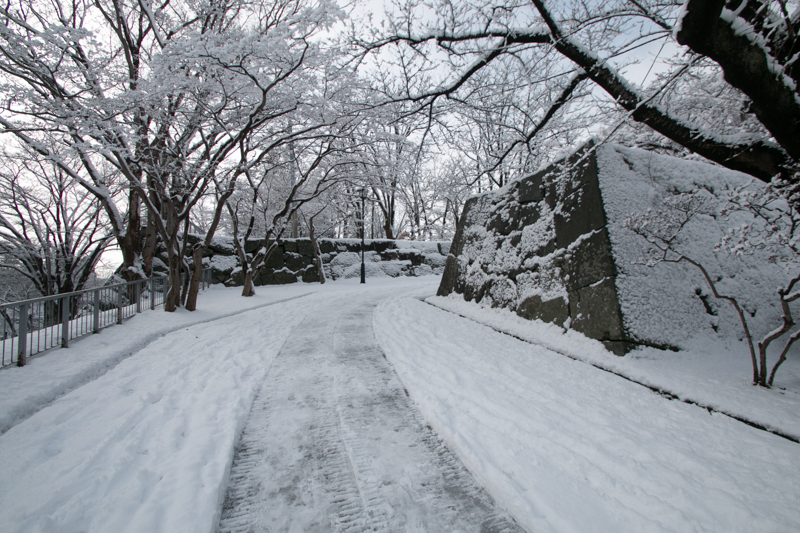 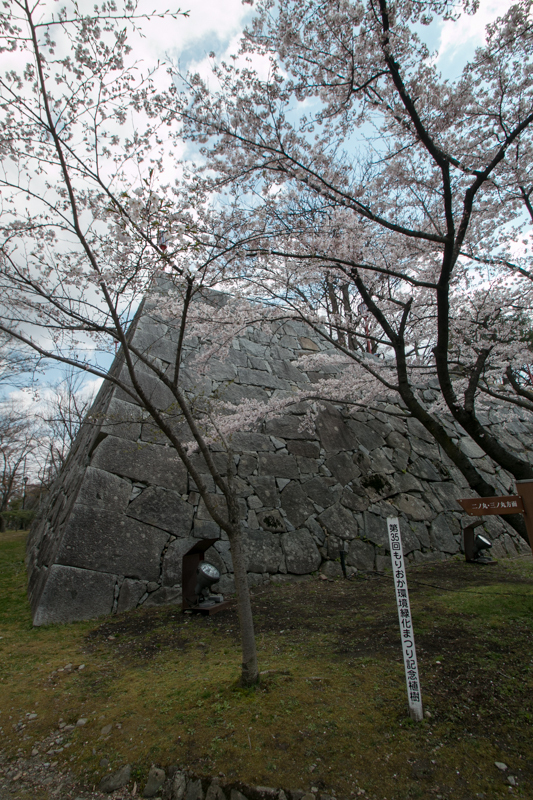 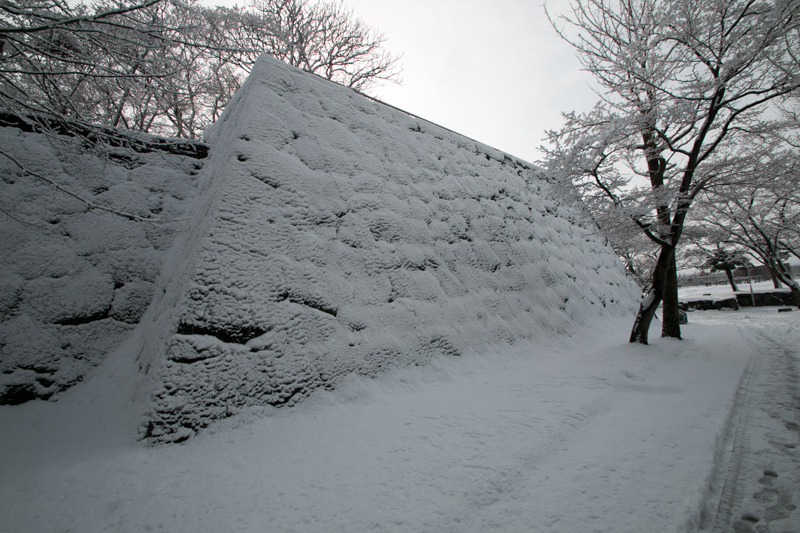 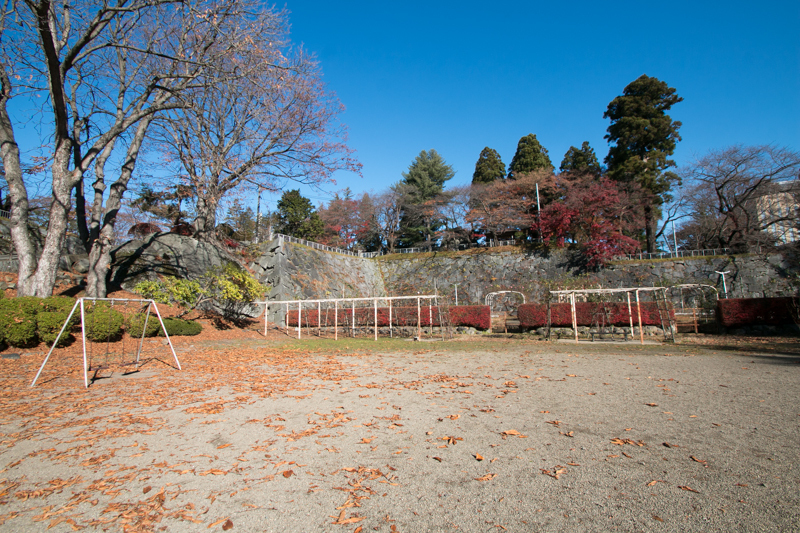 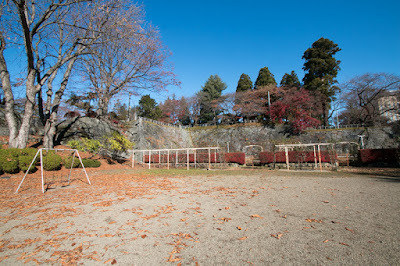 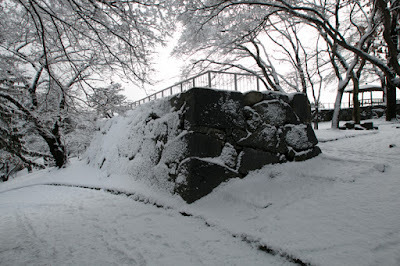 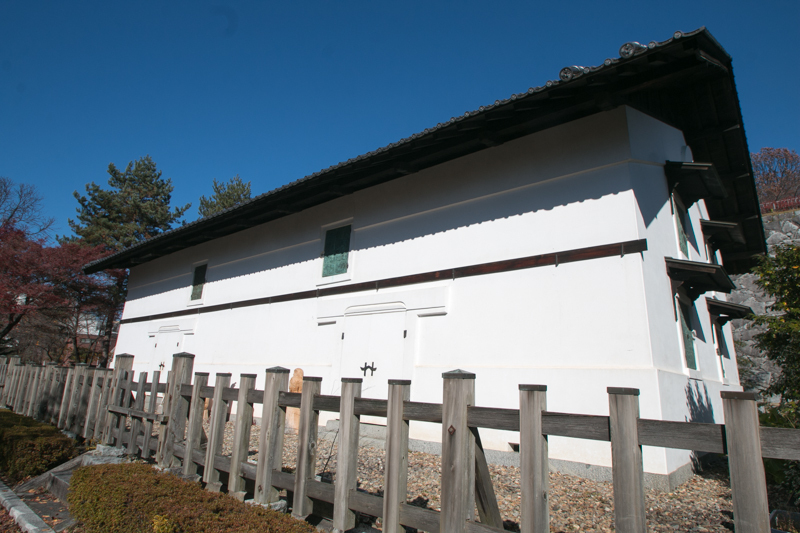 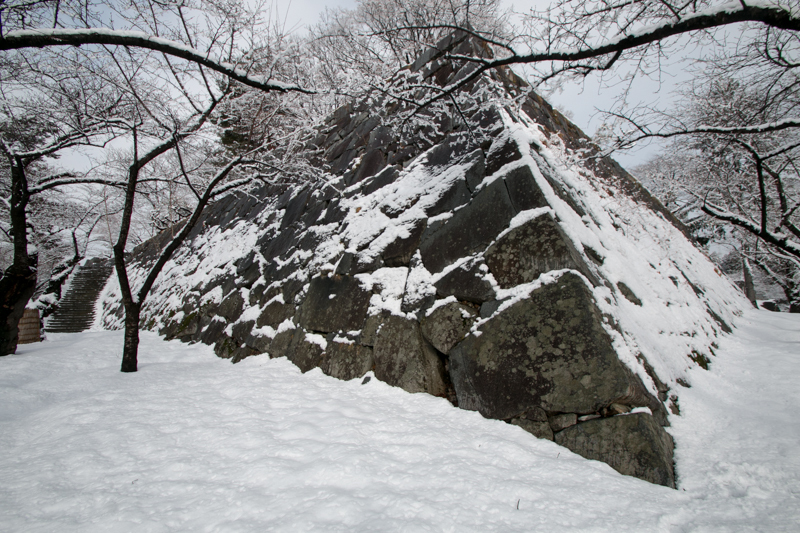 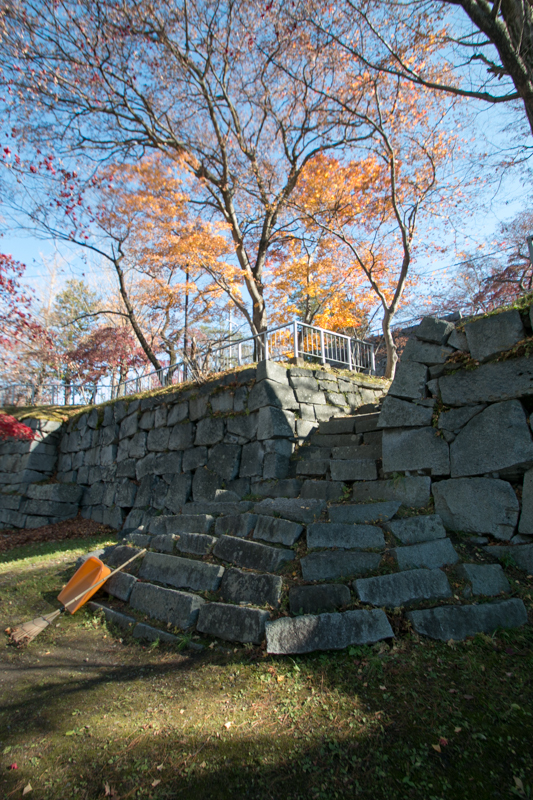 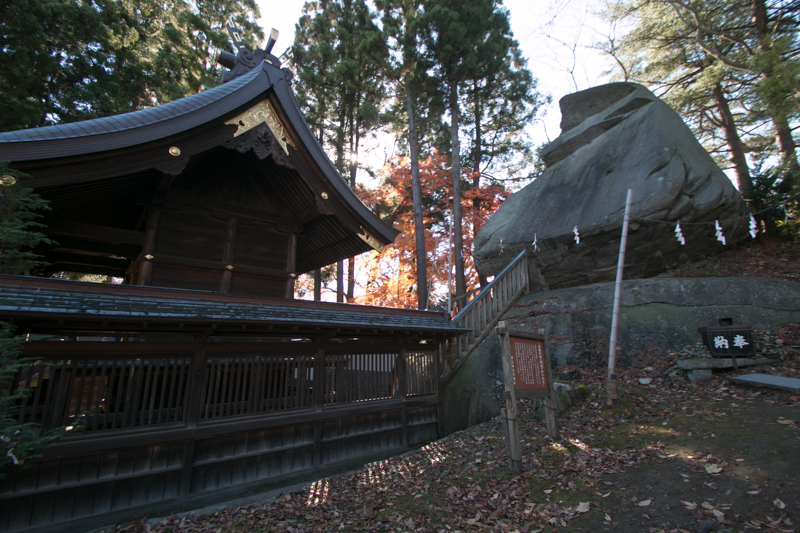 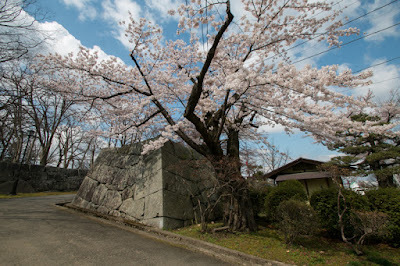 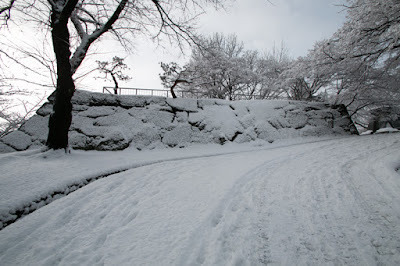 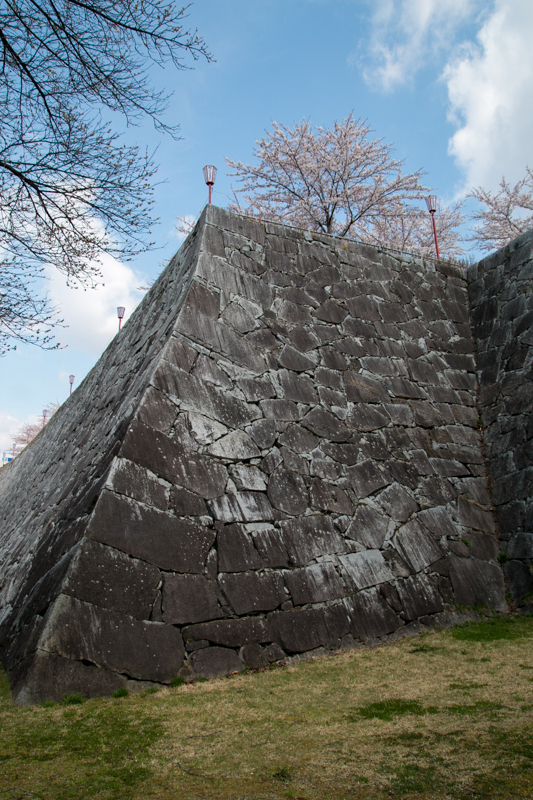 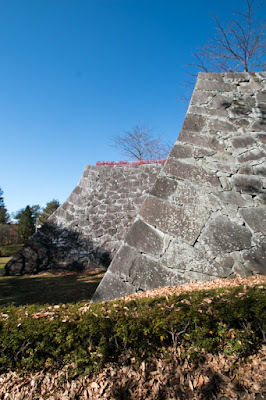 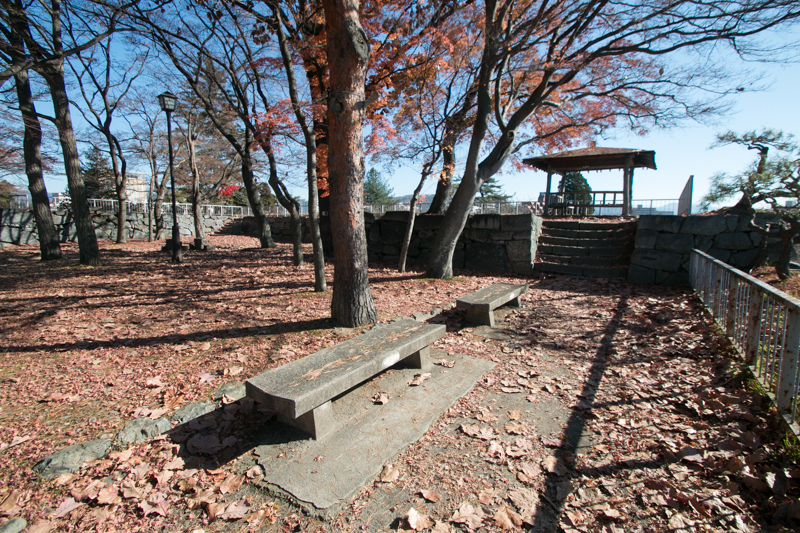 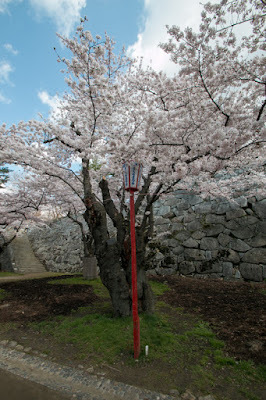 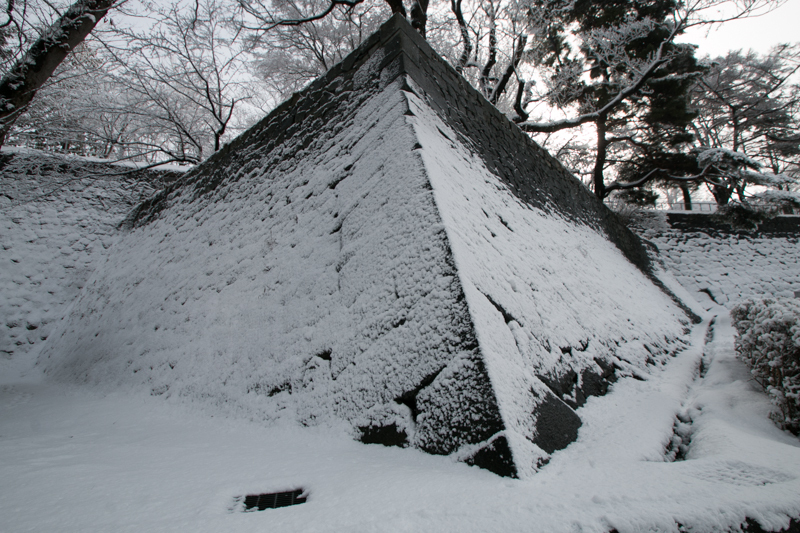 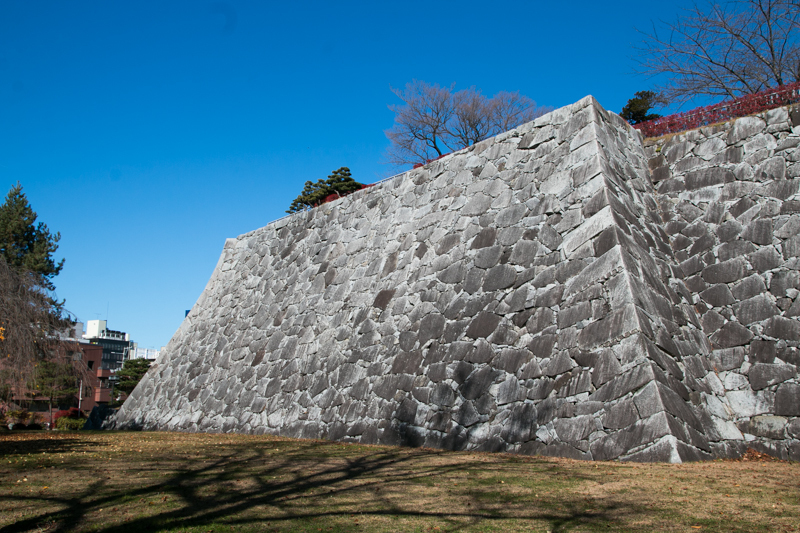 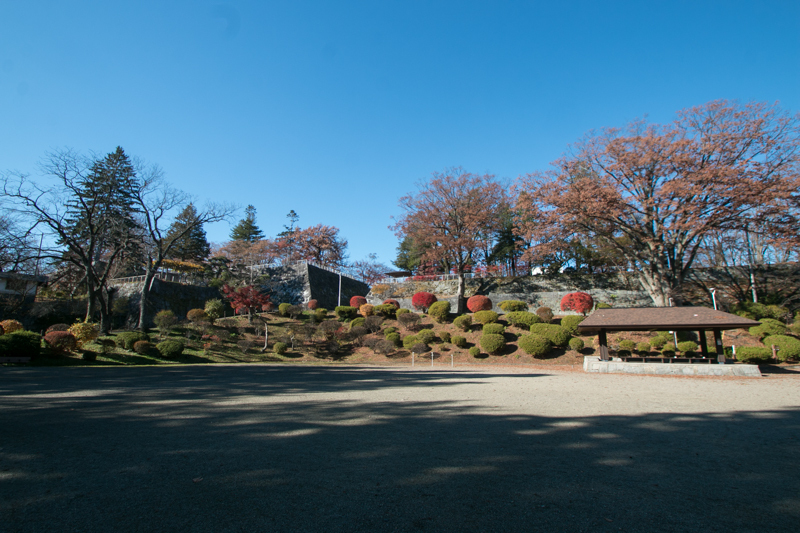 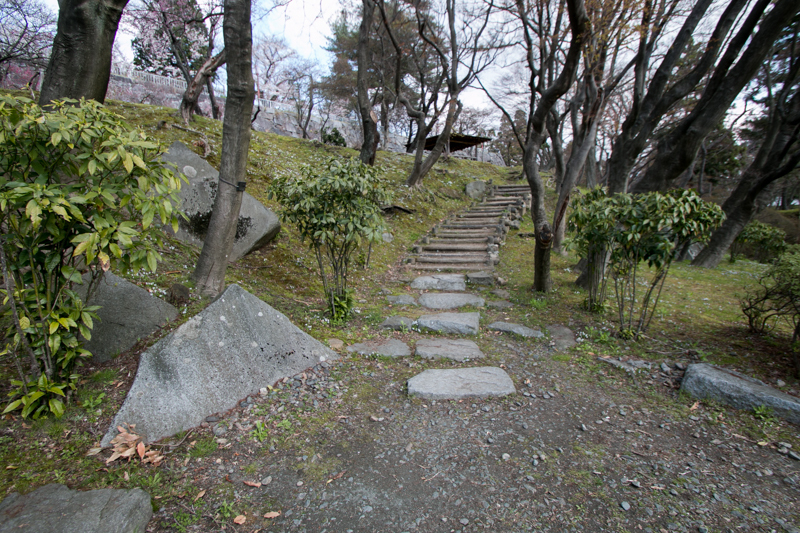 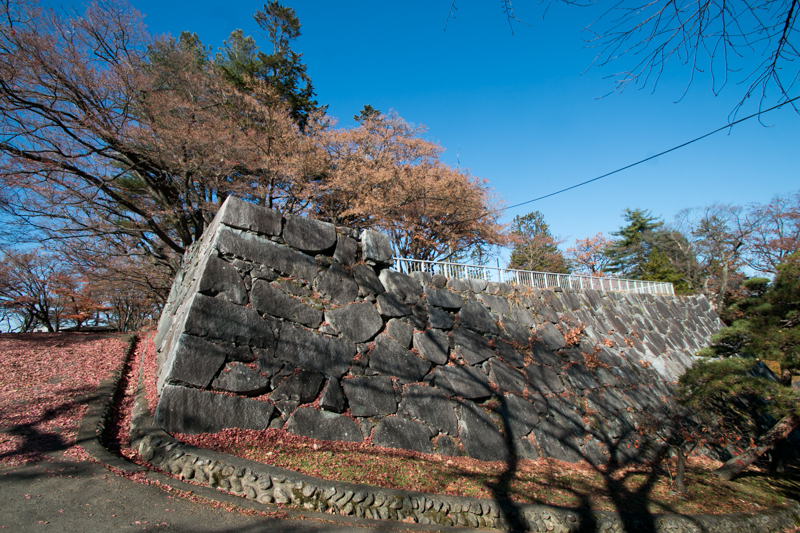 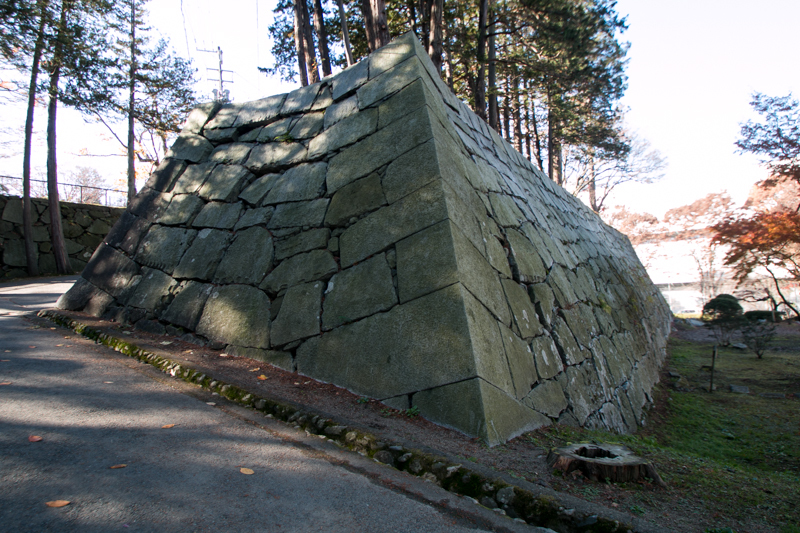 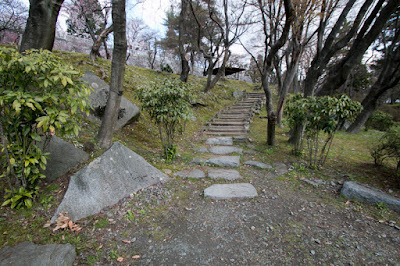 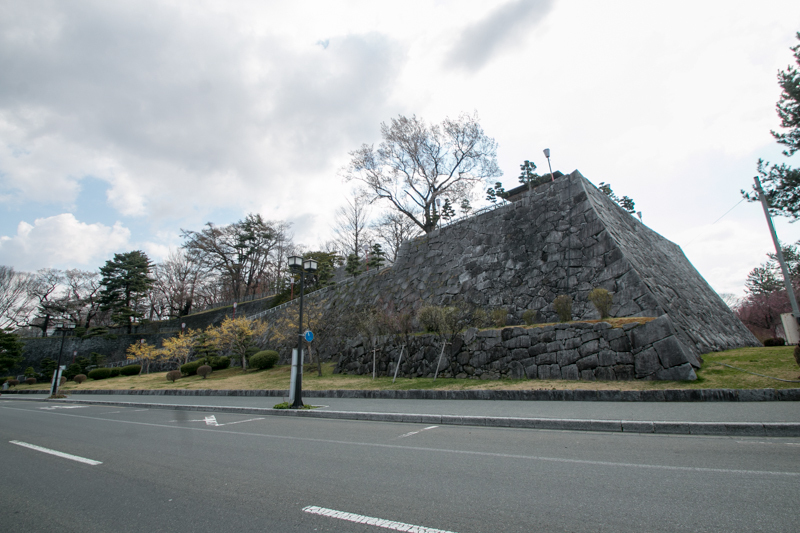 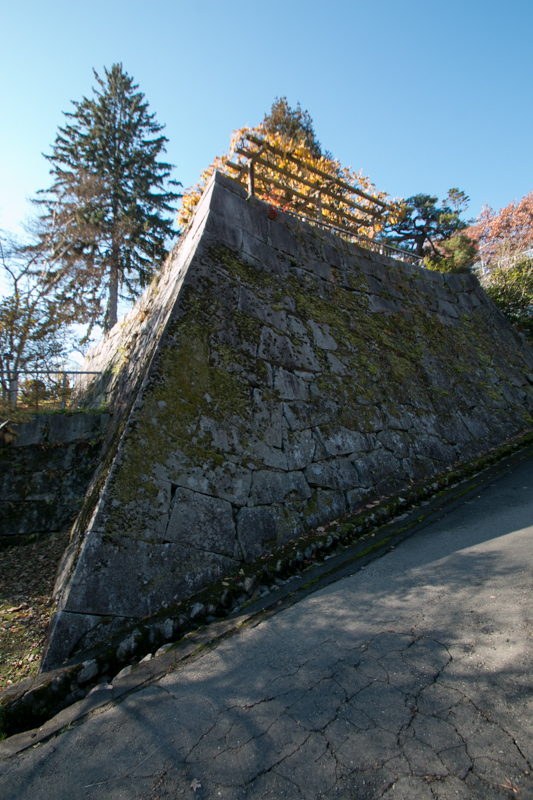 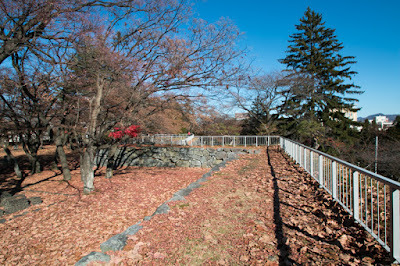 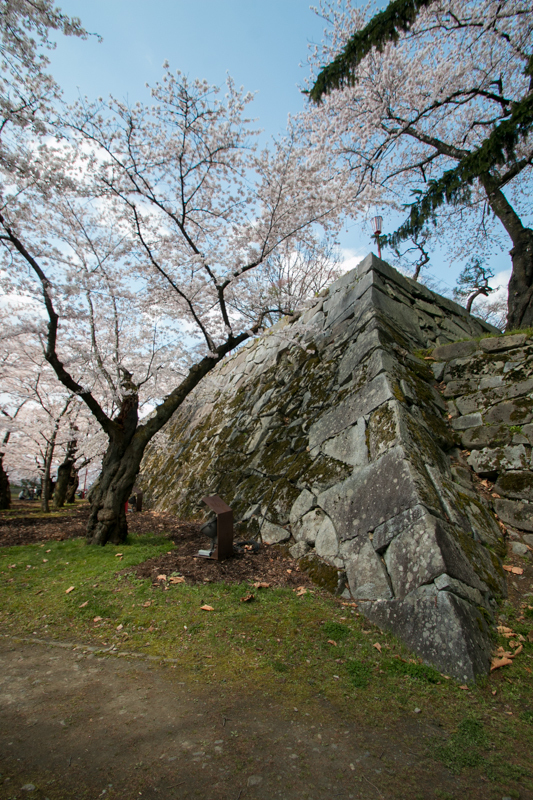 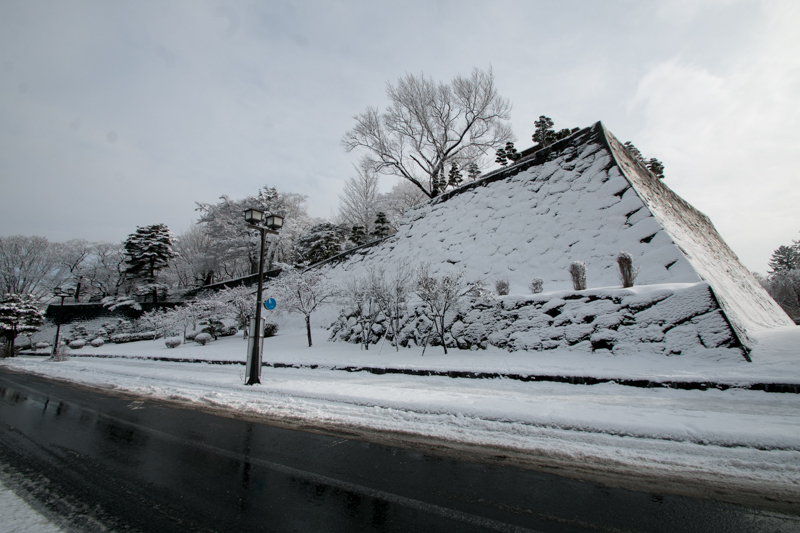 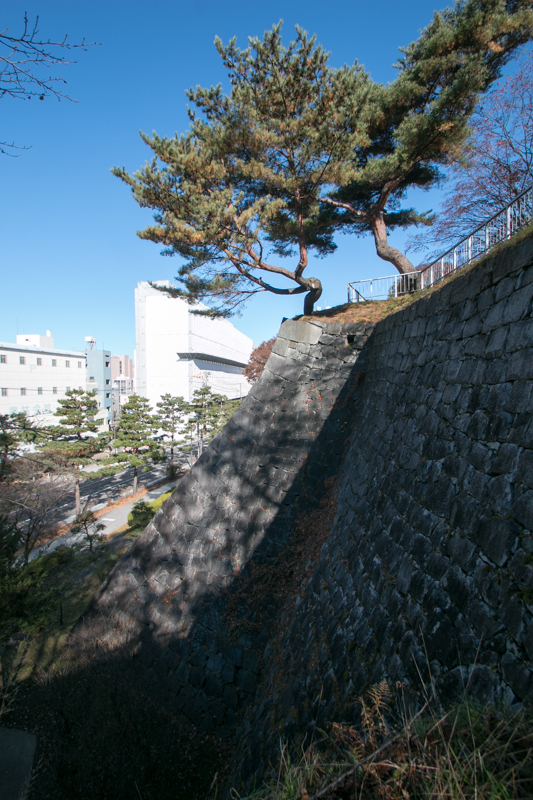 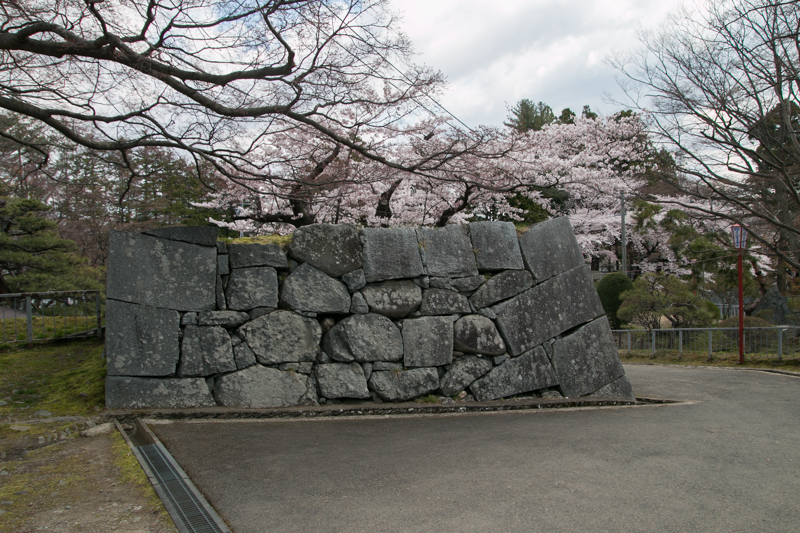 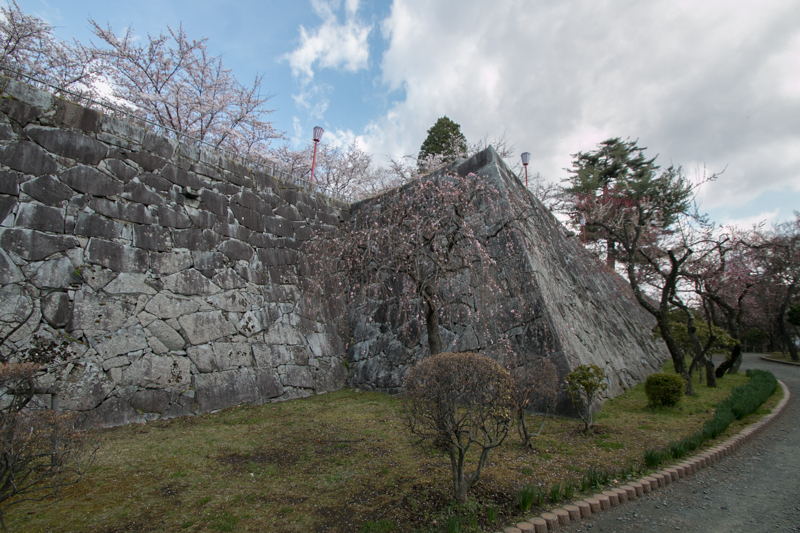 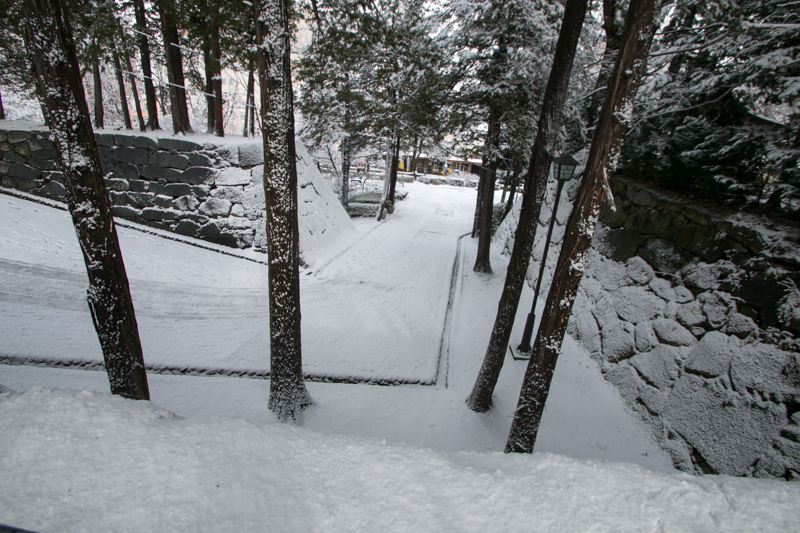 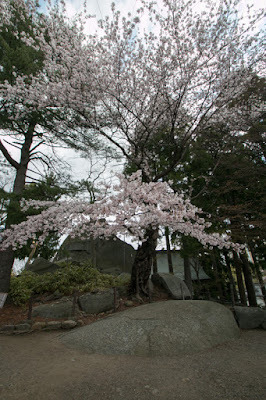 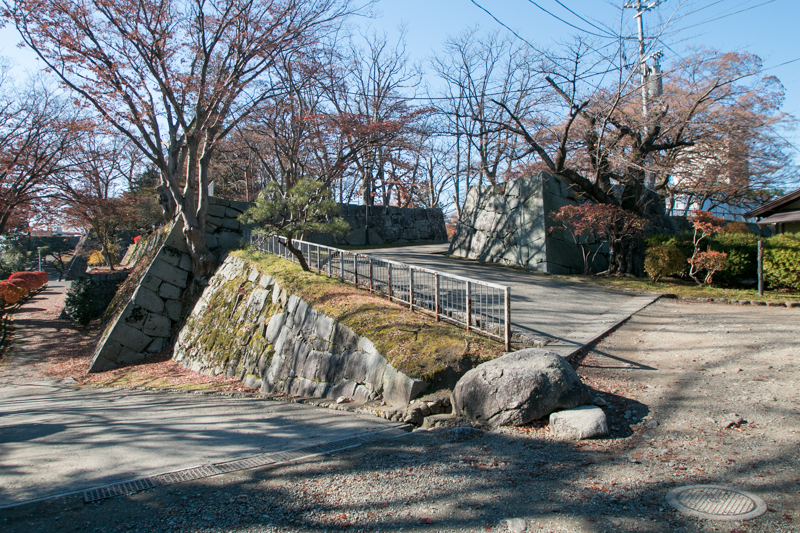 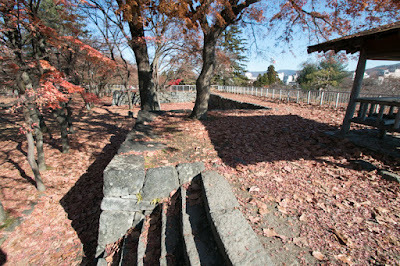 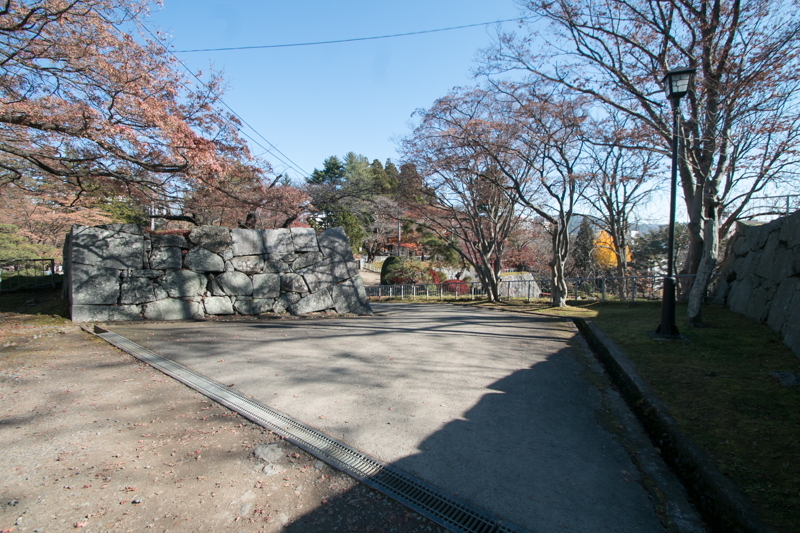 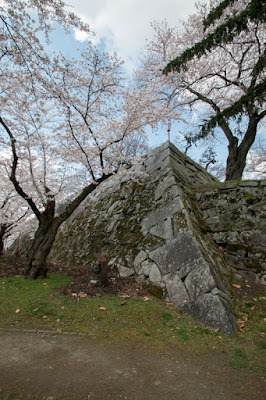 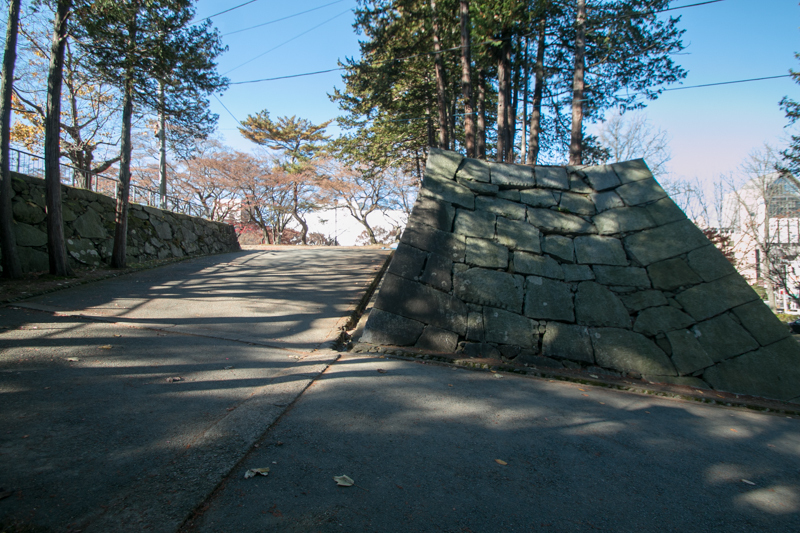 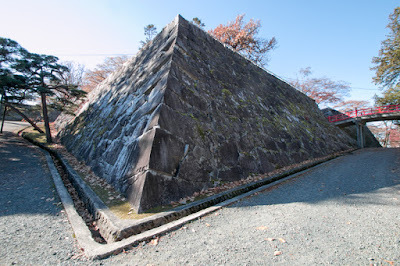 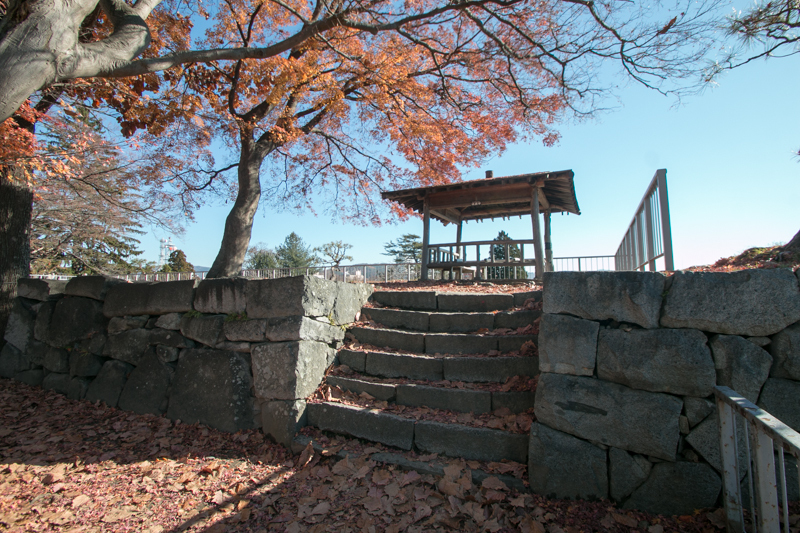 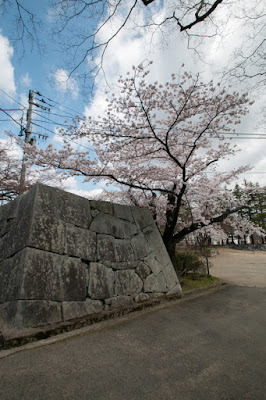 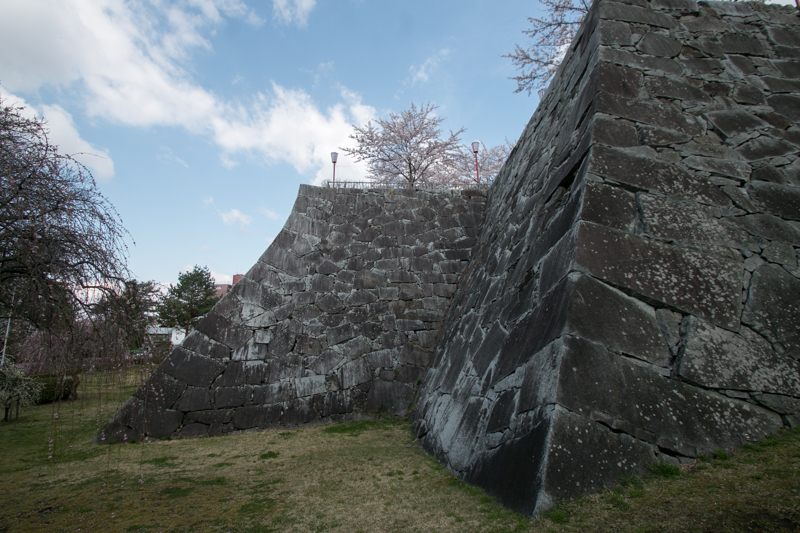 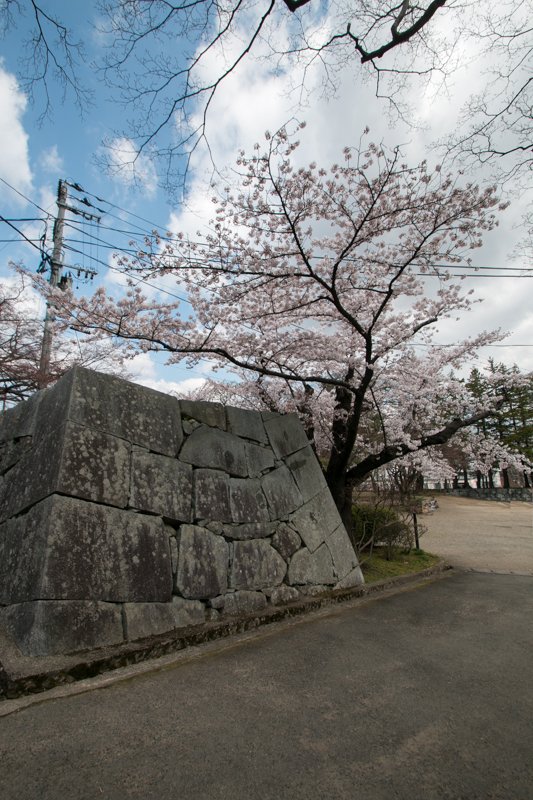 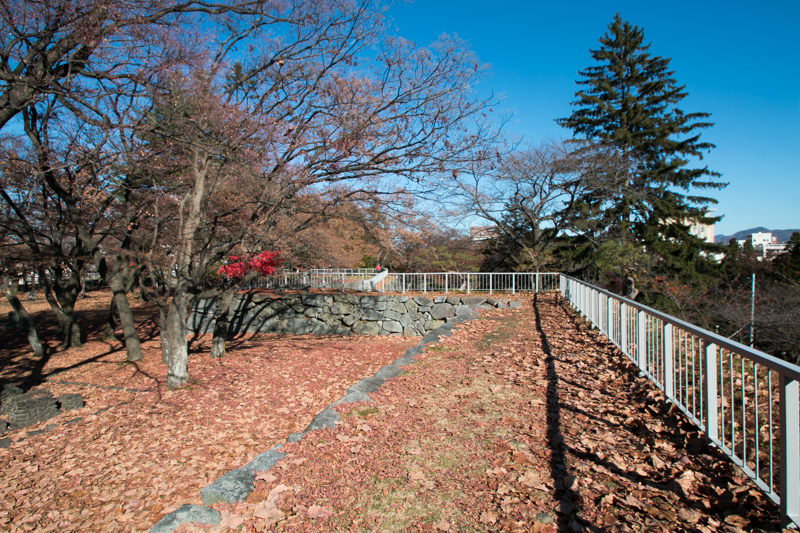 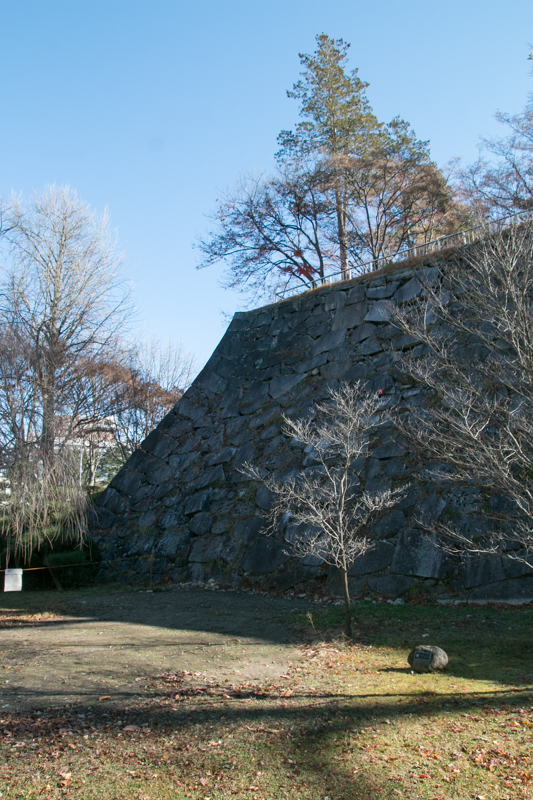 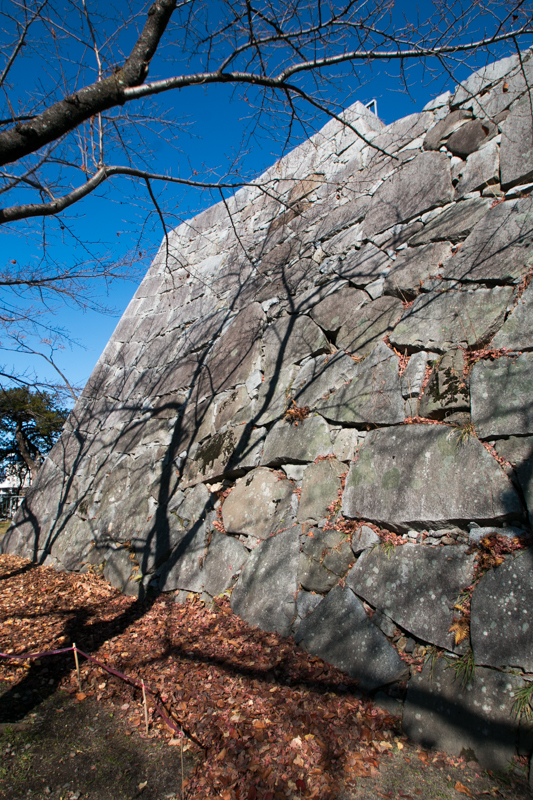 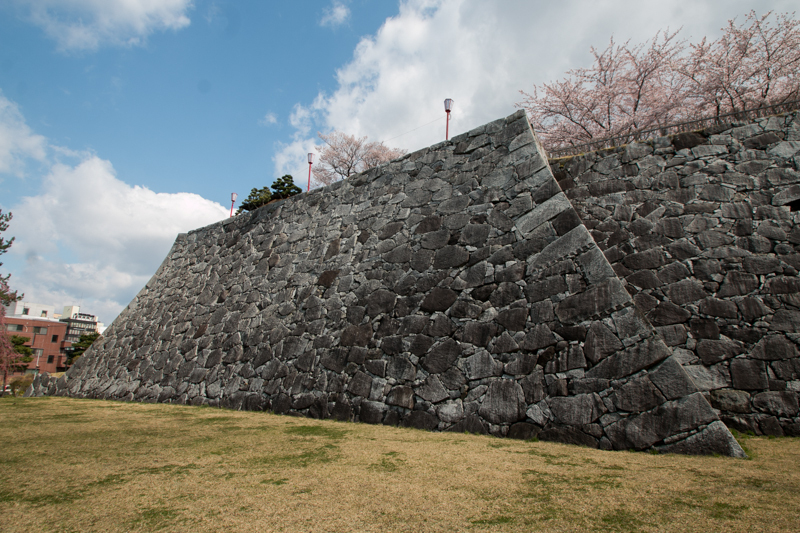 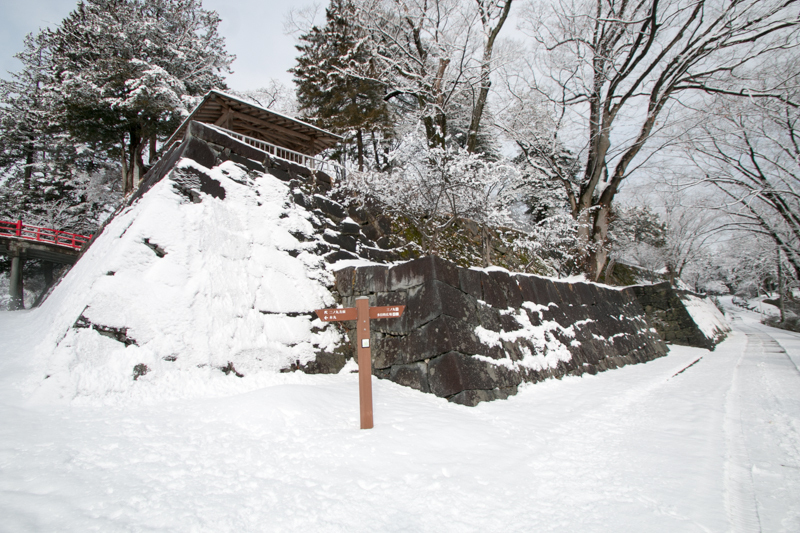 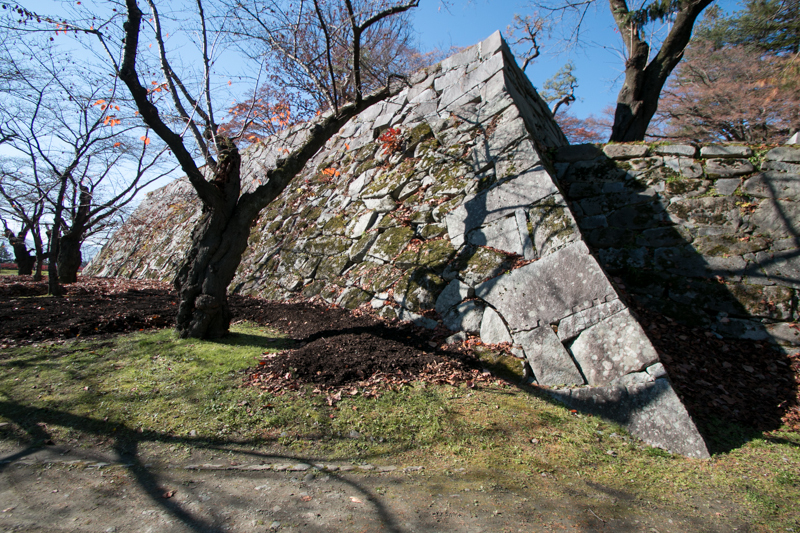 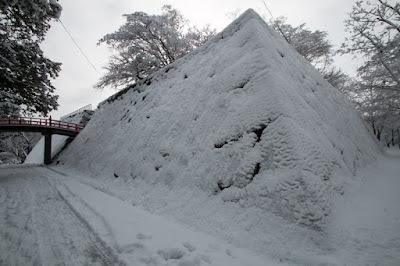 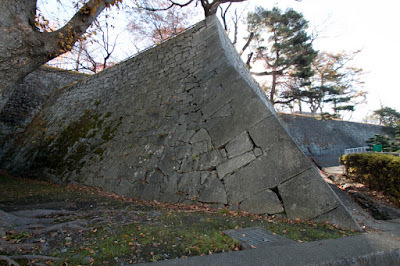 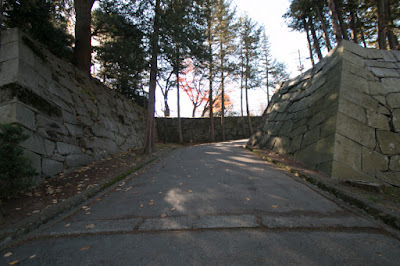 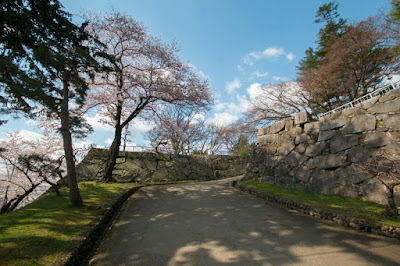 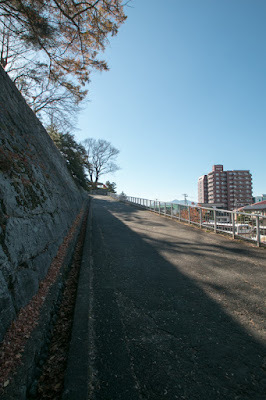 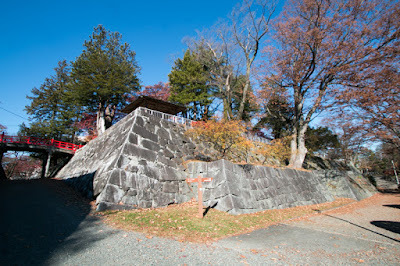 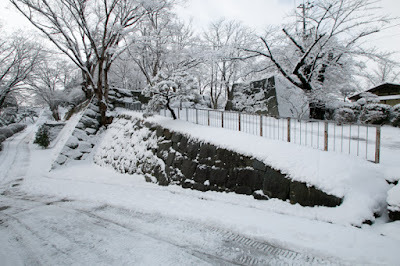 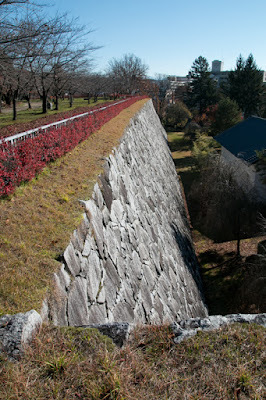 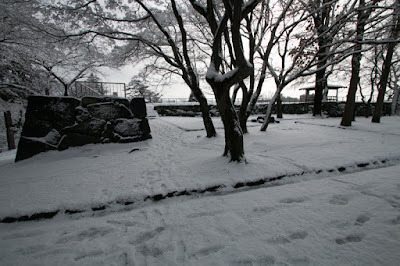 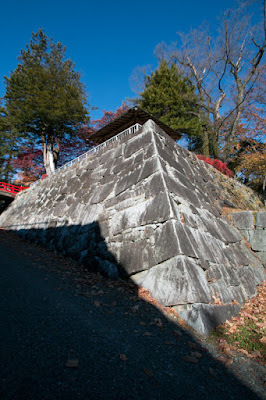 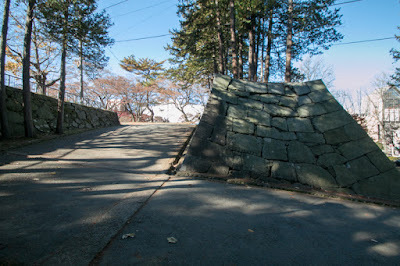 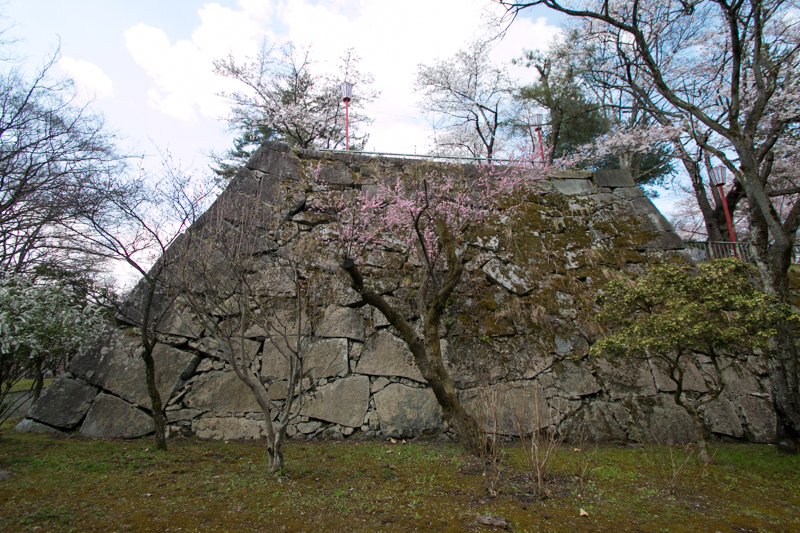 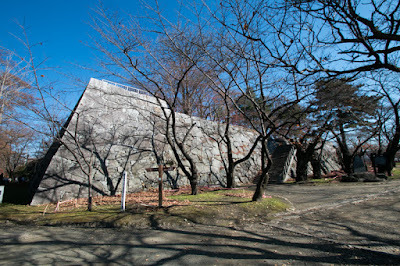 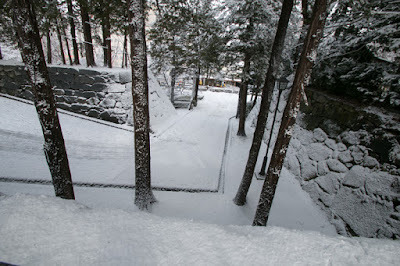 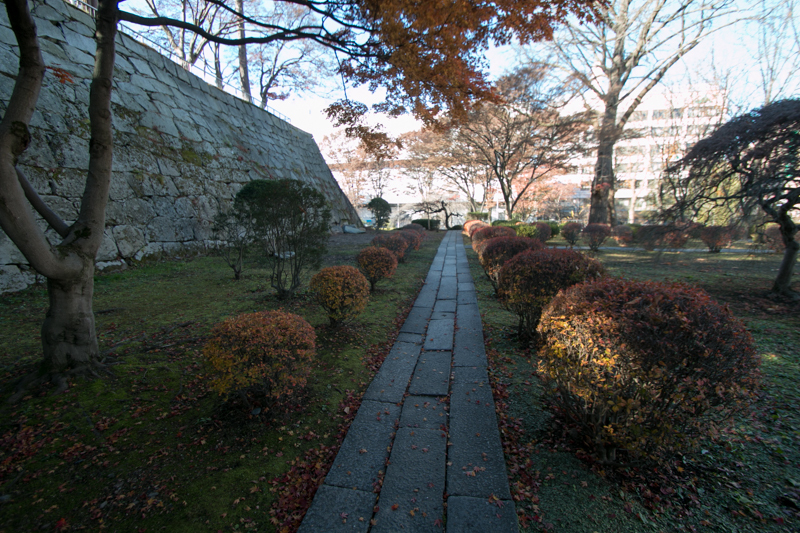 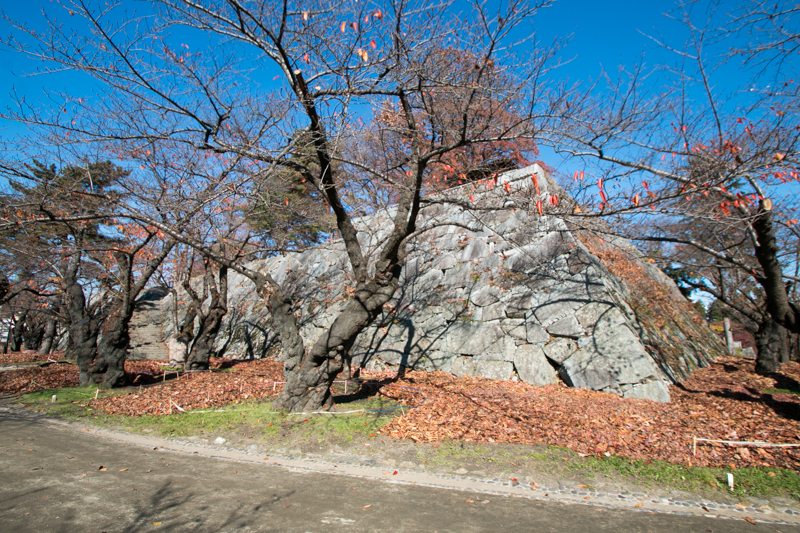 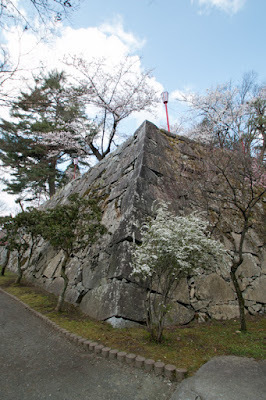 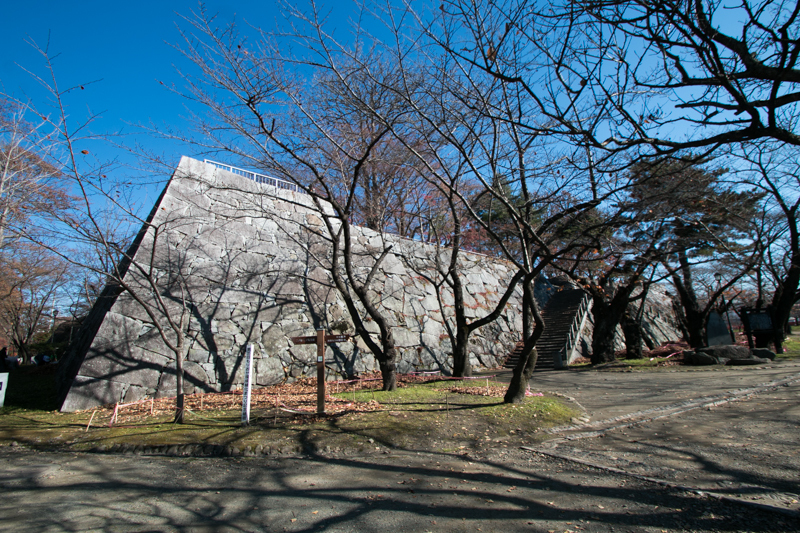 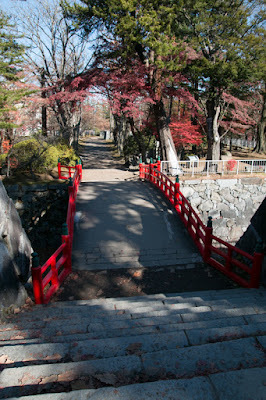 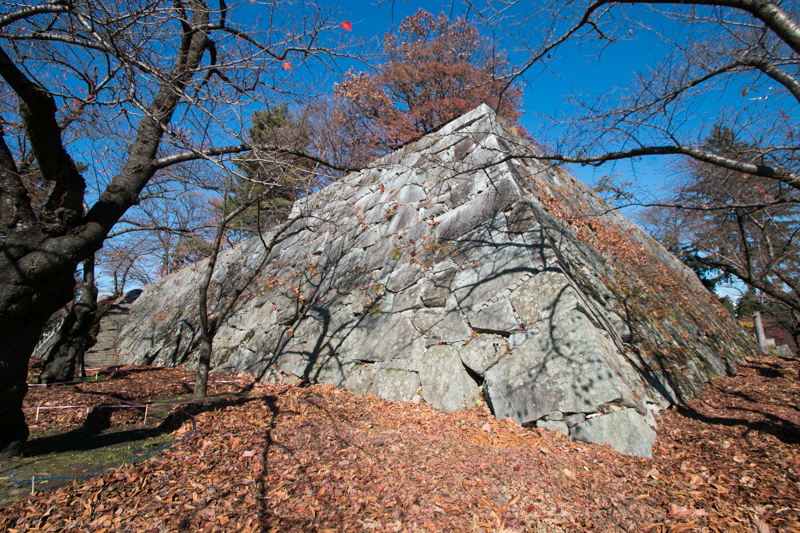 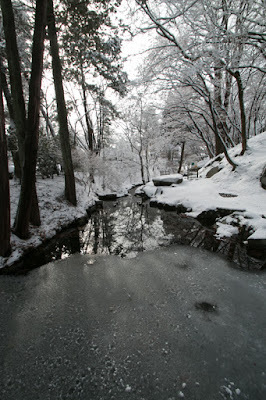 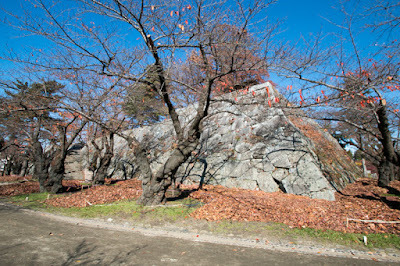 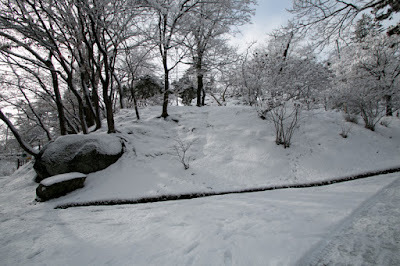 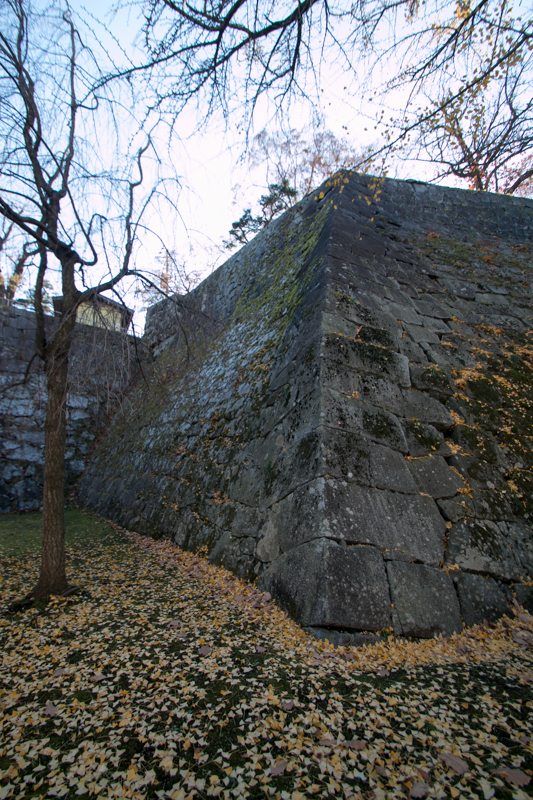 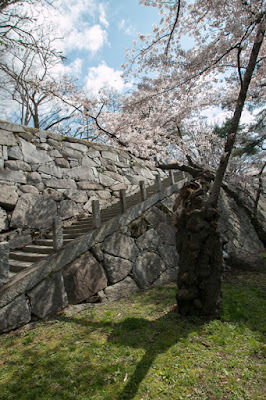 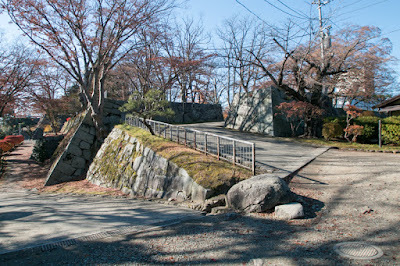 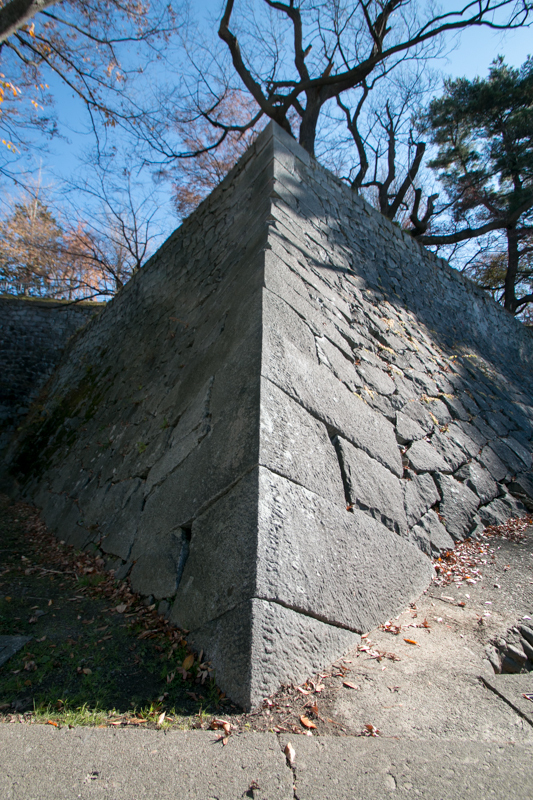 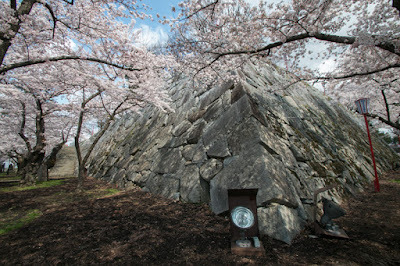 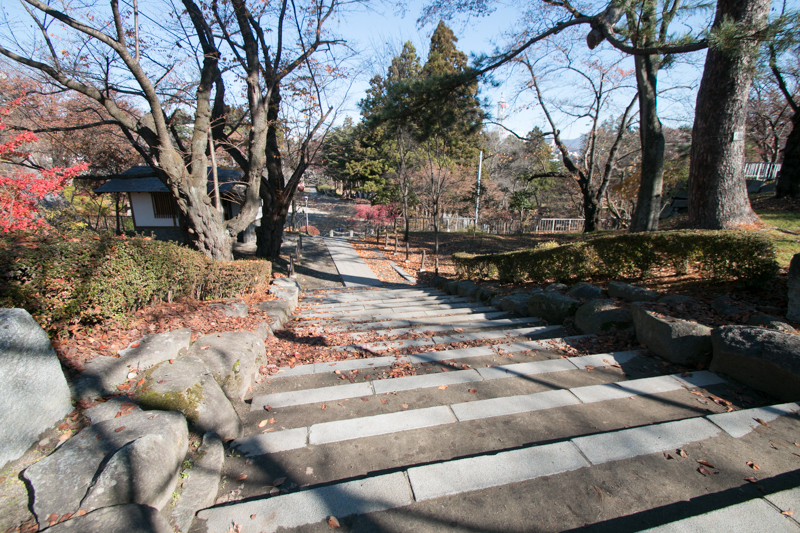 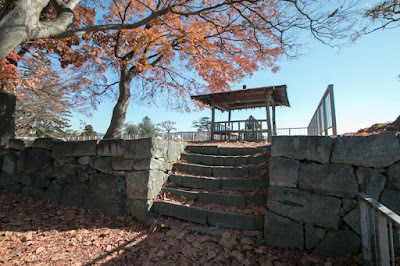 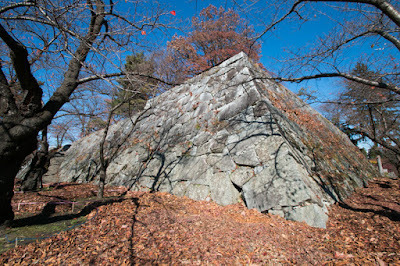 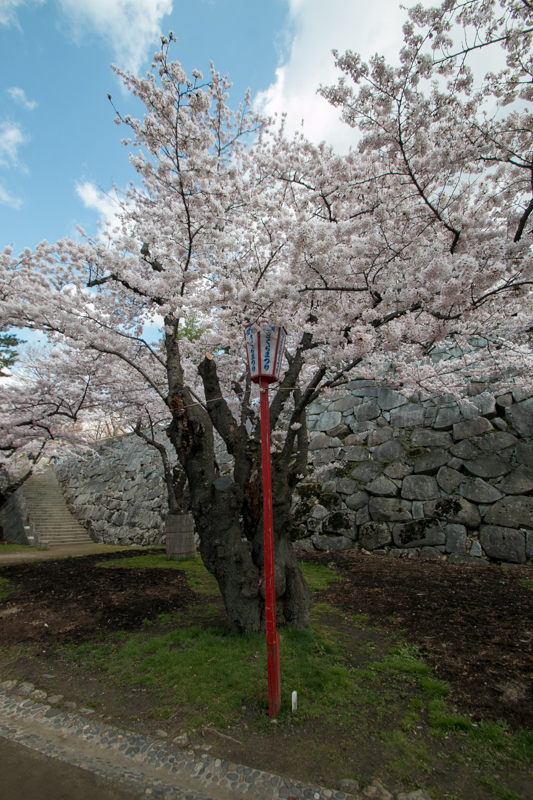 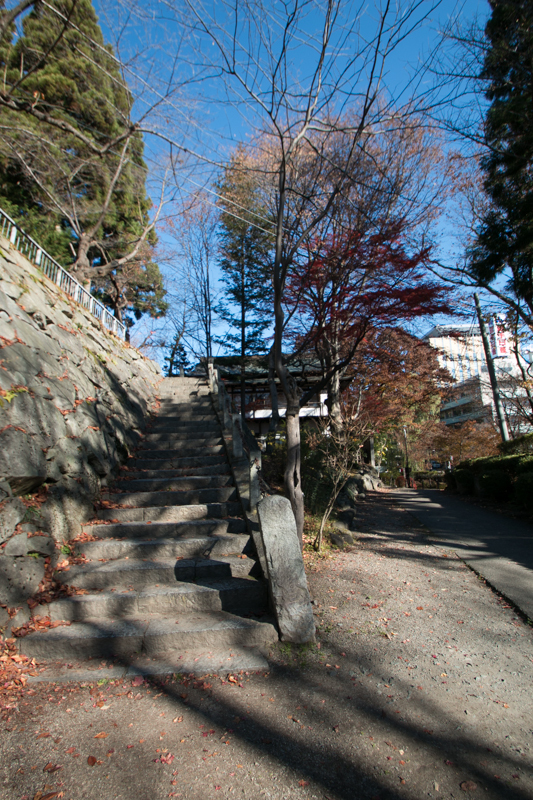 As Morioka area provides good granite stones, Morioka castle equipped stone wall at whole part. 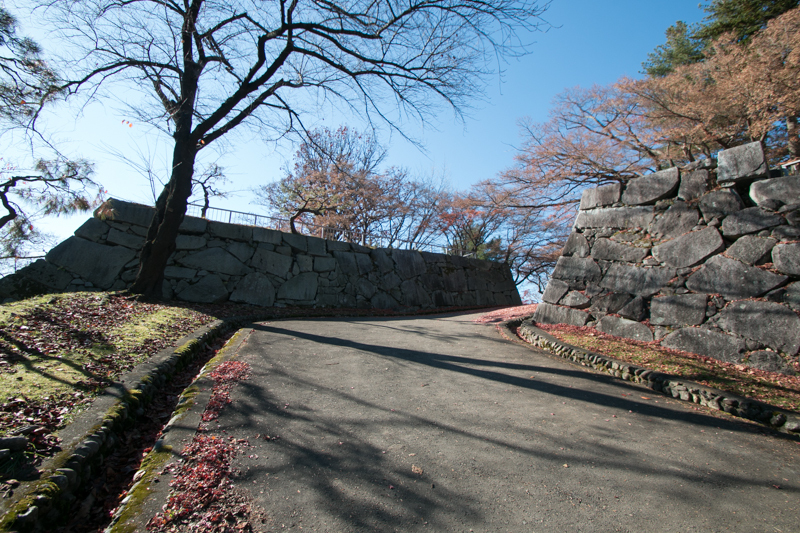 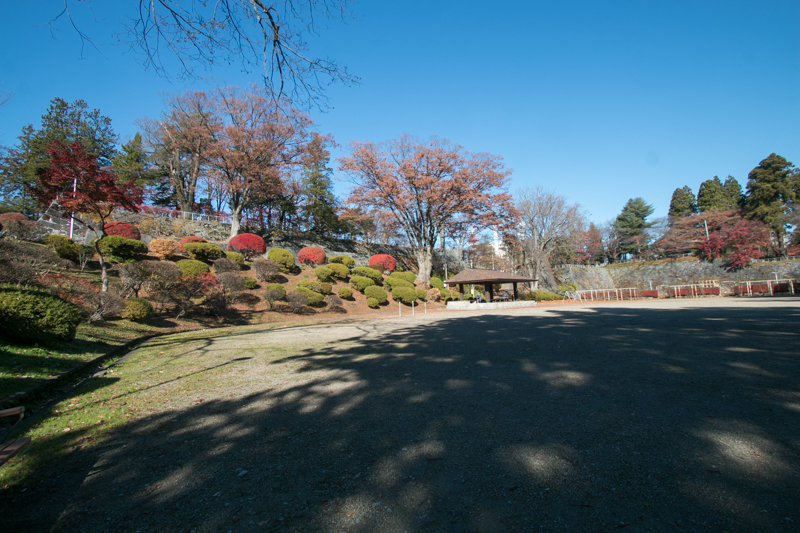 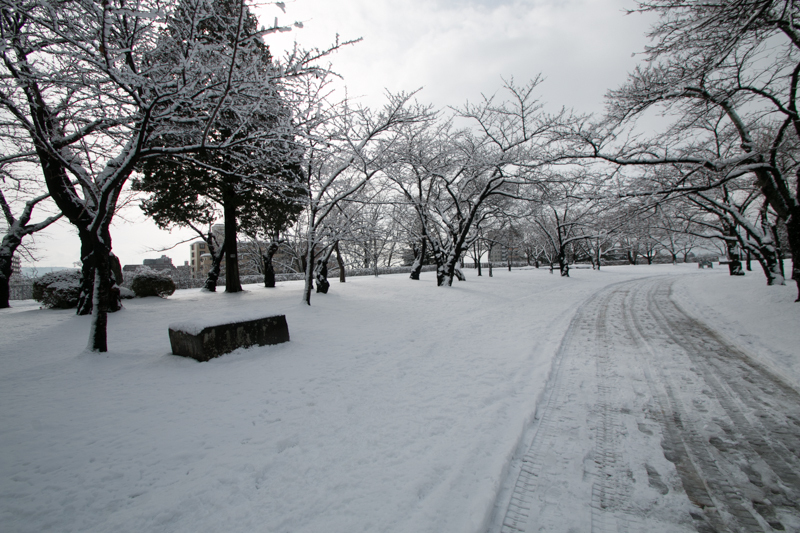 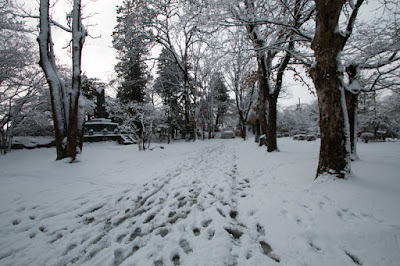 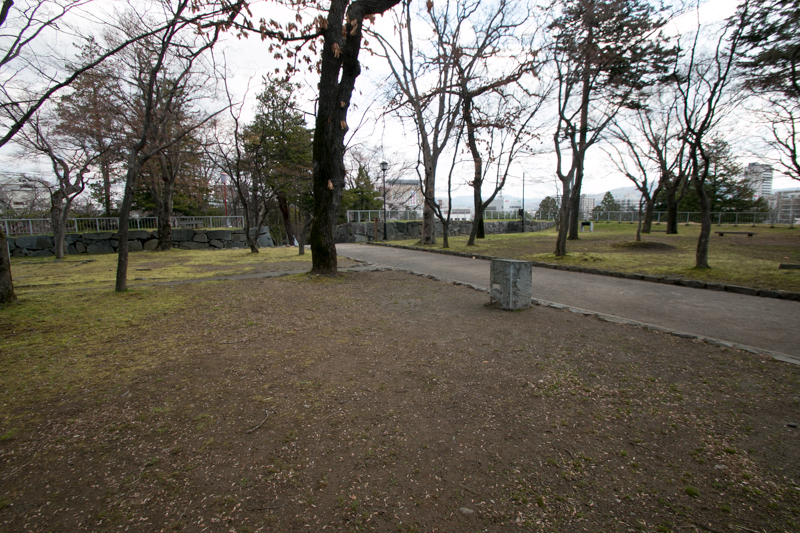 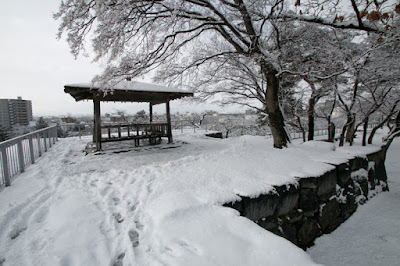 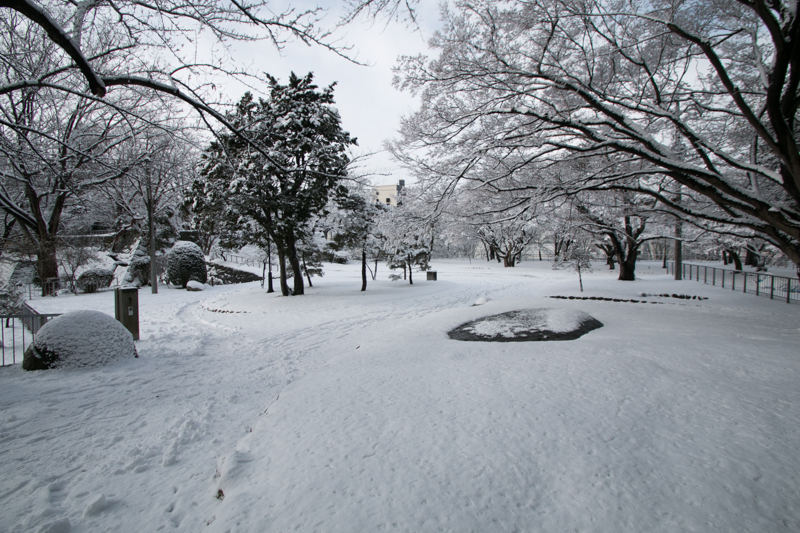 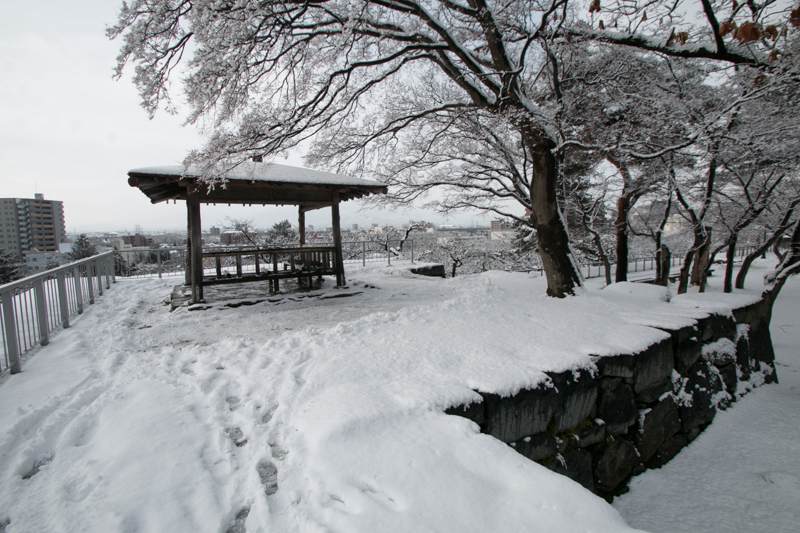 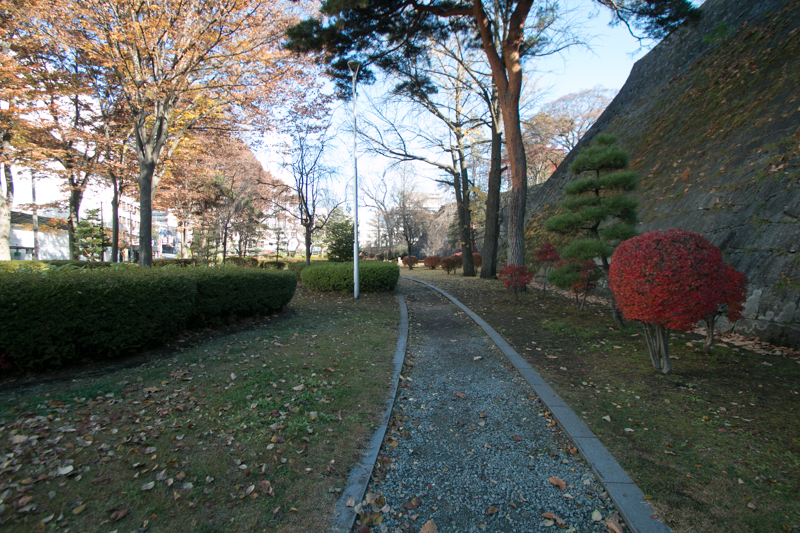 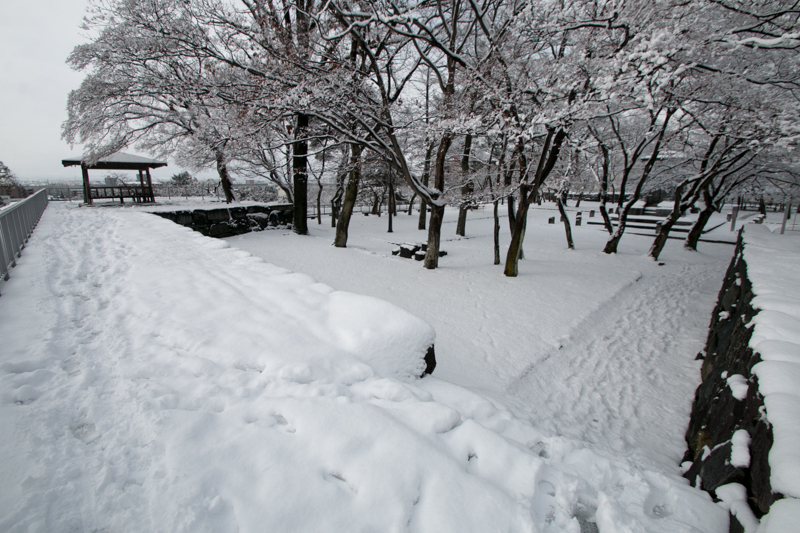 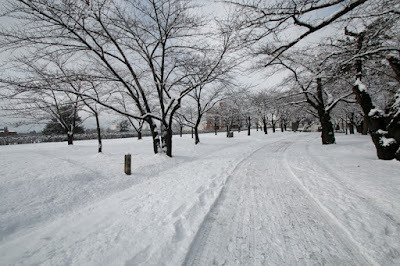 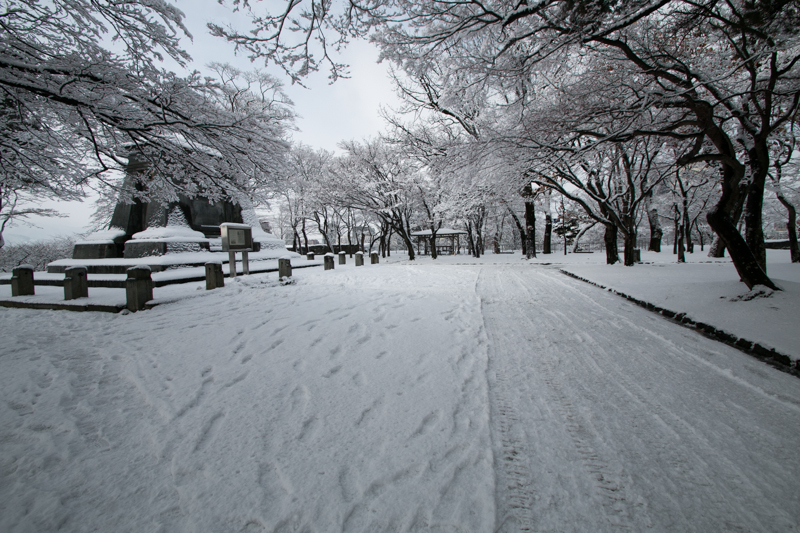 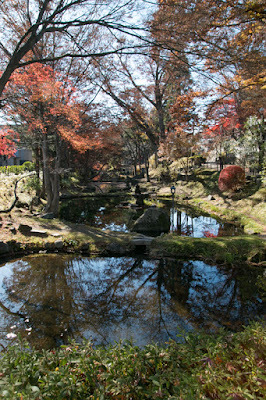 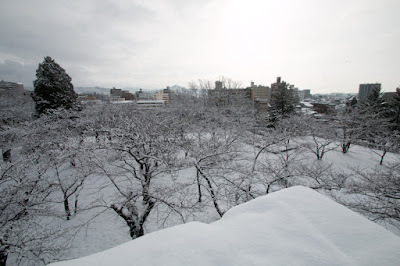 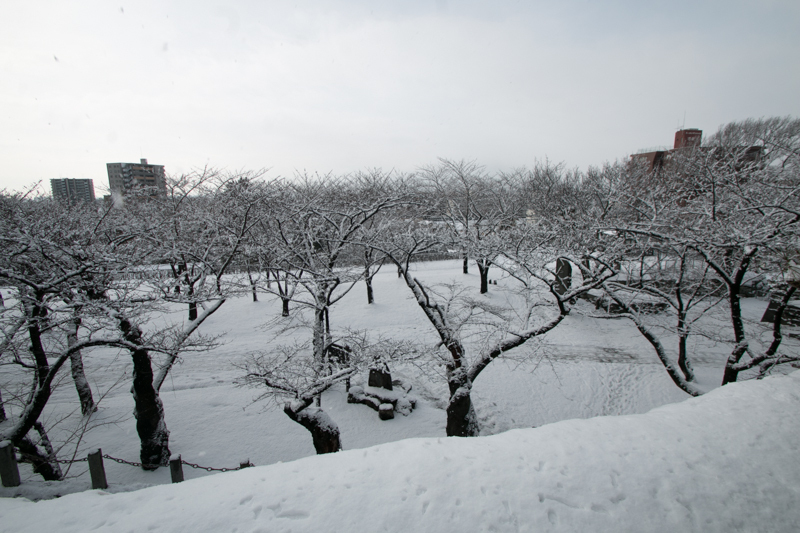 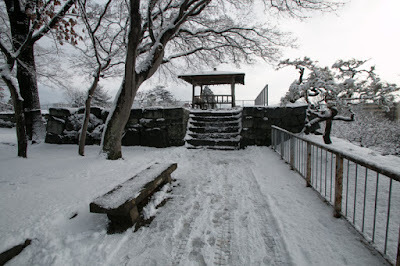 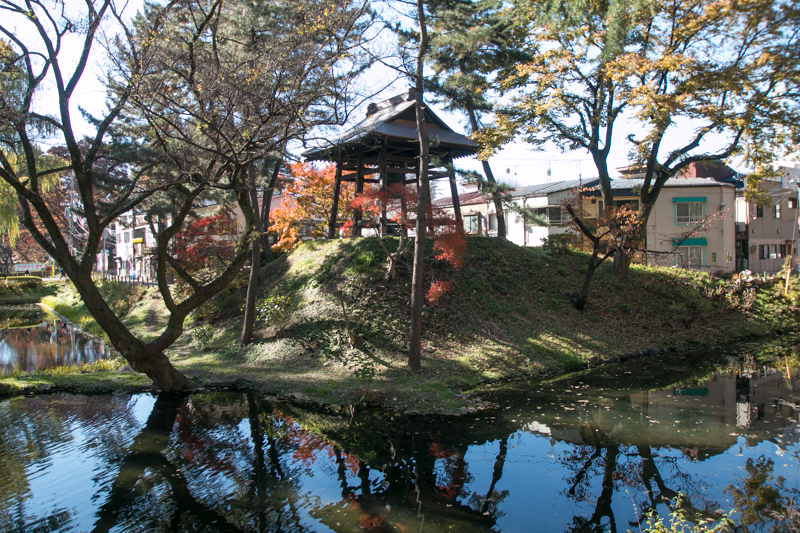 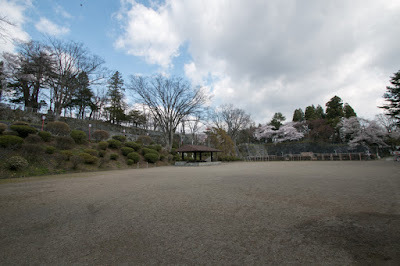 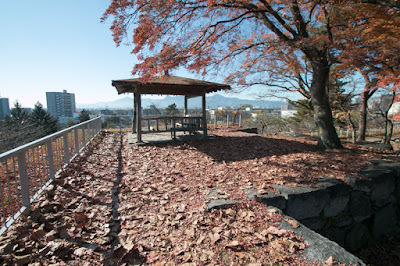 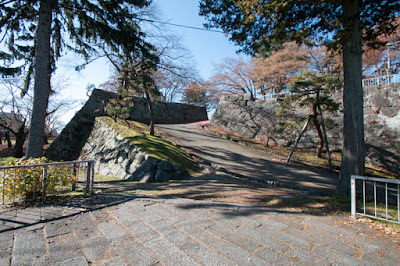 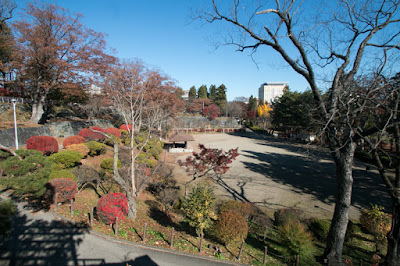 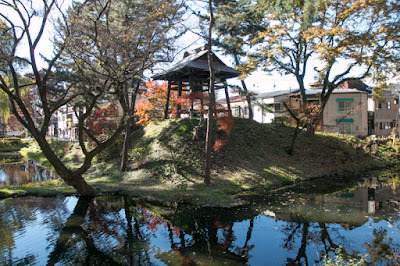 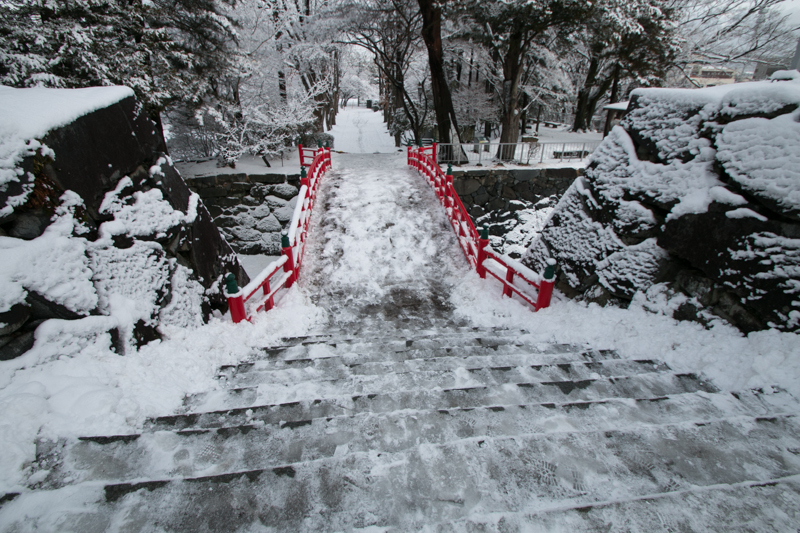 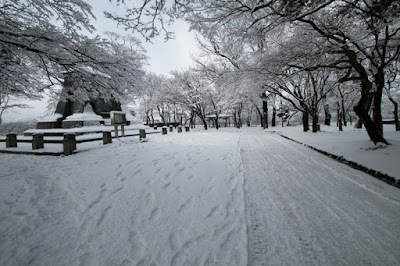 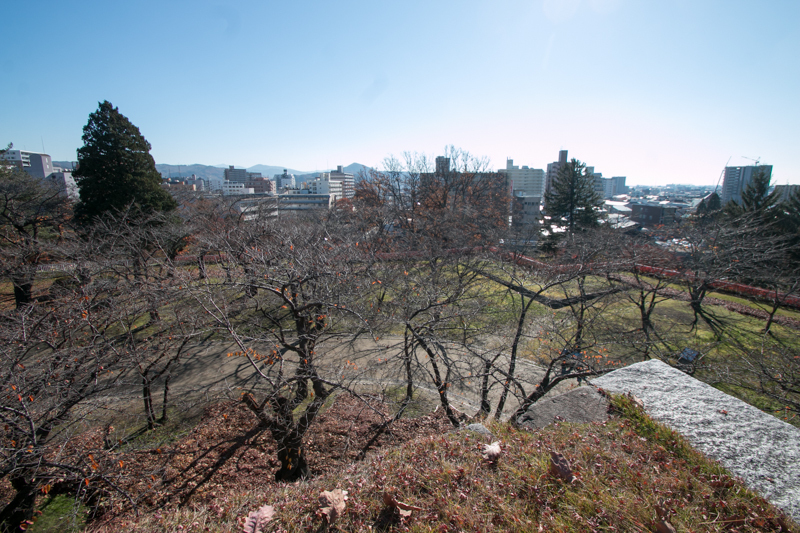 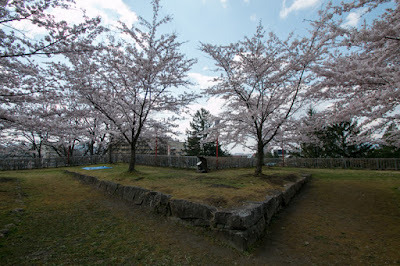 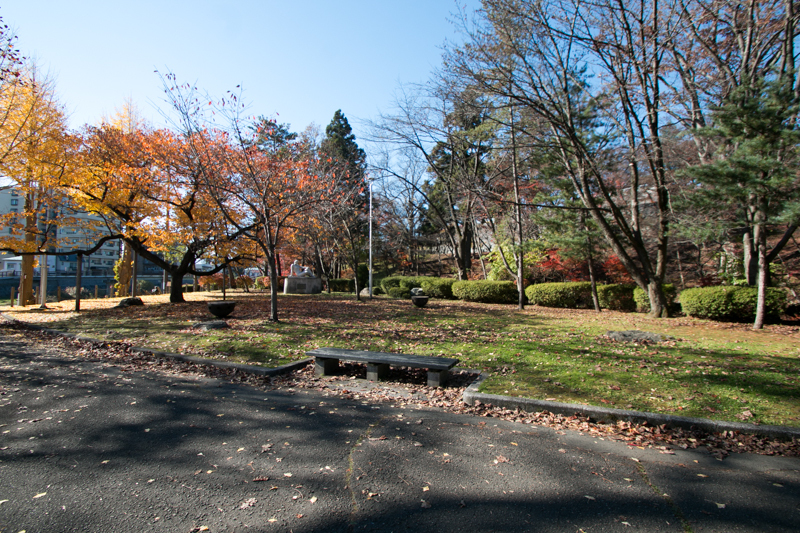 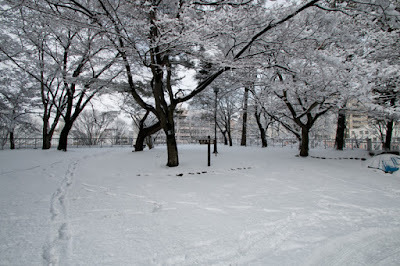 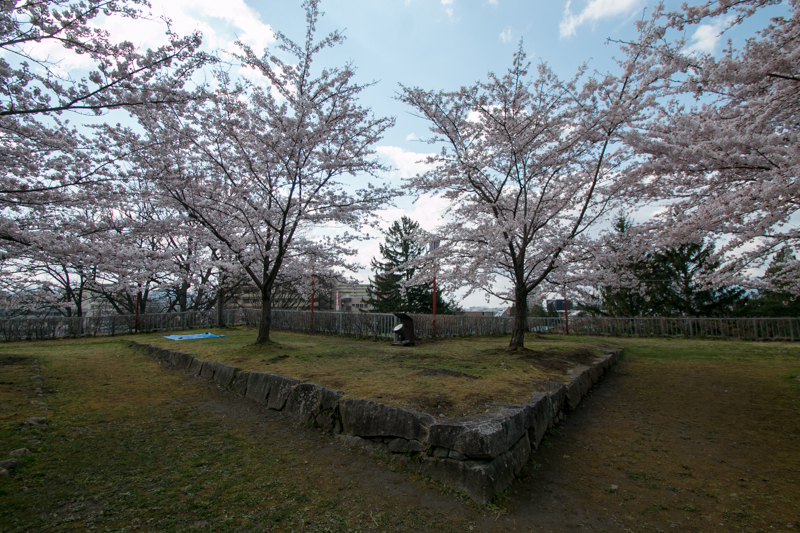 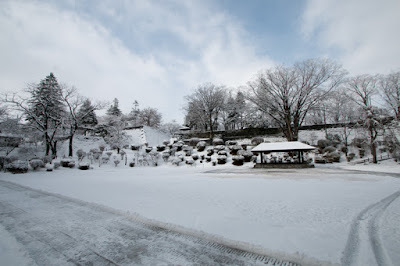 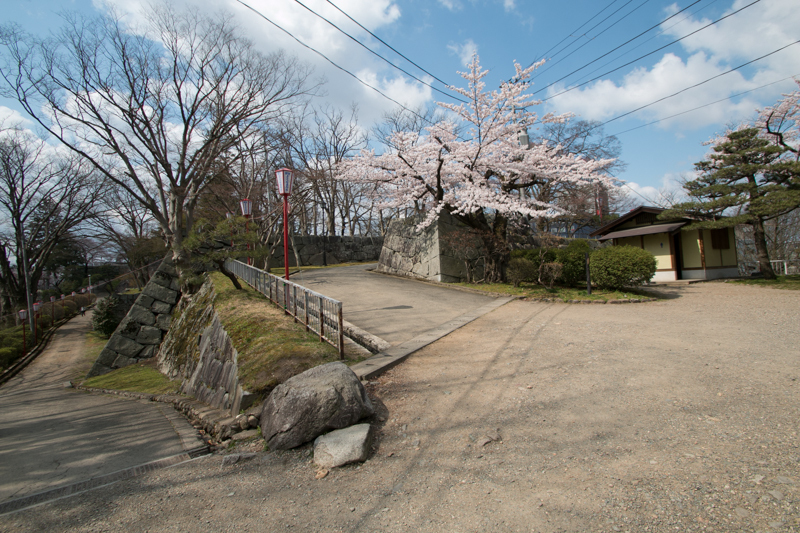 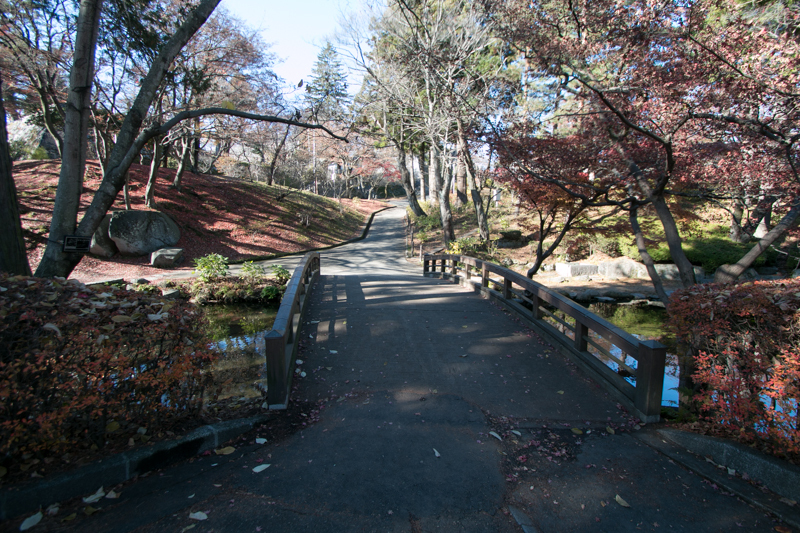 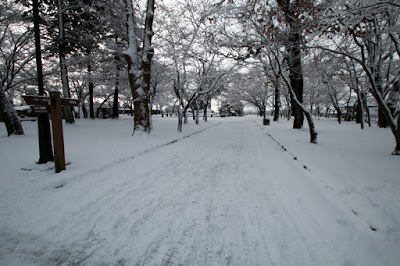 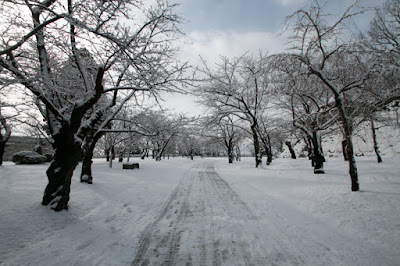 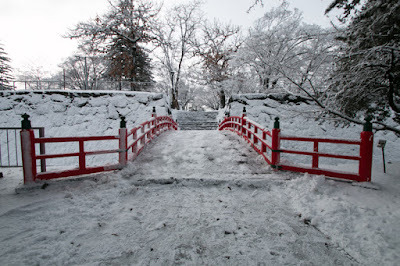 Morioka castle roughly consist of core areas placed in line and surrounding areas. Central area of the castle is a 60 meter square shaped area, which had a large gate at the middle of east line. A three story turret substitute of main tower existed at southern corner, and residence of the lord occupied whole area of the area. 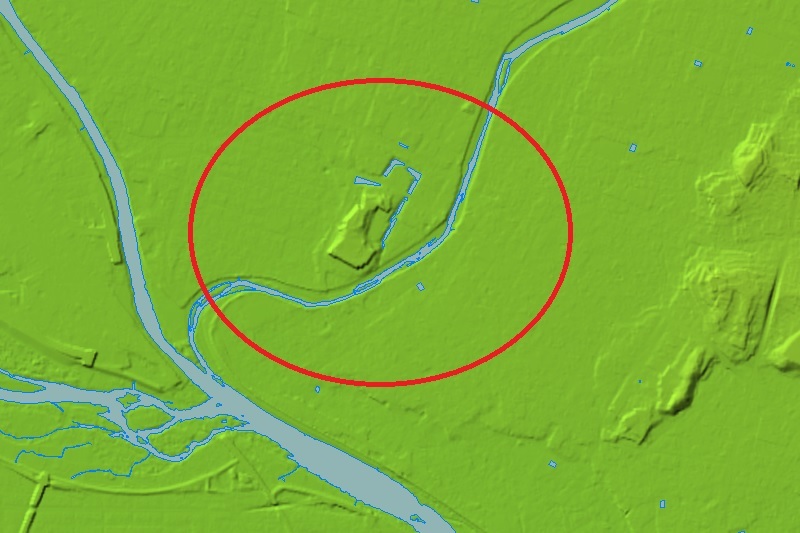 Secondary area and third area spreads northward from central area in line. 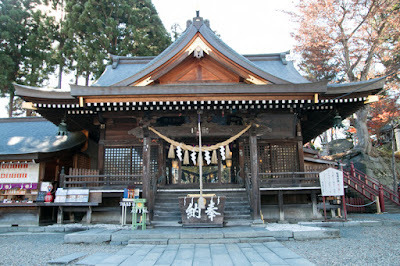 Each area are about 50 meter long and not so large, but entrance into both area is protected a huge masugata style composite gate with folded way. 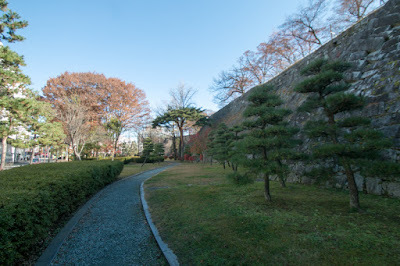 Backside of central area is protected corridor area at lower layer, and wall of these core areas are wholly protected by stone walls, complexly folded utilizing original shape of terrain. 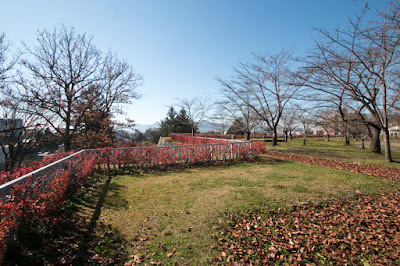 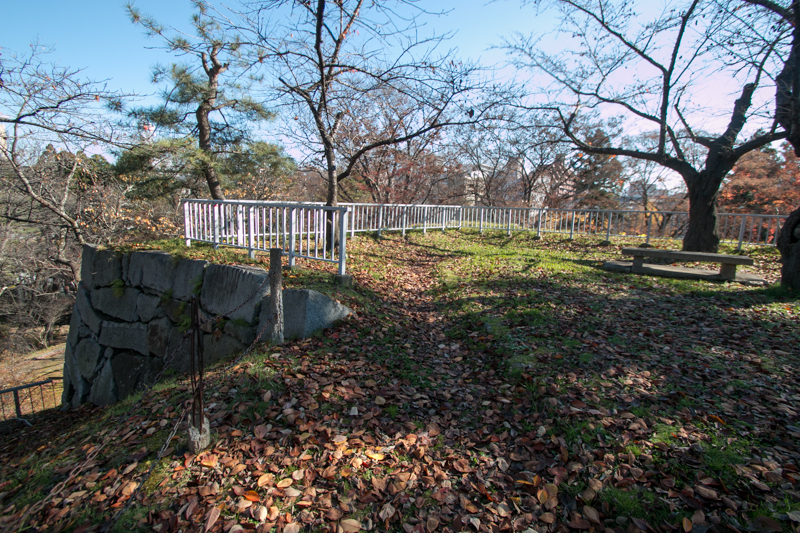 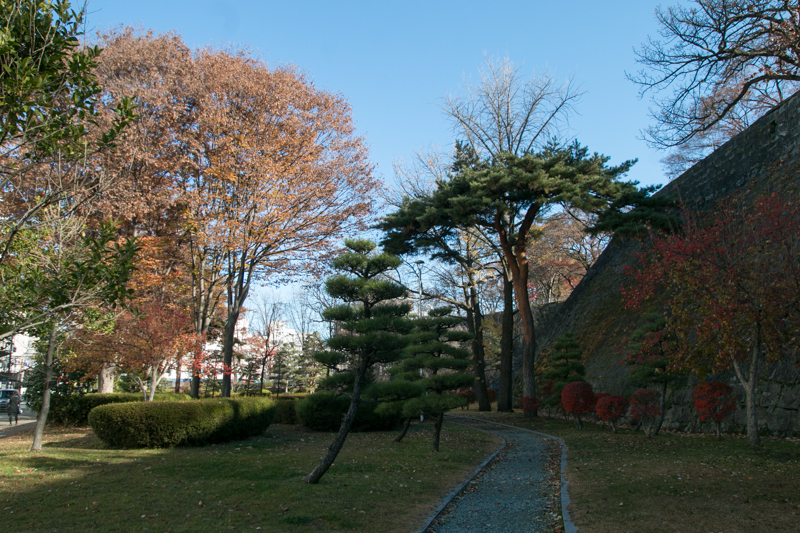 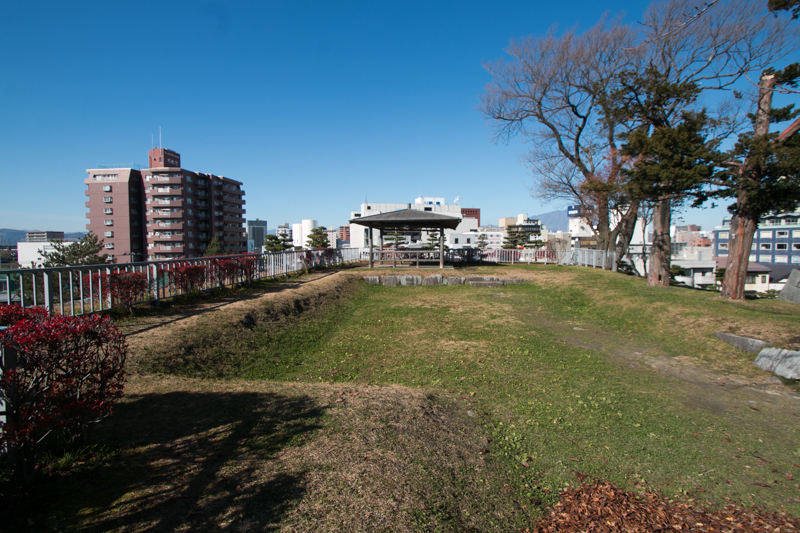 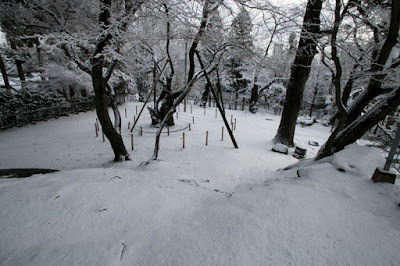 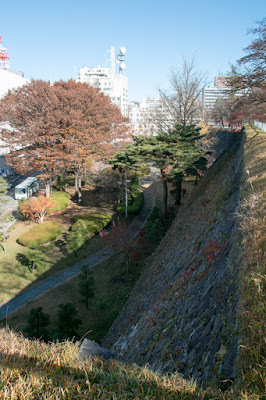 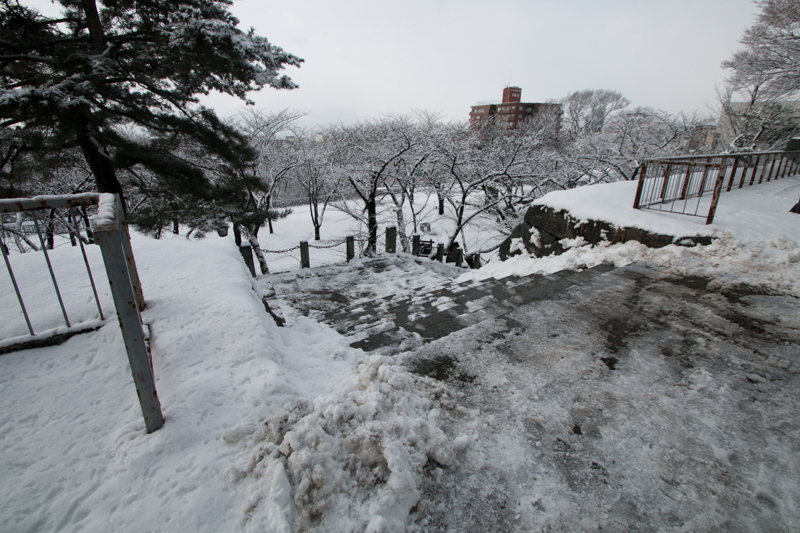 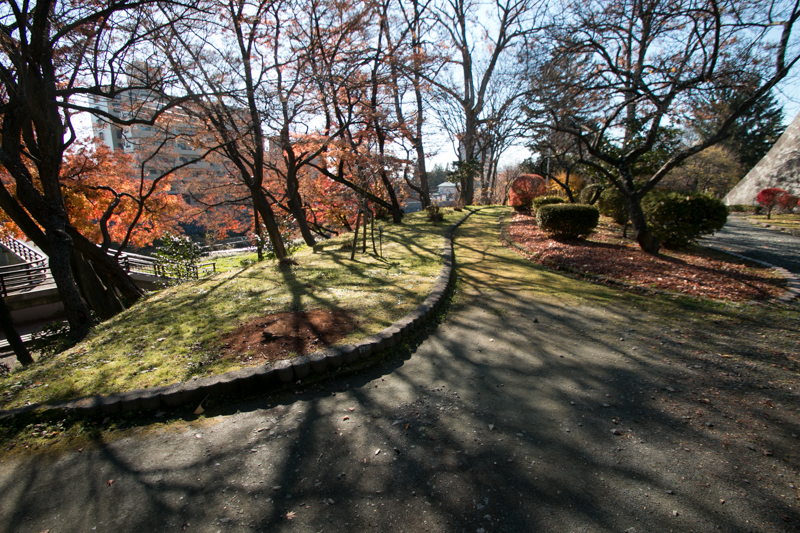 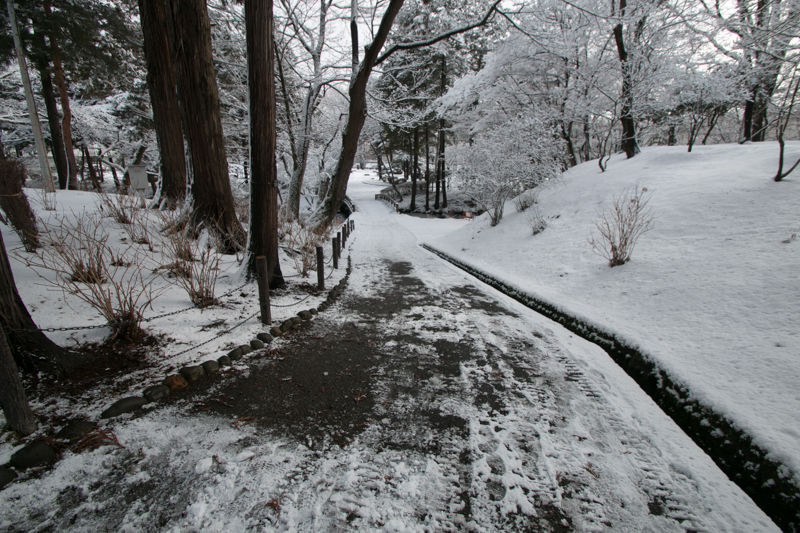 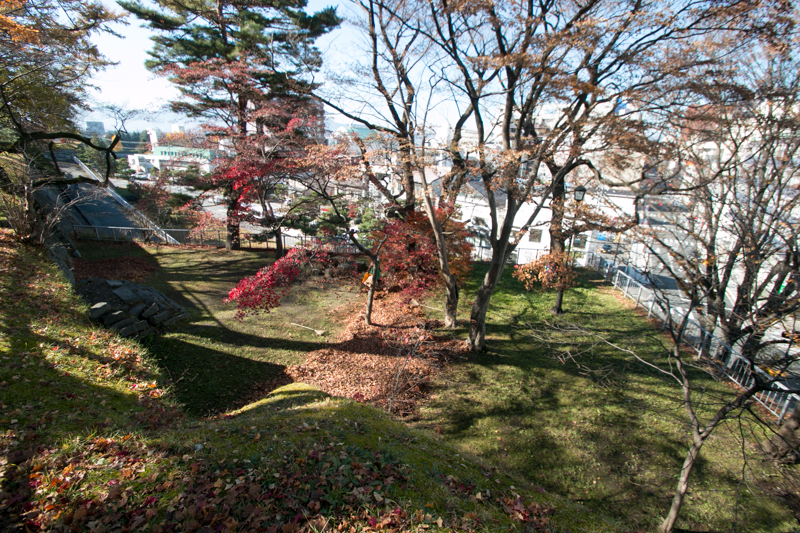 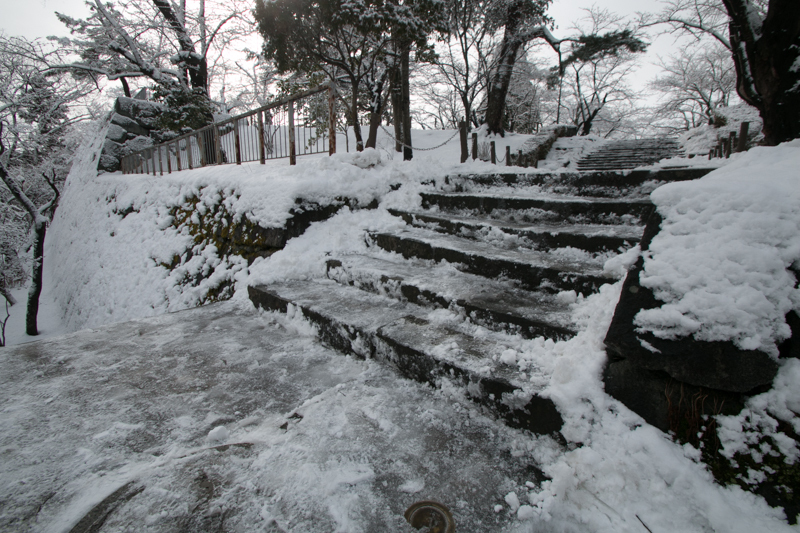 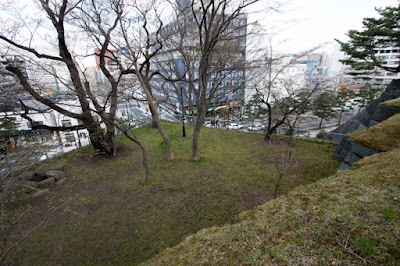 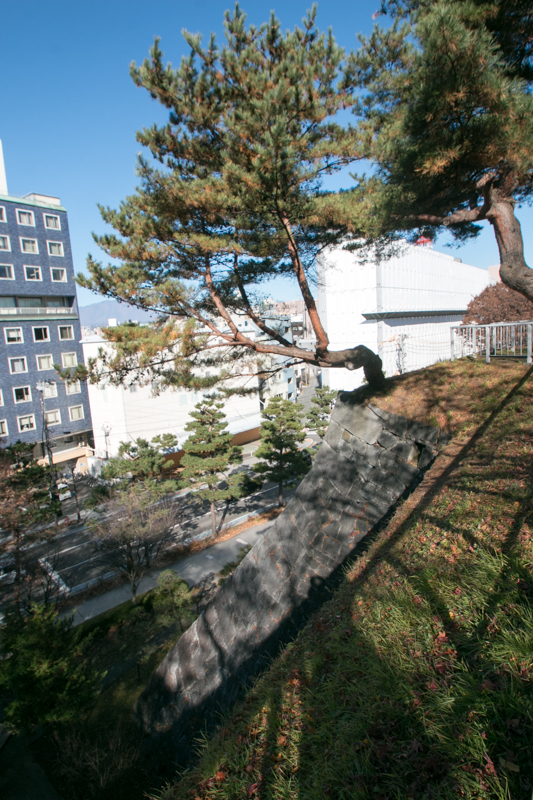 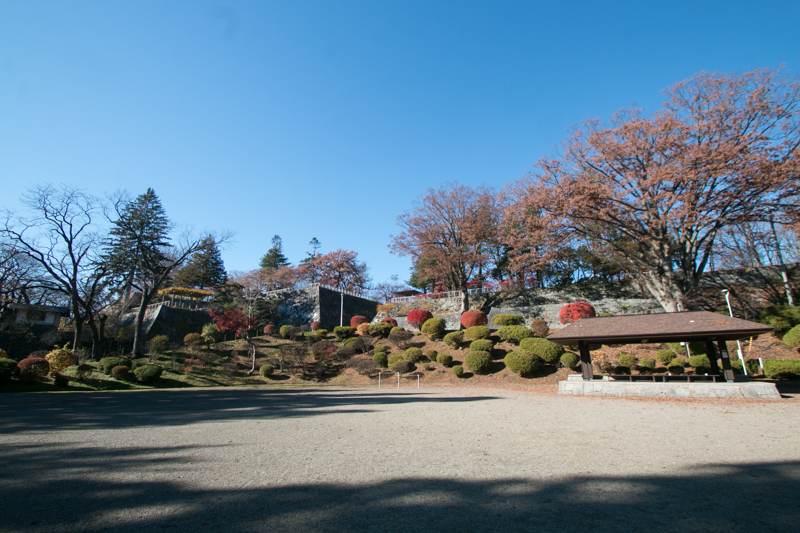 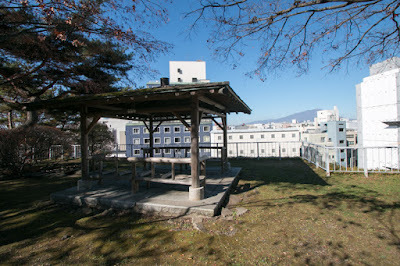 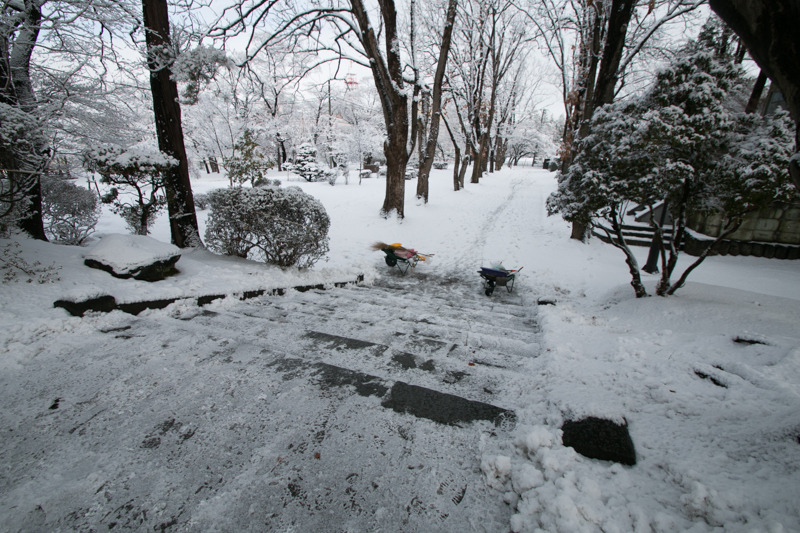 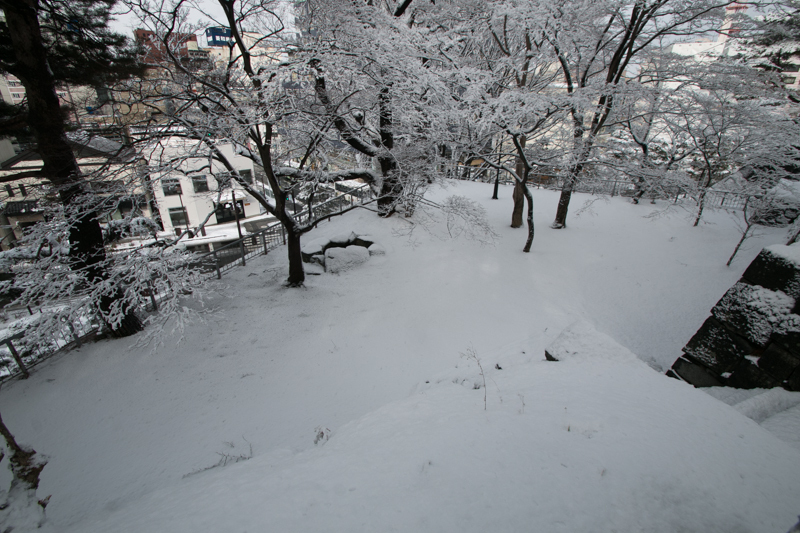 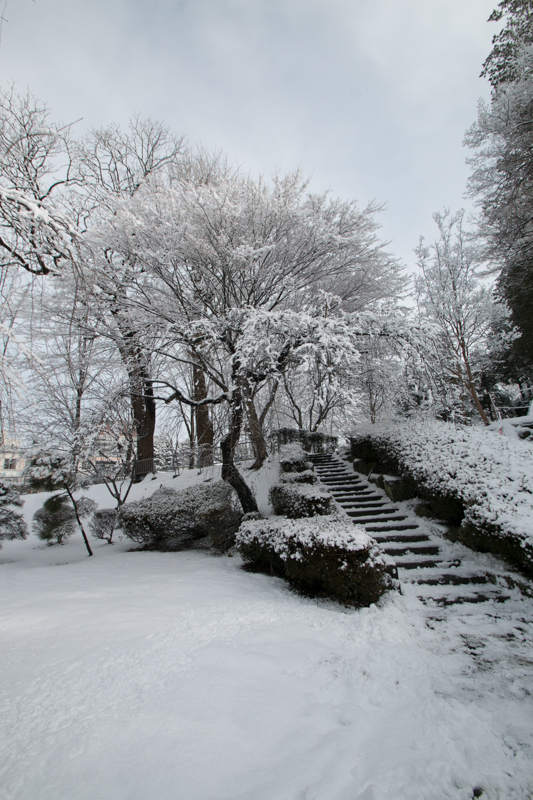 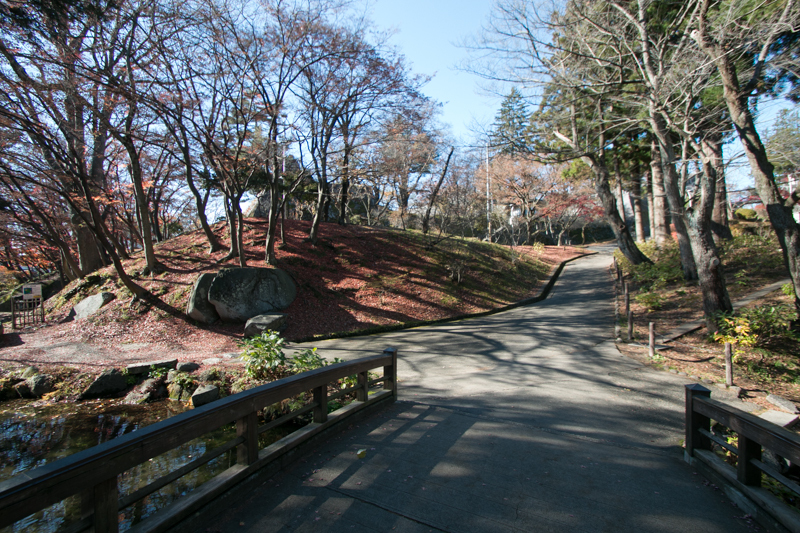 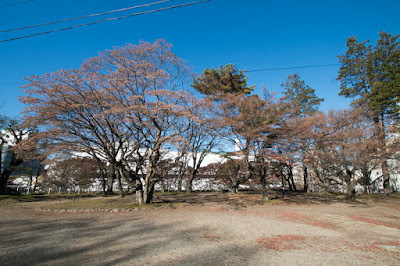 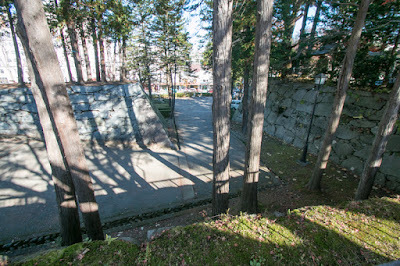 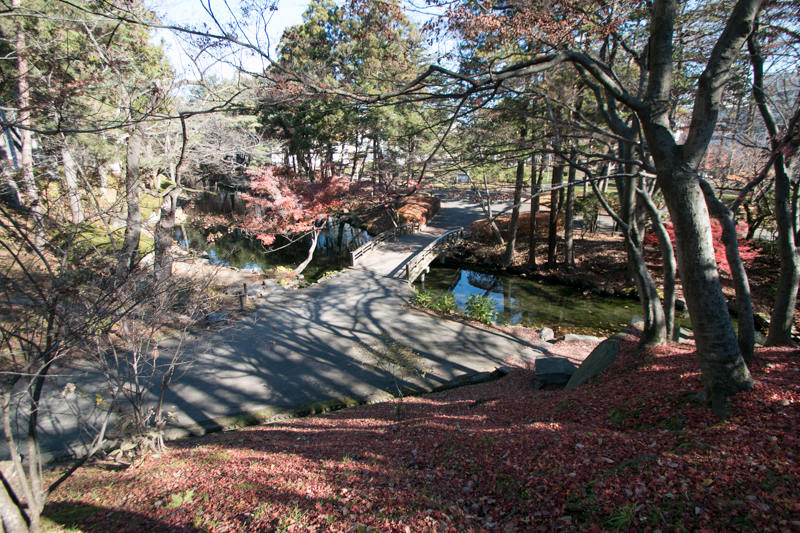 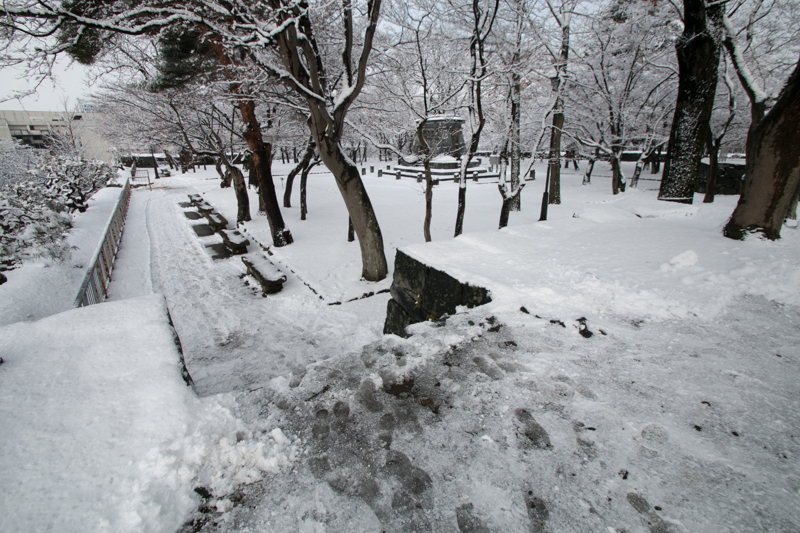 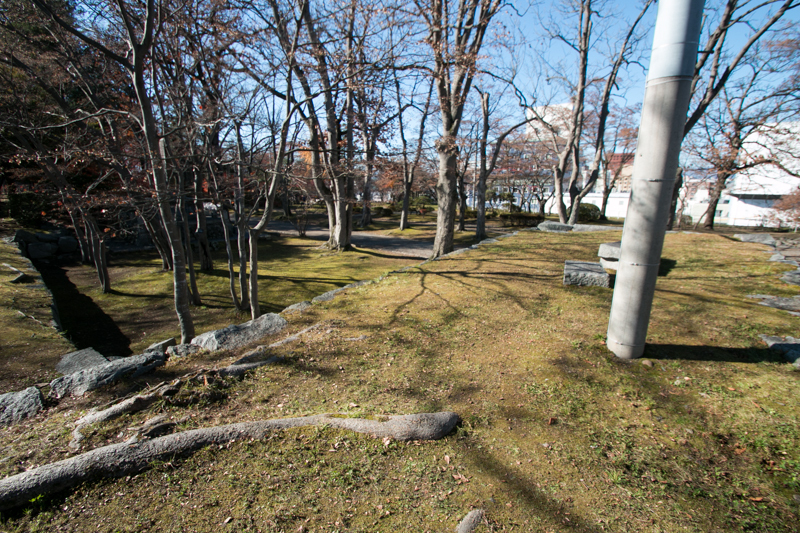 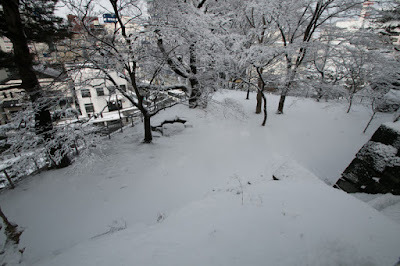 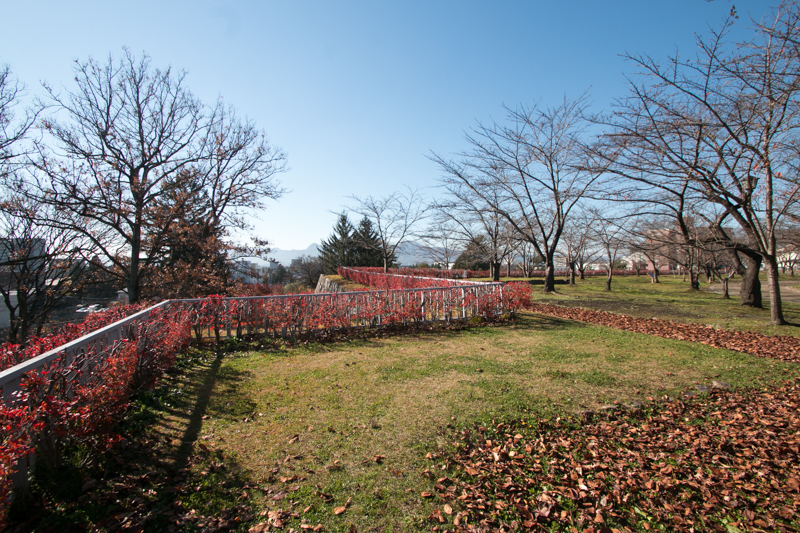 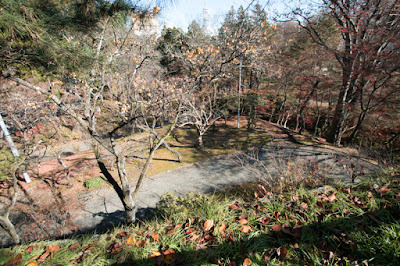 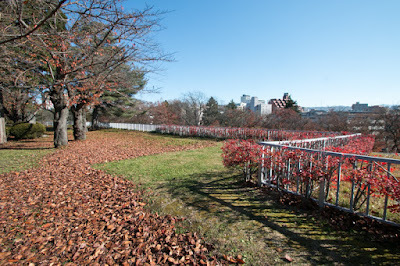 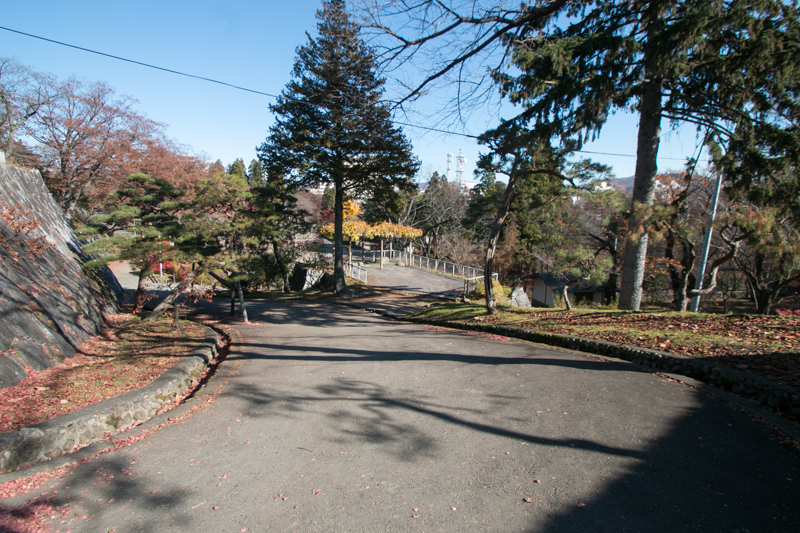 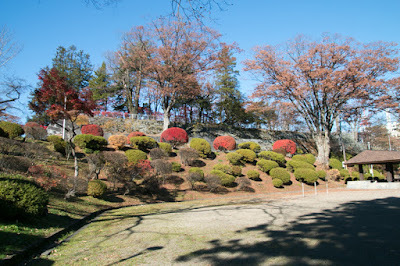 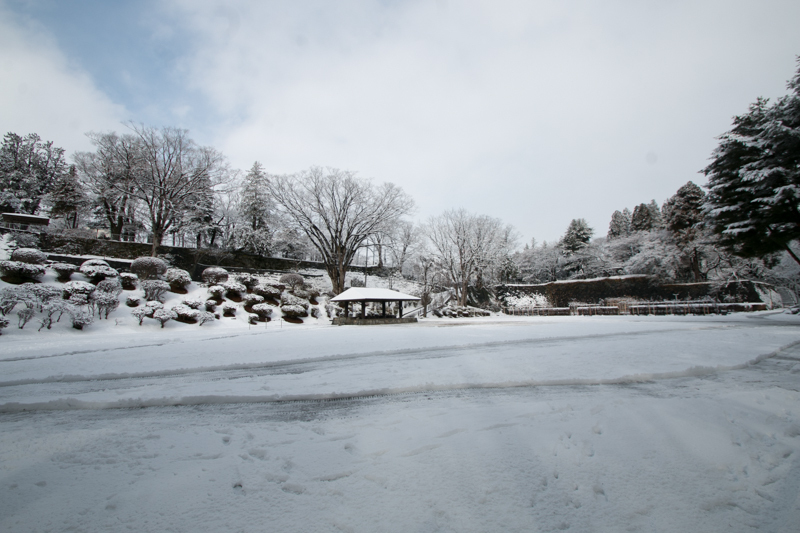 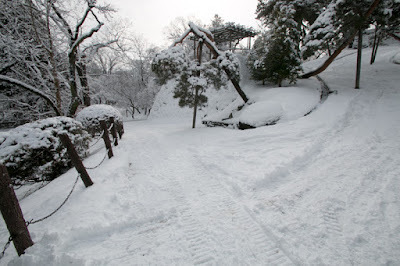 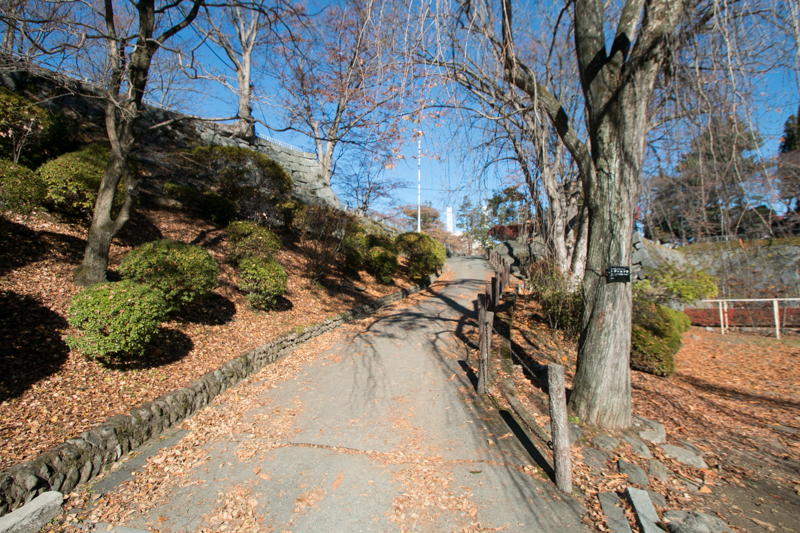 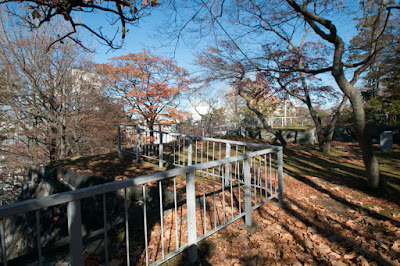 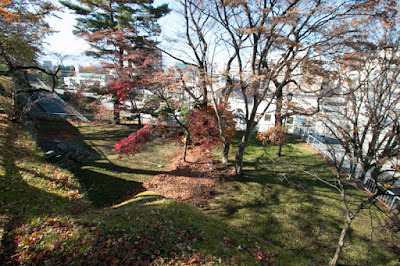 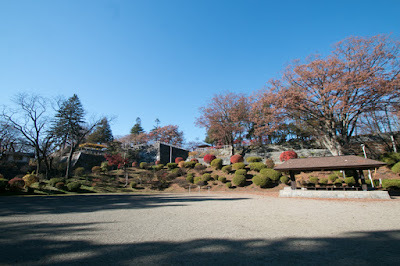 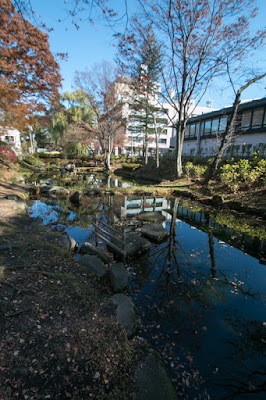 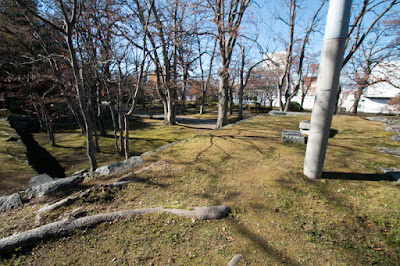 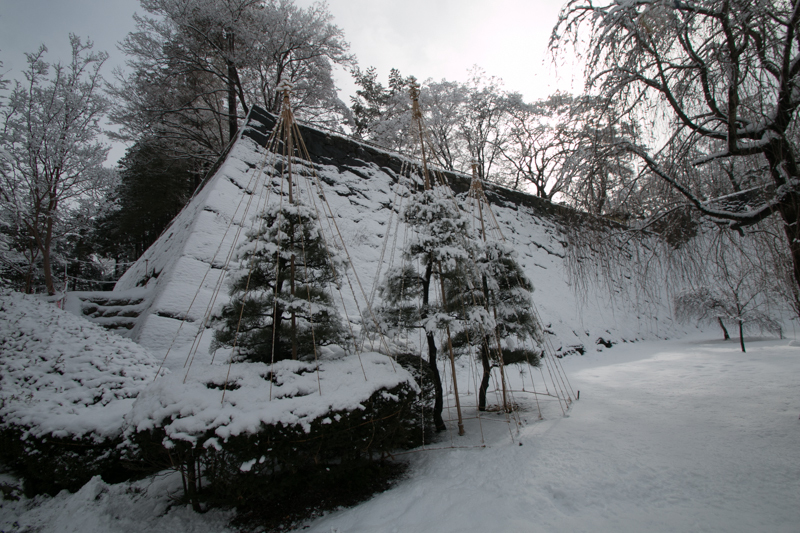 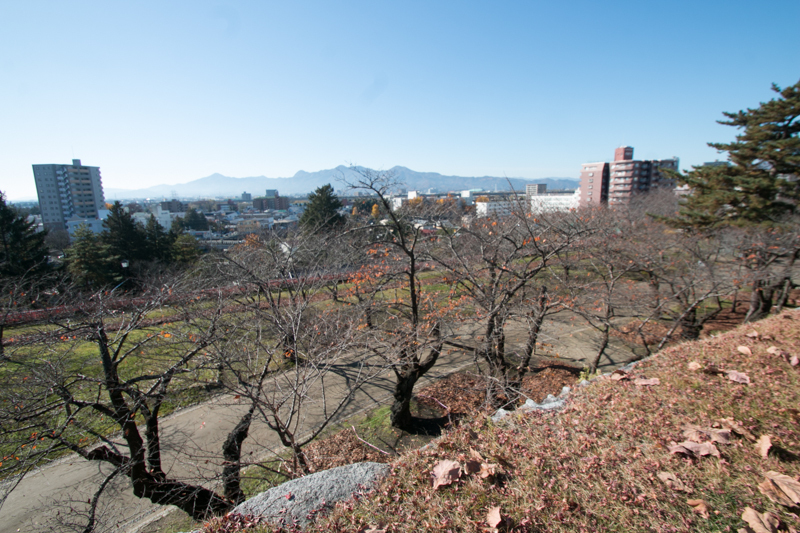 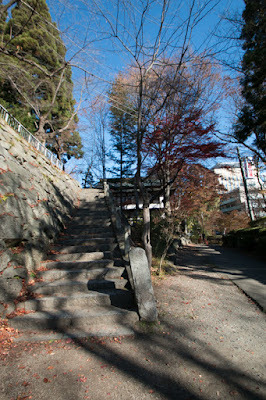 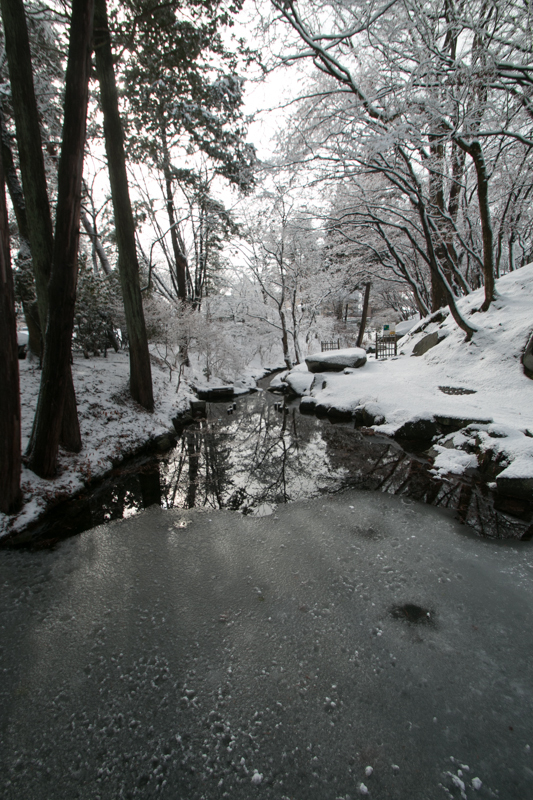 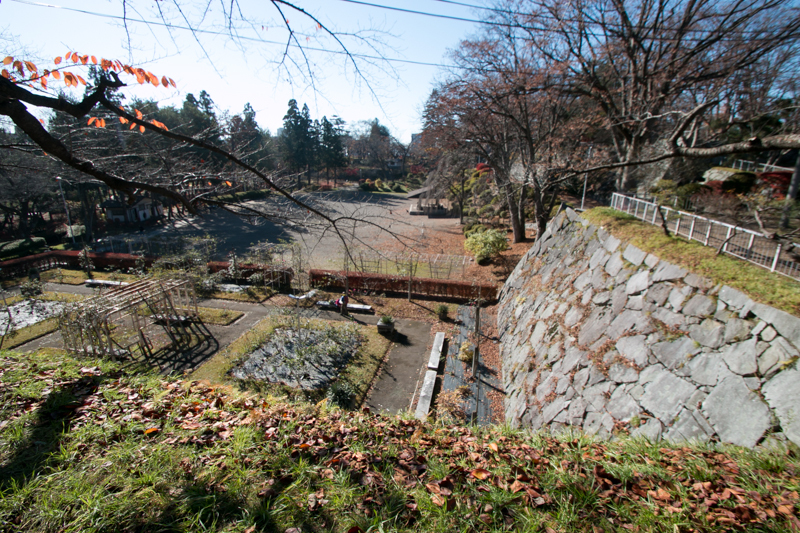 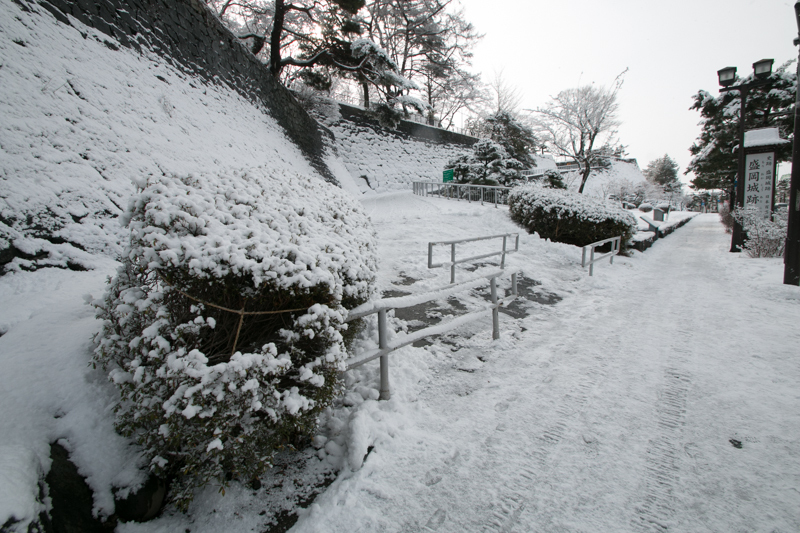 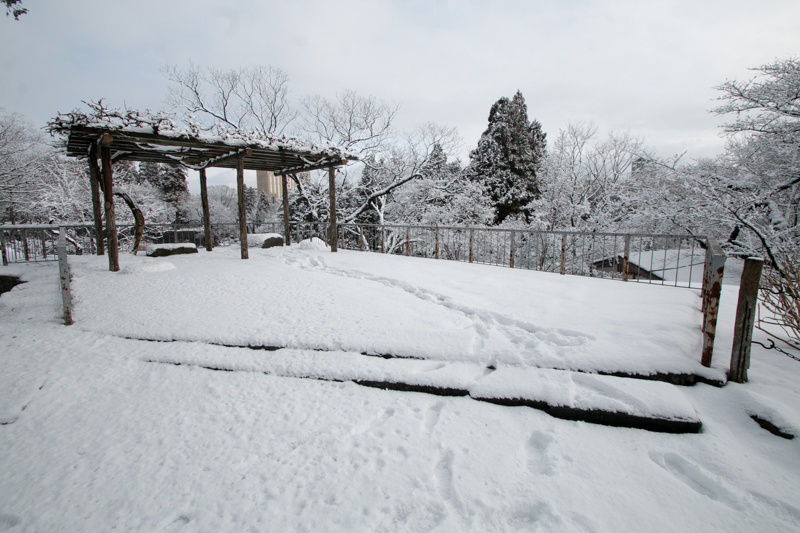 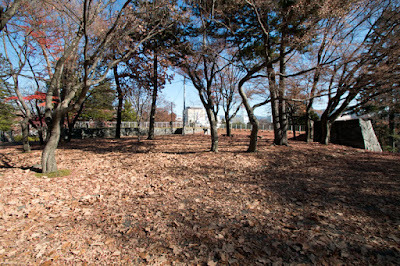 At backside of the castle, a large slope spreads from hillside to corridor area. This basic plan of Morioka castle which divided a hill into two layer, place core areas in line and protects them by corridor area with stone wall quite resembles to Hizen Nagoya castle or Ishigakiyama castle which were directly built by Hideyoshi. 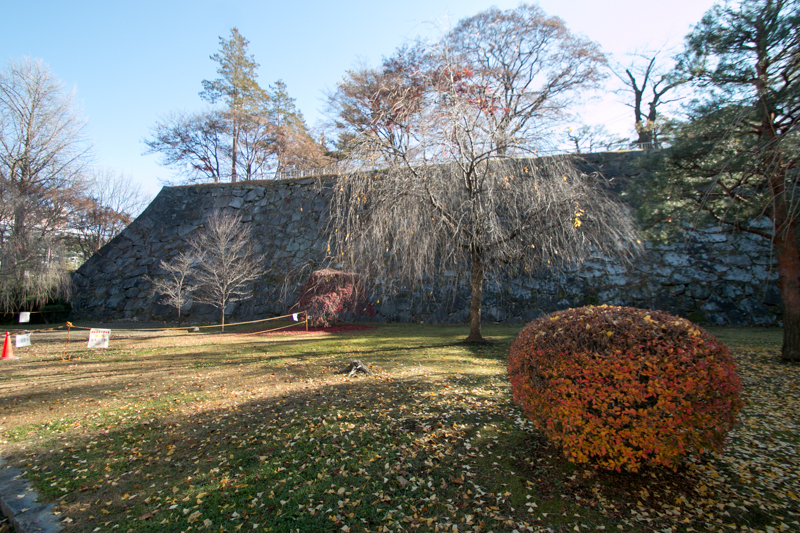 Large slope to the gate, complexly folded stone wall and limited number of turrets compared with the size of the castle is also clear features of Toyotomi period castles. Just after the confusing period, Nobunao might choose to rebuild his authority by building latest style castle. 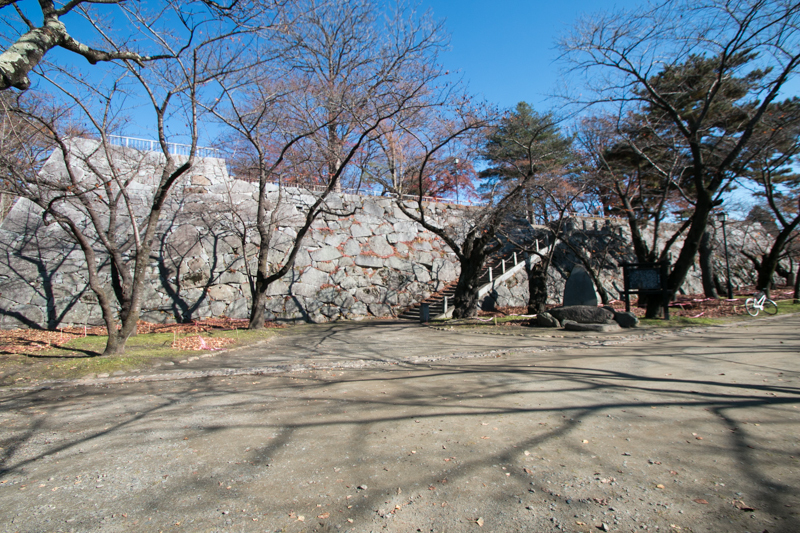 After over 20 years construction, in the period of Toshinao Nanbu (1576-1632), Morioka castle was mostly completed. 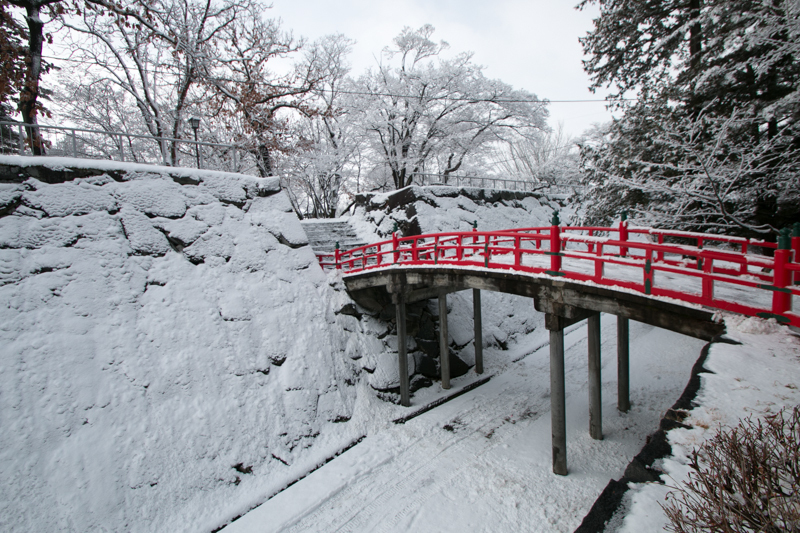 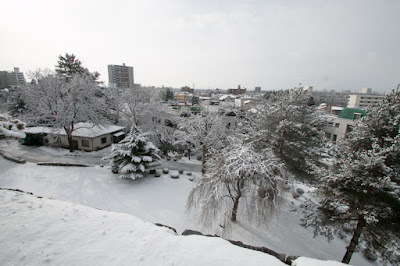 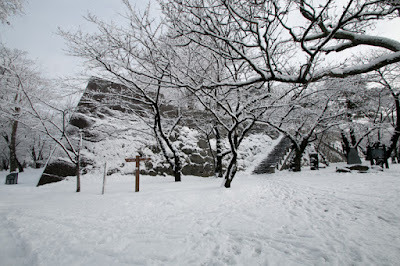 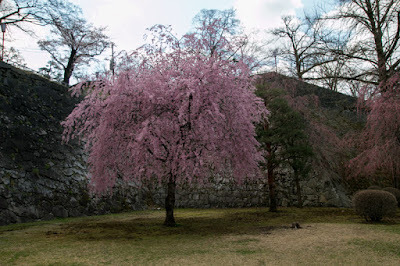 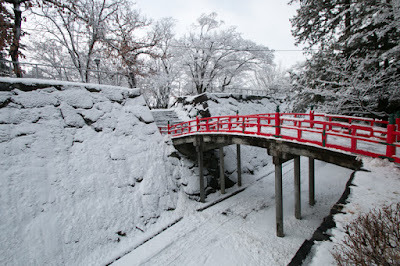 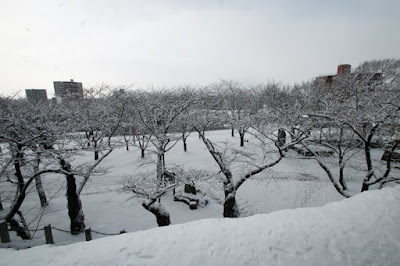 Morioka castle is only one castle at north Tohoku area having stone walls at whole area, as Hirosaki castle (Aomori castle) or Matsumae Castle (Hokkaido ) has stone walls at only central area. 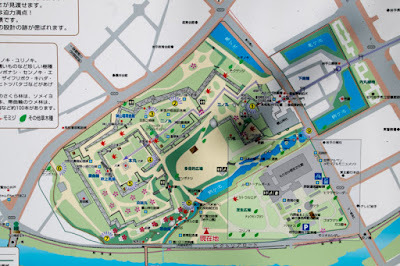 Toshinao also developed Morioka town and gold mines in the territory, and changed Nanbu clan from medieval loose alliance to centralized feudal domain. 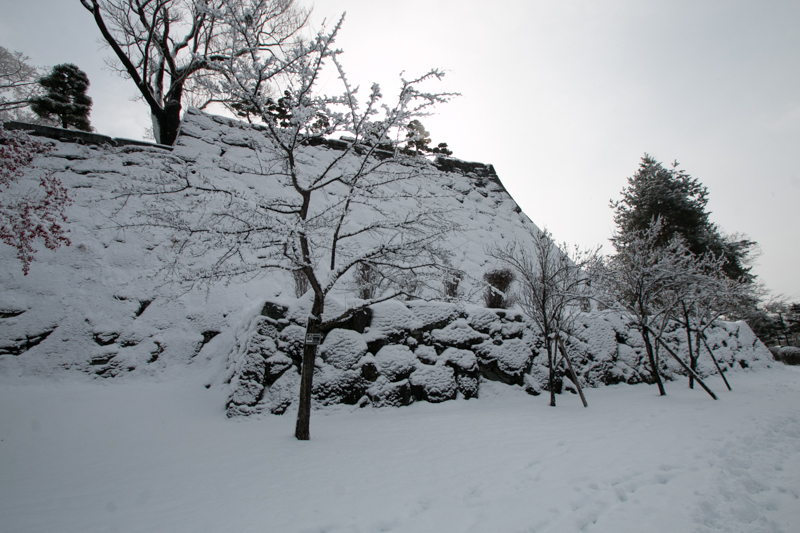 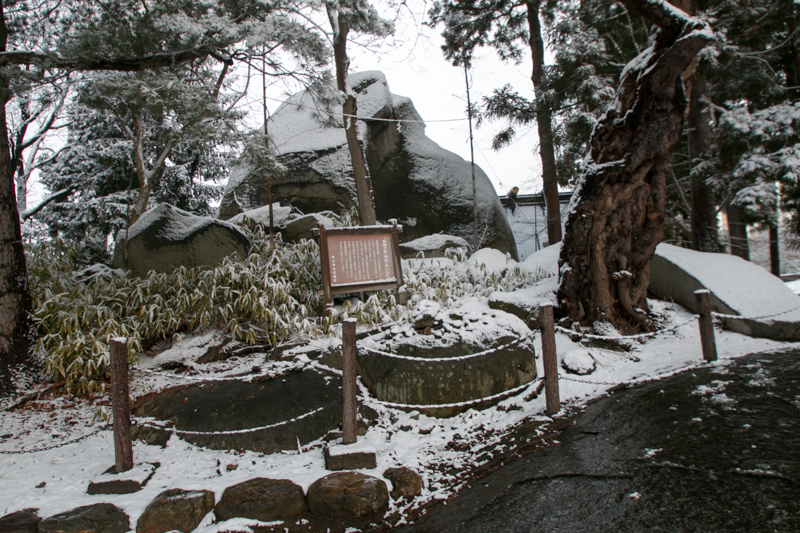 Suffering from bad harvests from cool climate, Nanbu clan has kept their territory by the end of Edo era. 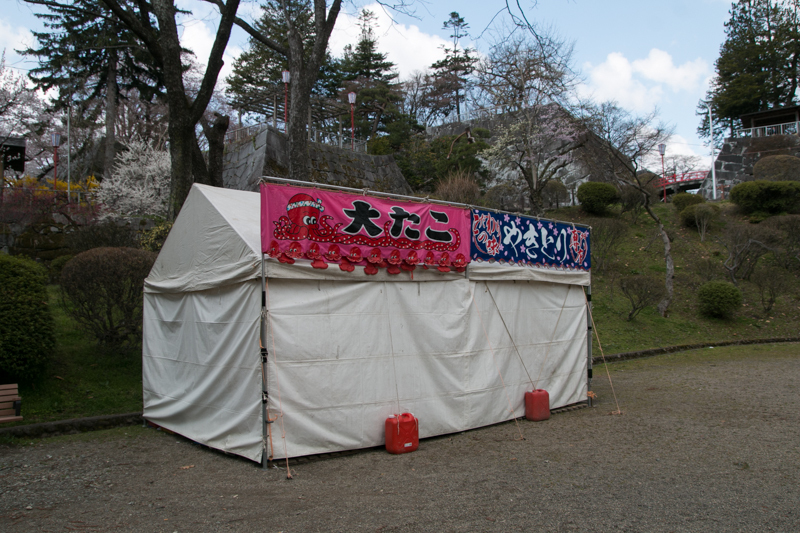 Along with Shimazu clan at Satsuma province (Kagoshima prefecture), Nanbu clan was rare lord who kept their territory over 600 years. 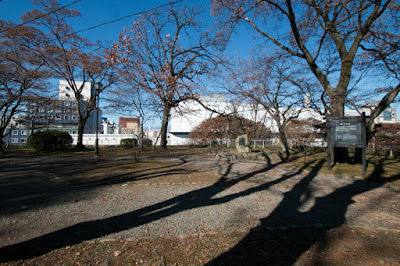 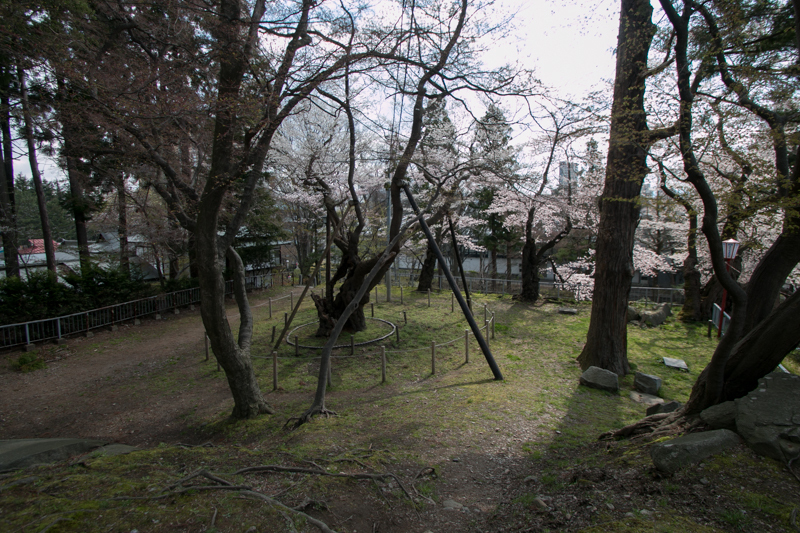 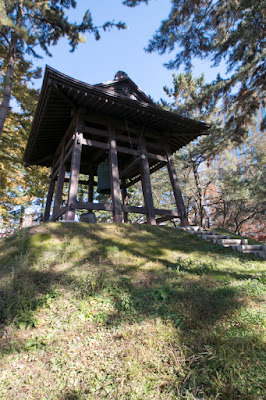 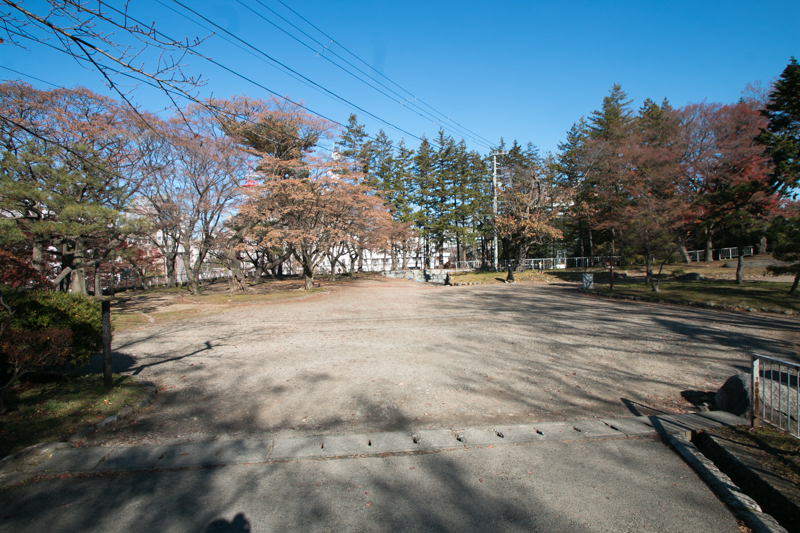 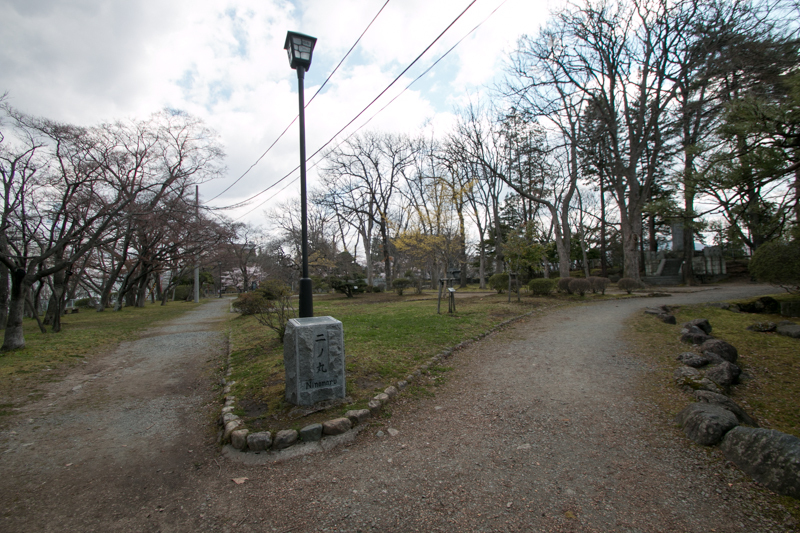 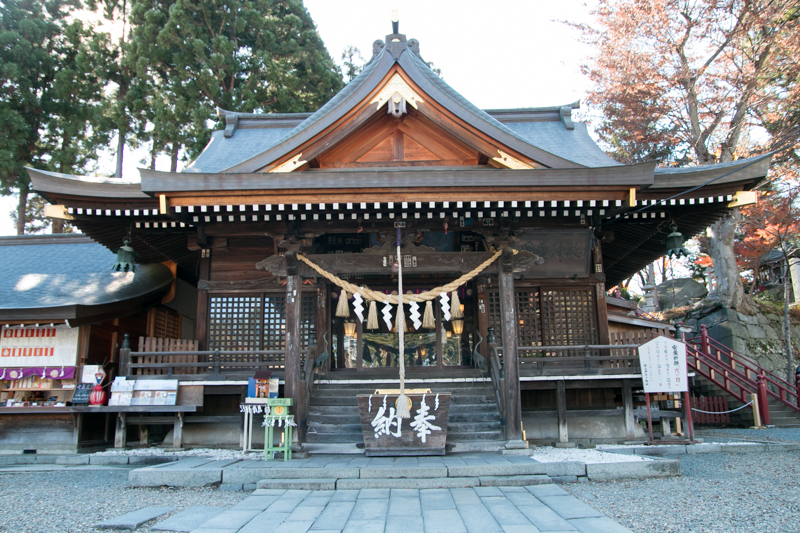 Subsequent to Meiji revolution, all building except for one gate transferred to neighbor temple were lost. But beautiful stone wall still keeps its shape on the hill. 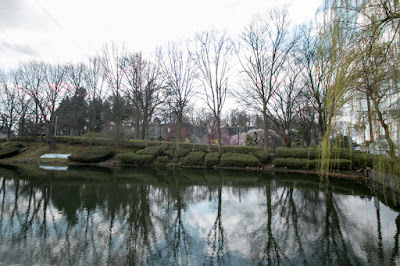 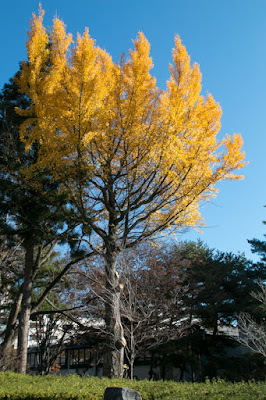 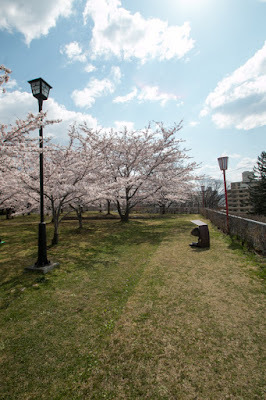 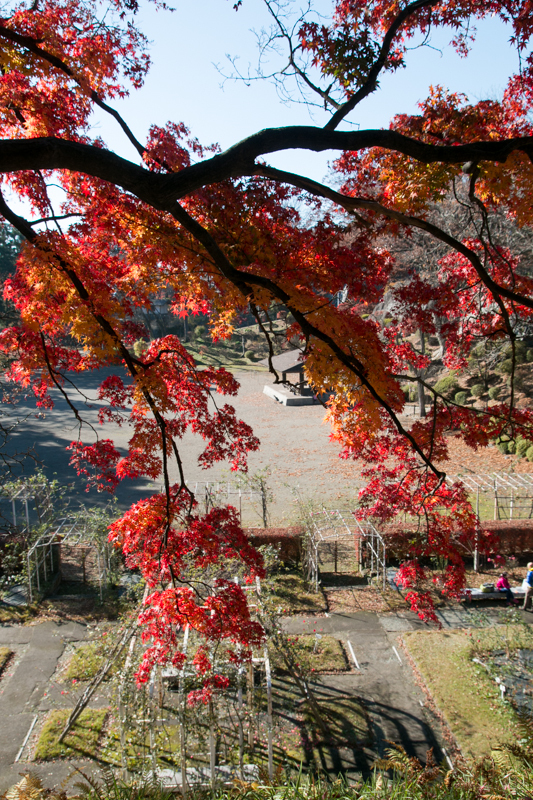 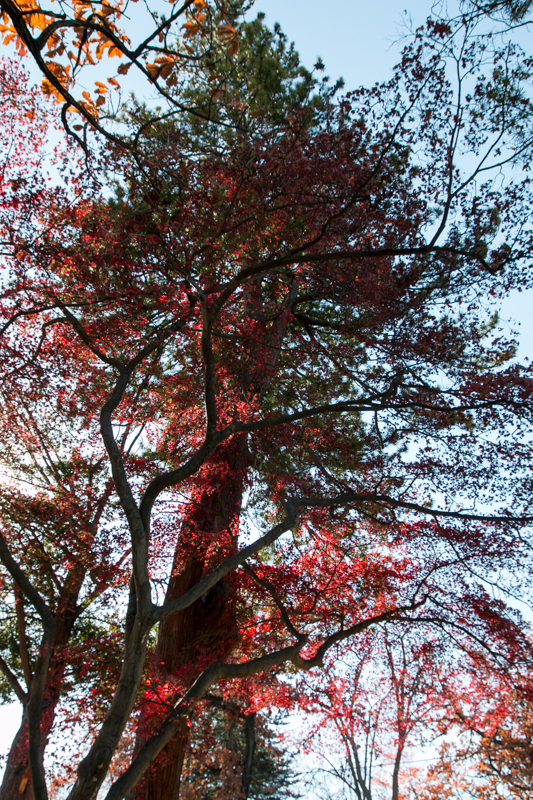 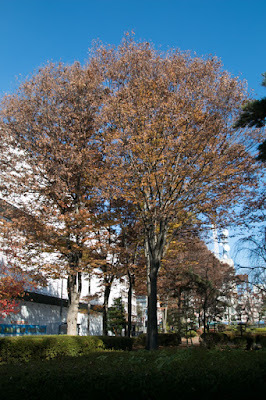 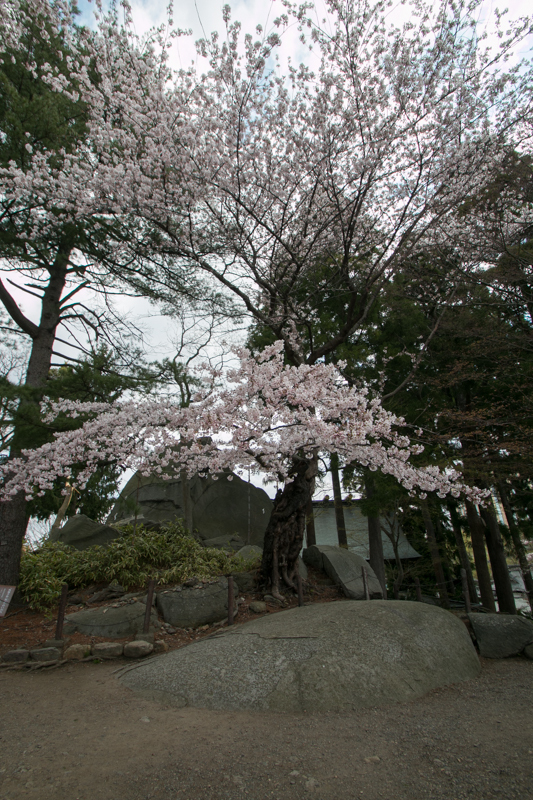 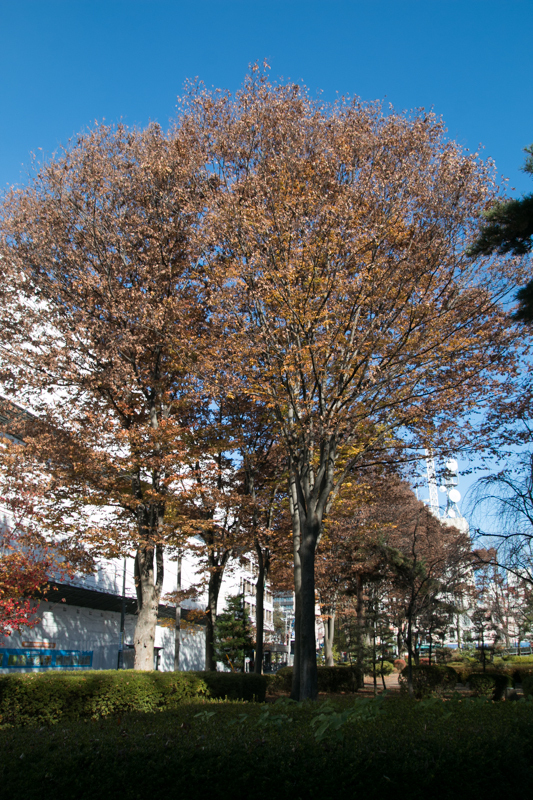 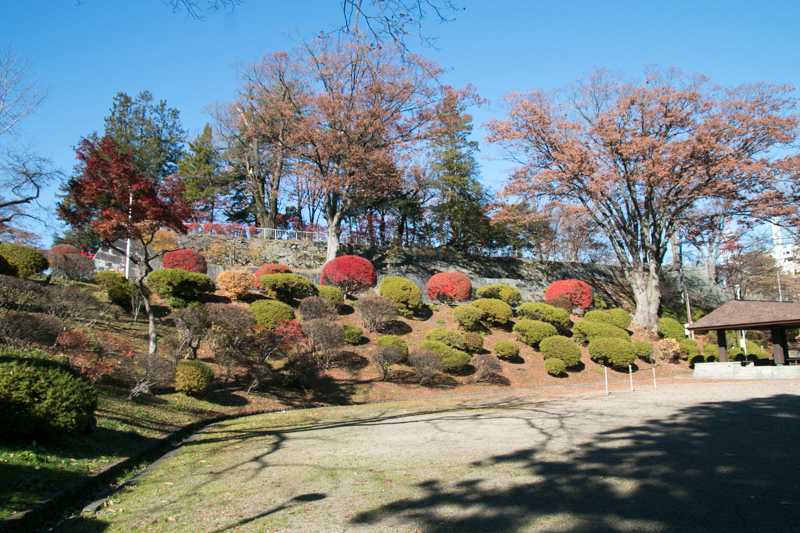 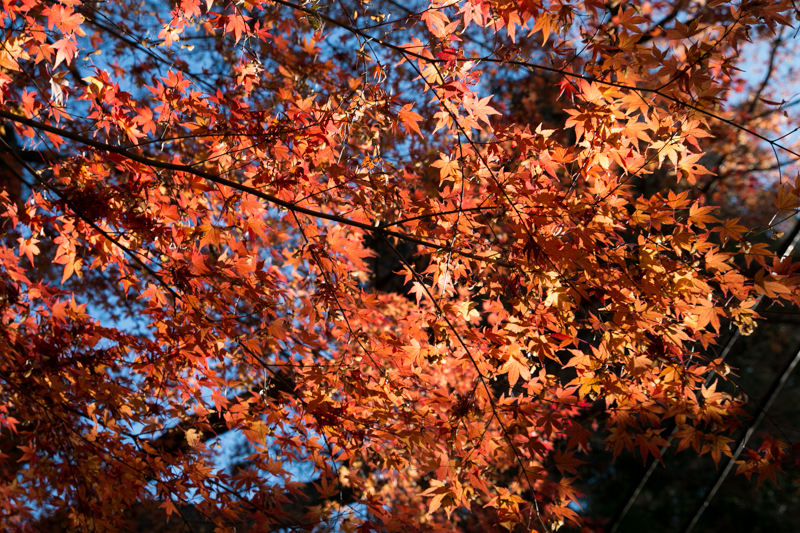 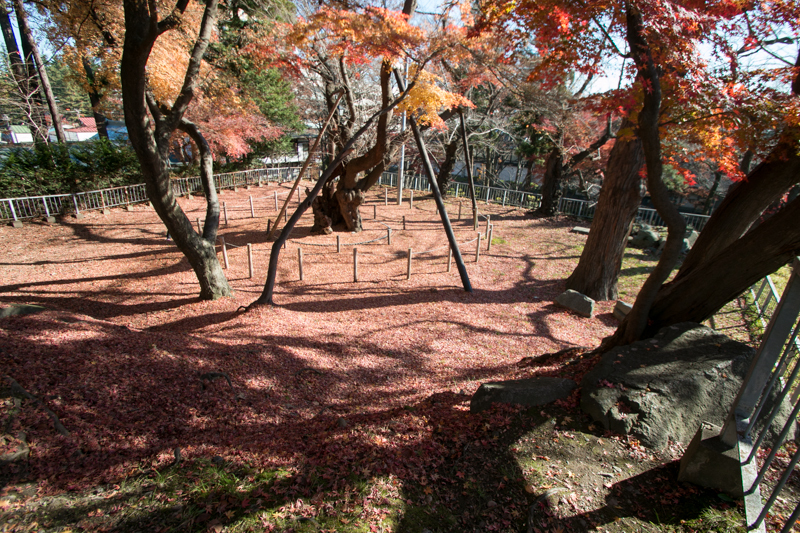 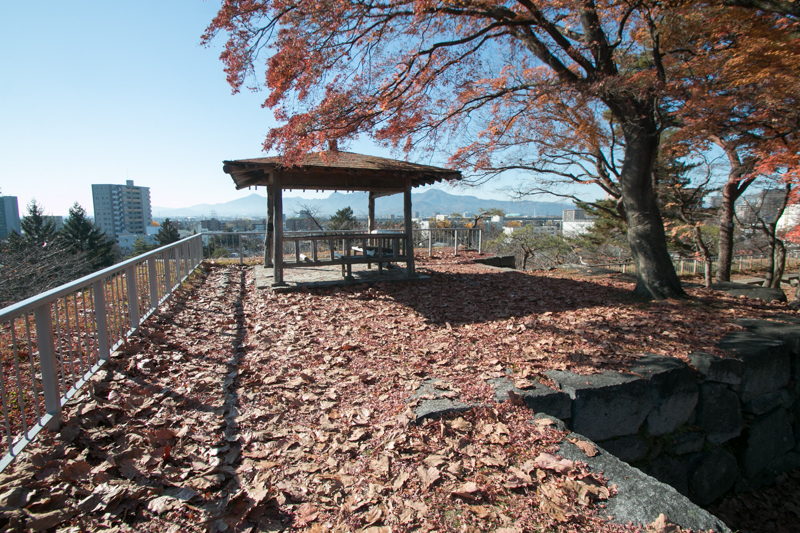 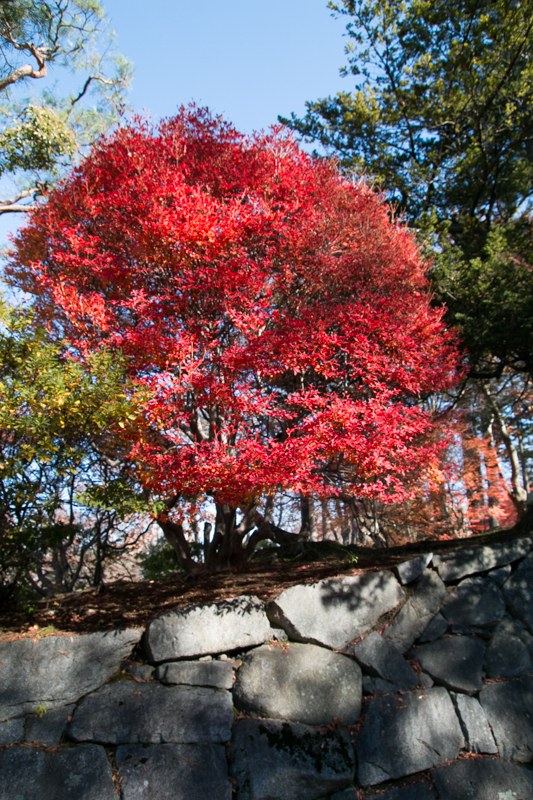 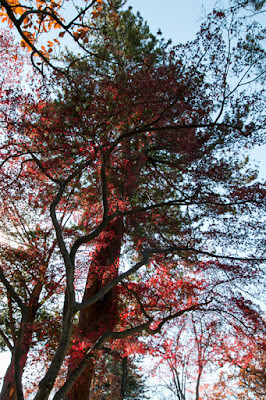 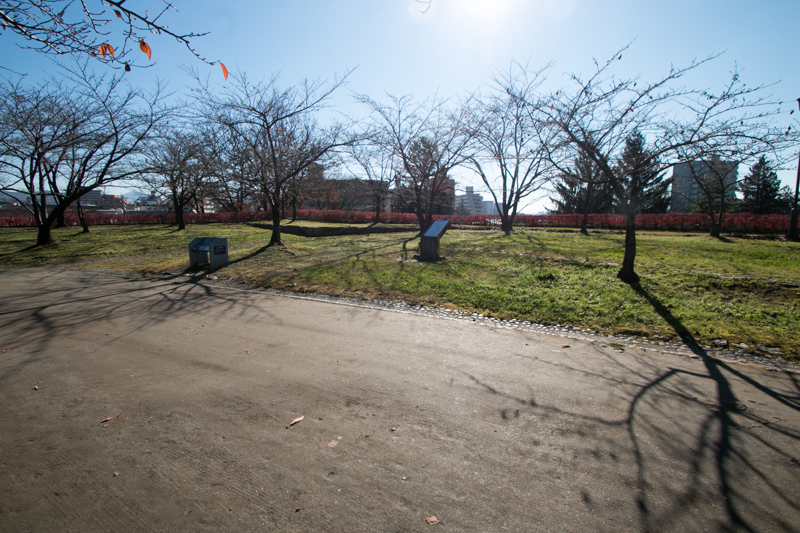 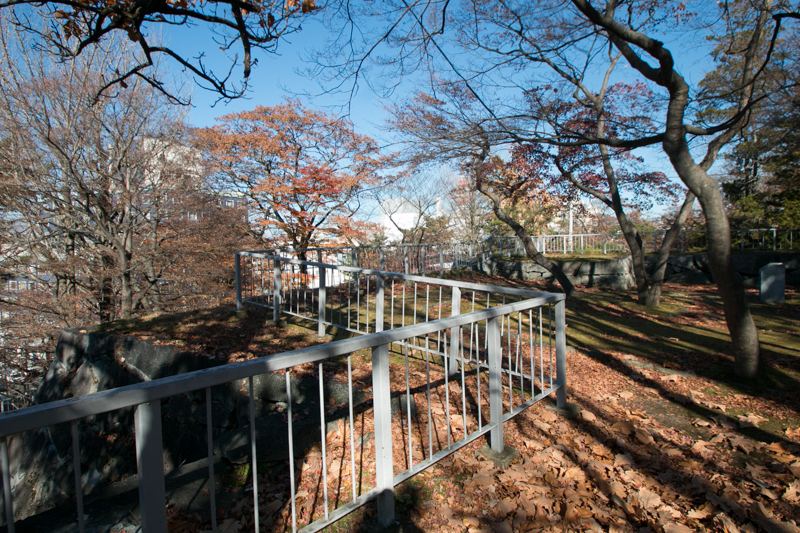 Now the site of the castle is used as a park with many trees, and we can see beautiful combination of stone walls and blossoms or autumn reefs in each season. 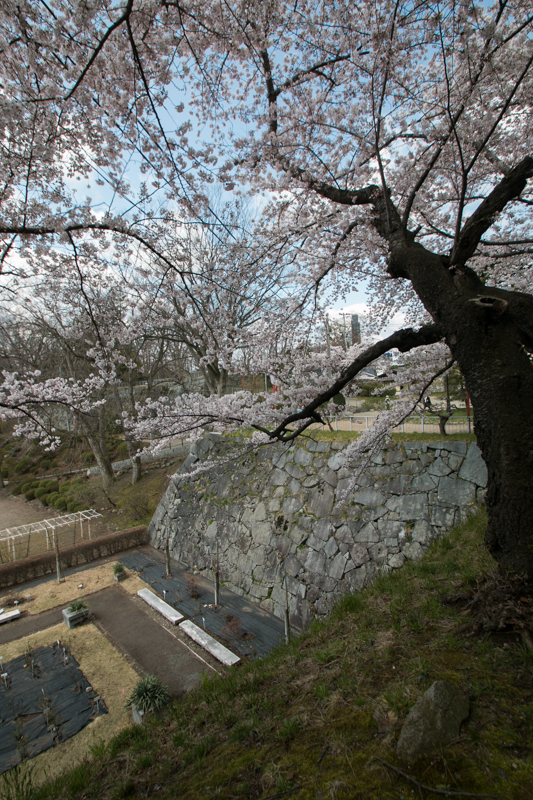 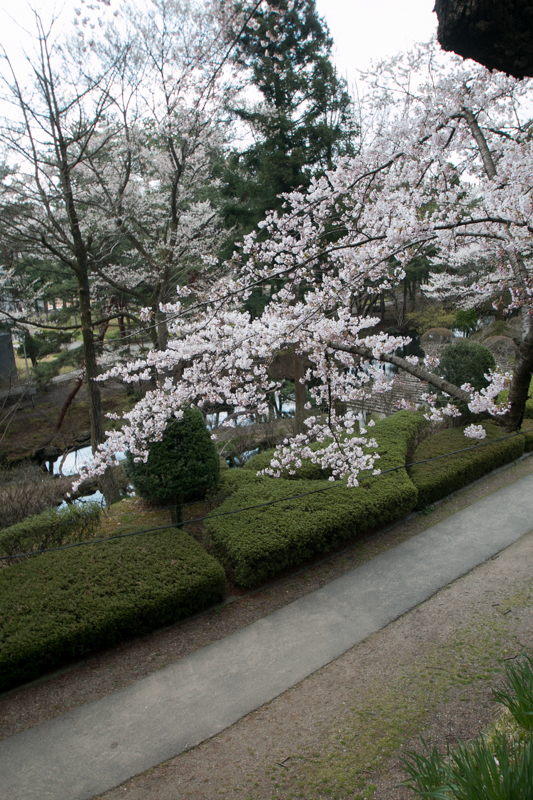 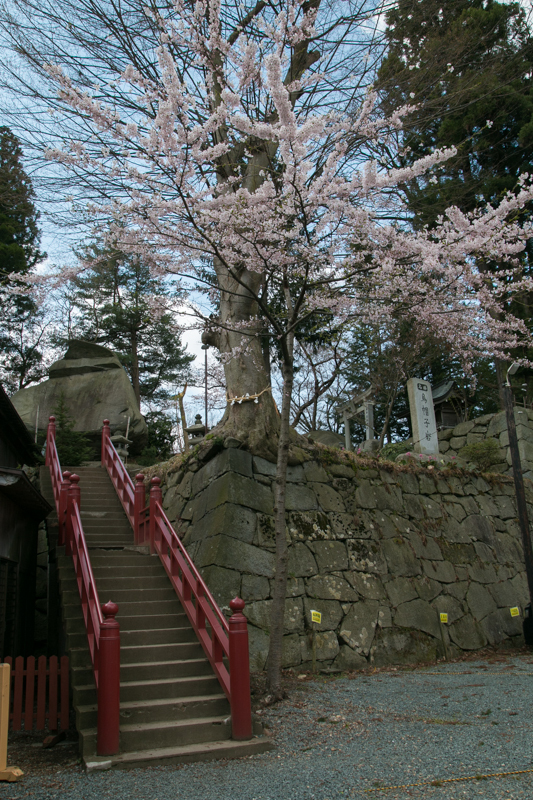 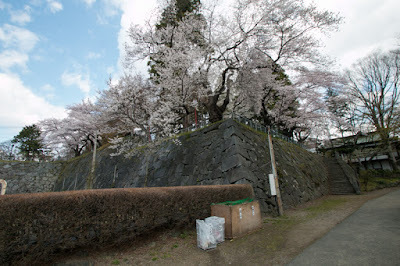 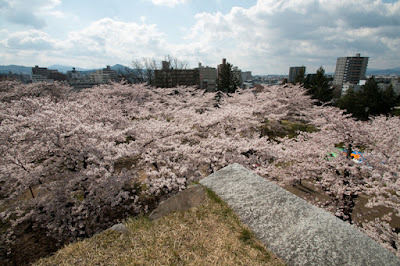 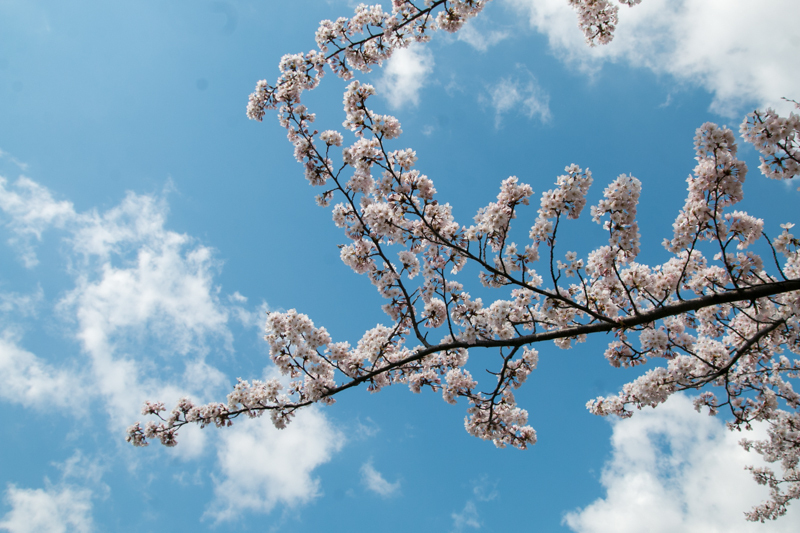 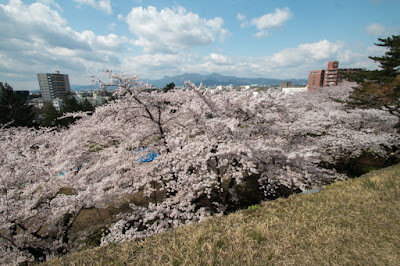 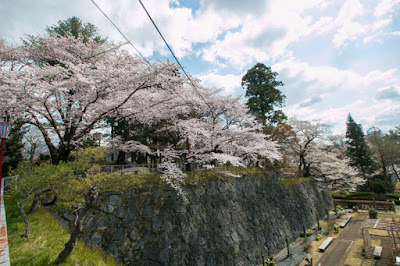 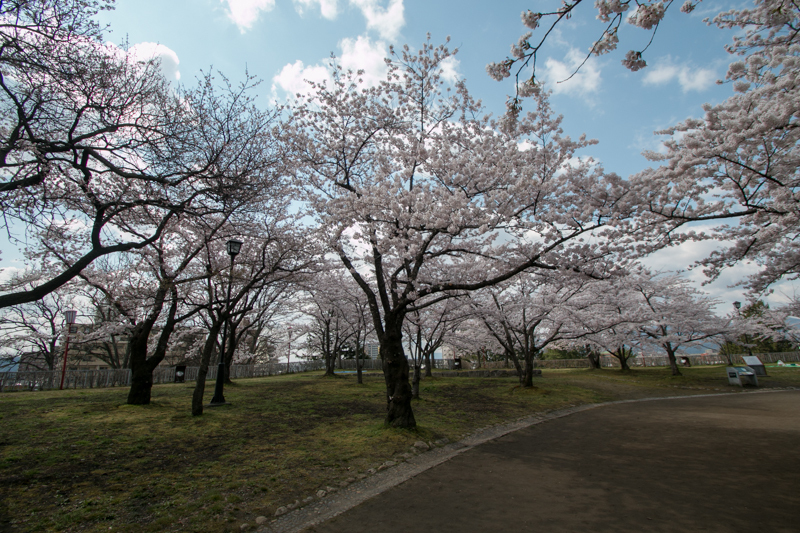 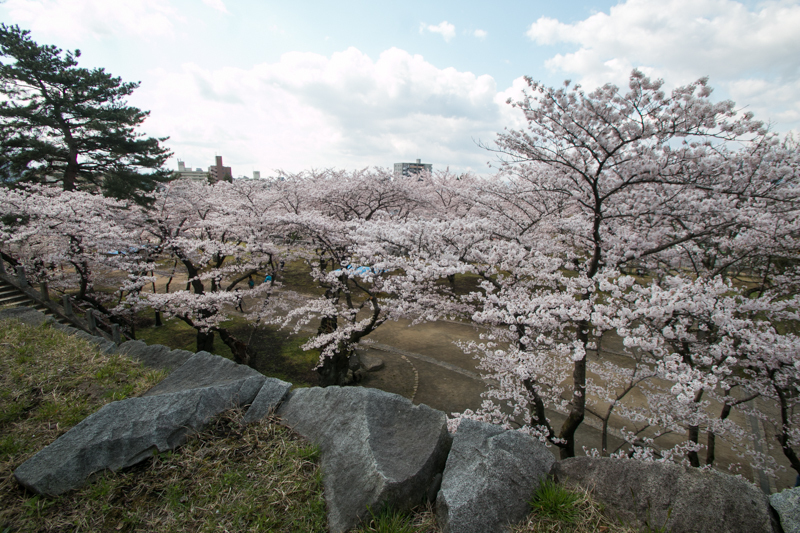 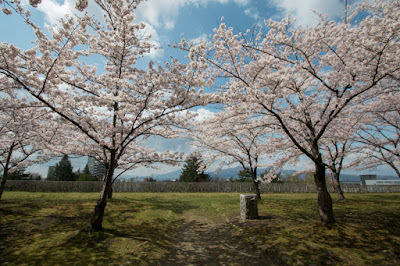 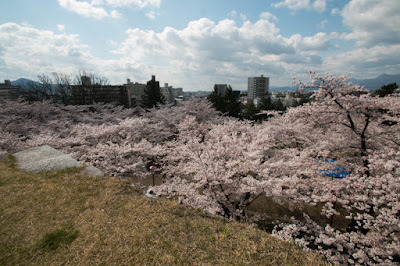 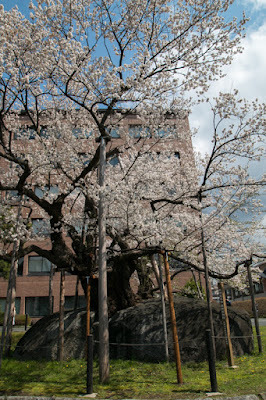 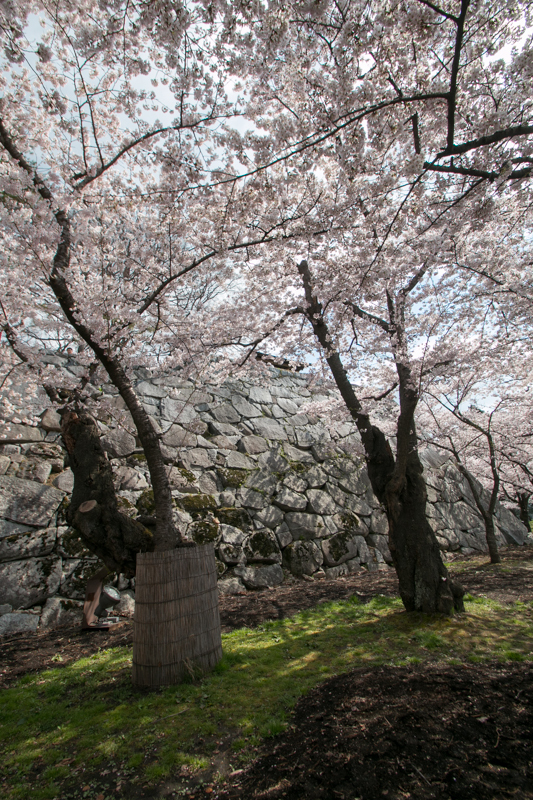 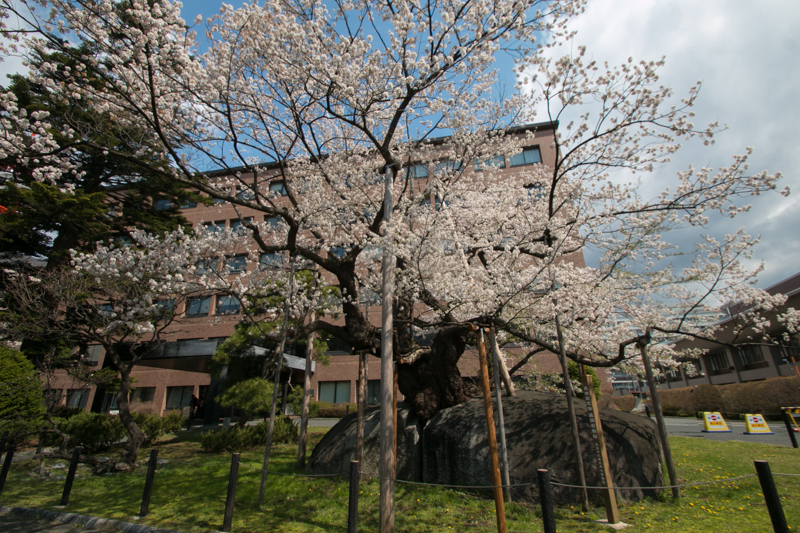 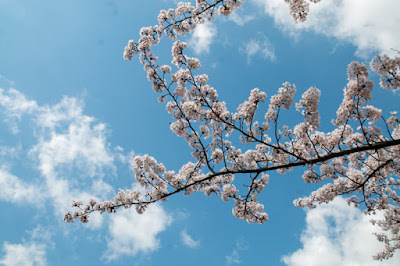 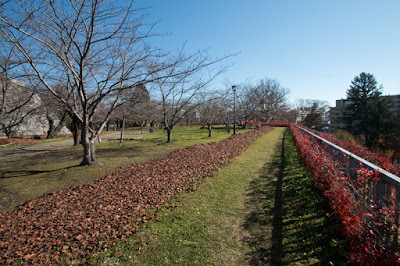 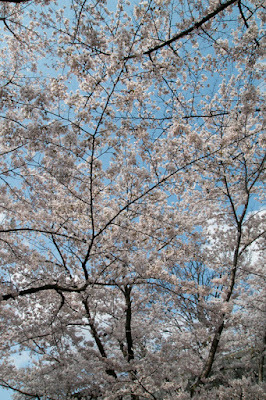 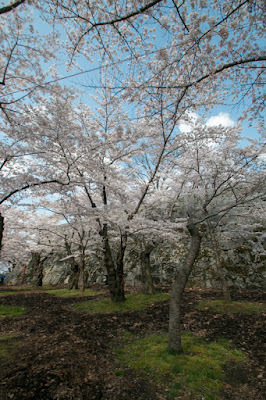 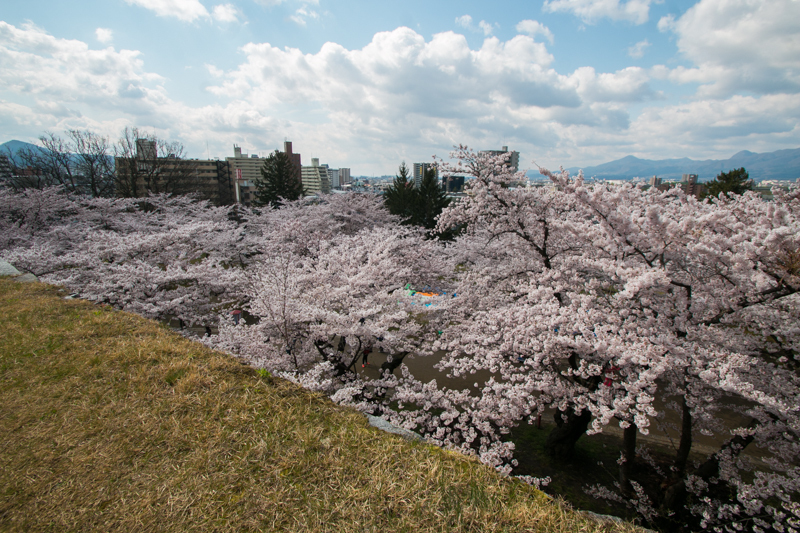 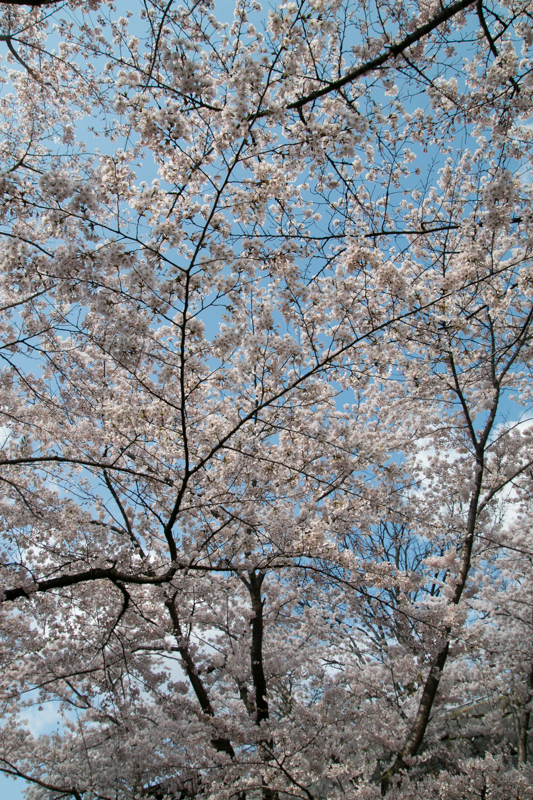 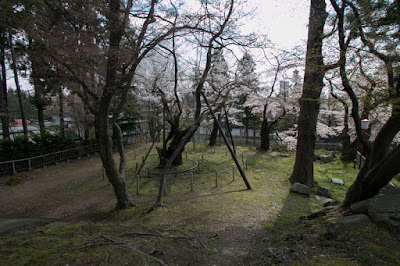 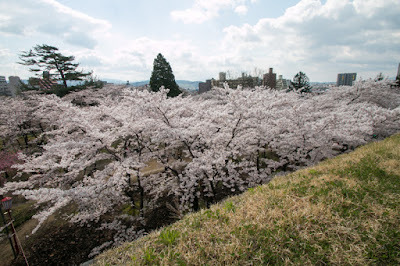 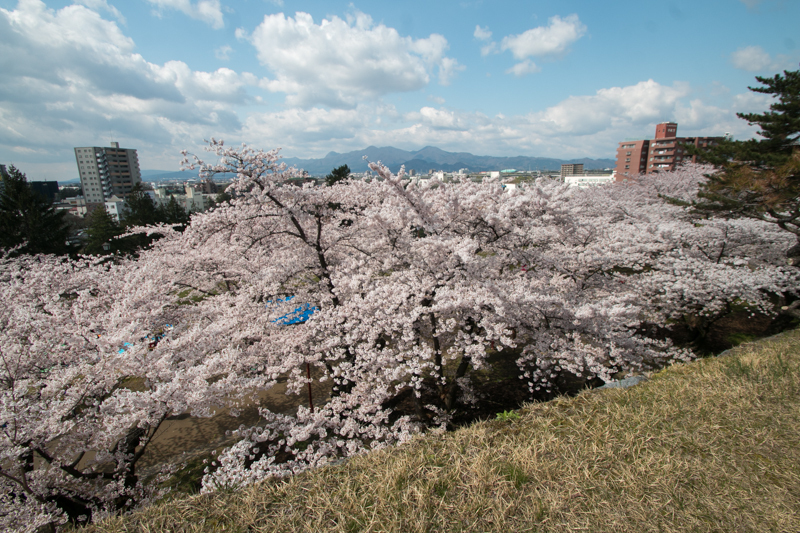 Especially in spring, cherry blossom decorated corridor area is seen as a sea of flower looked down from central area. 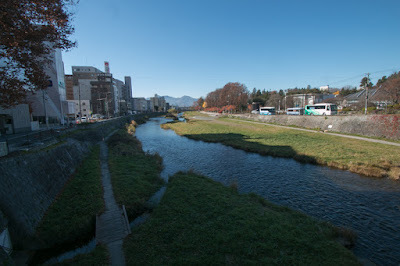 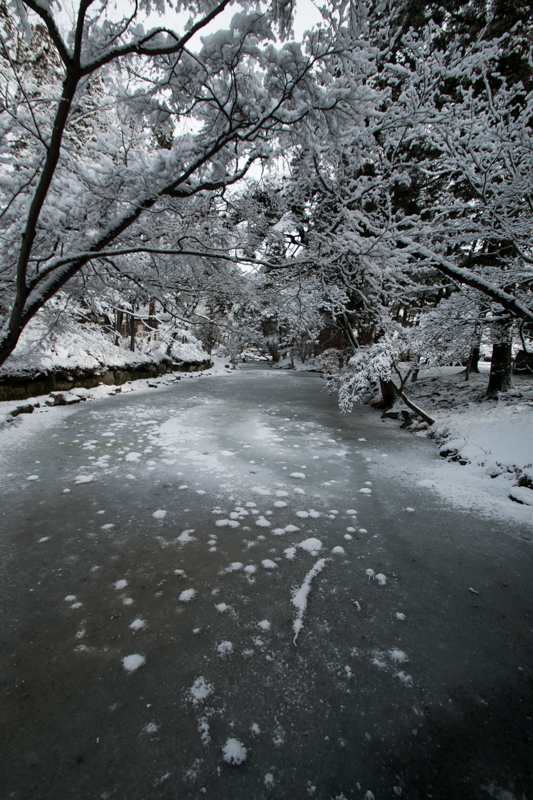 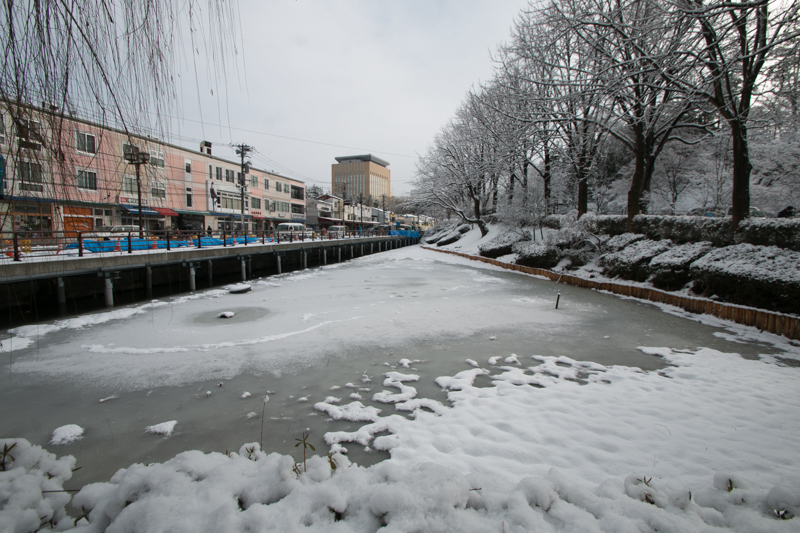 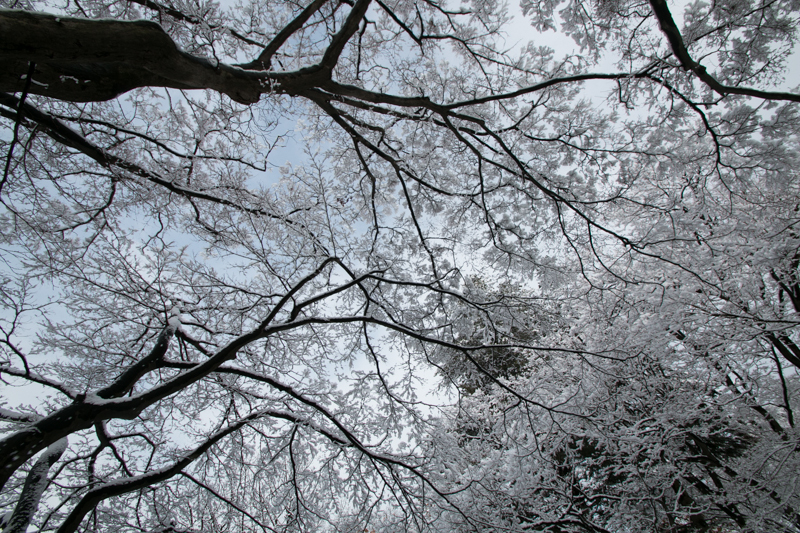 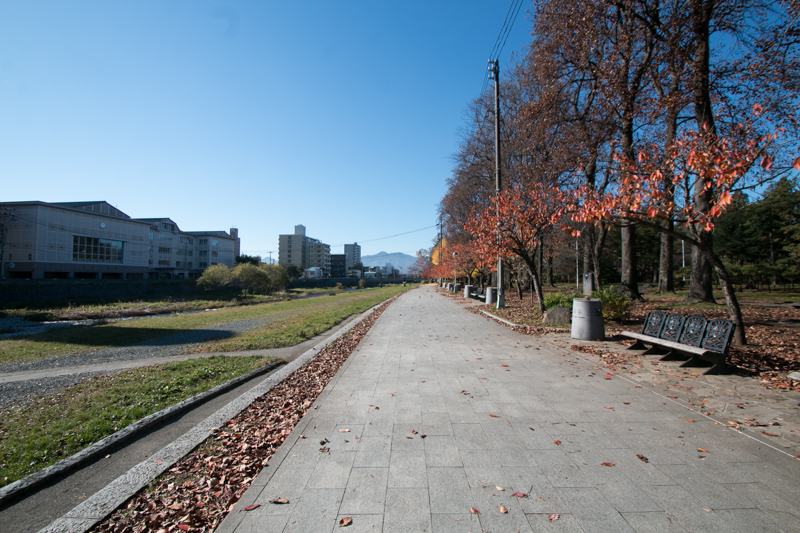 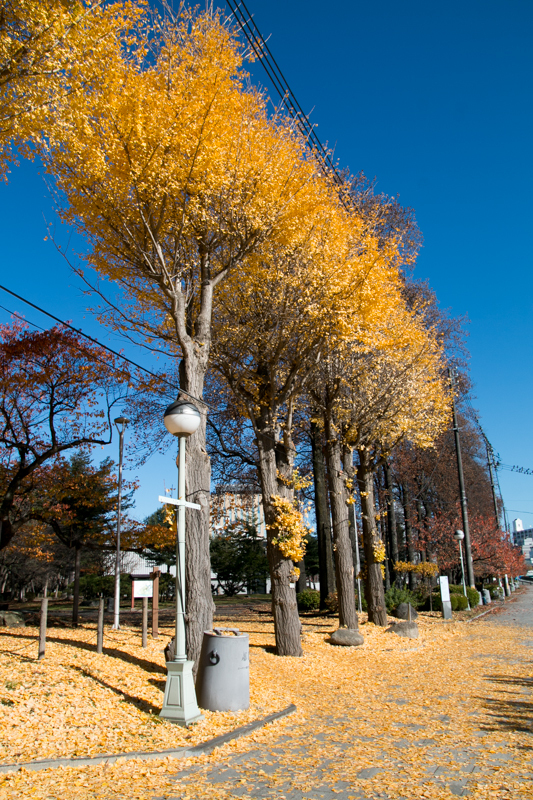 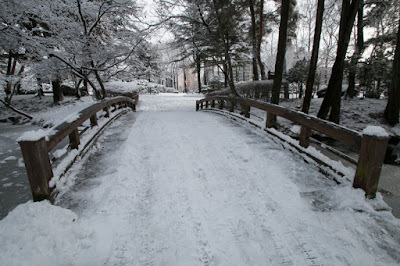 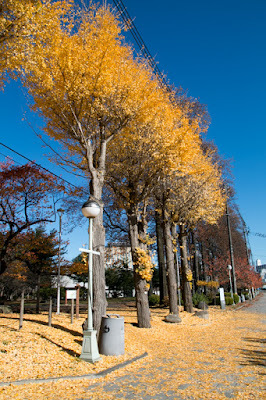 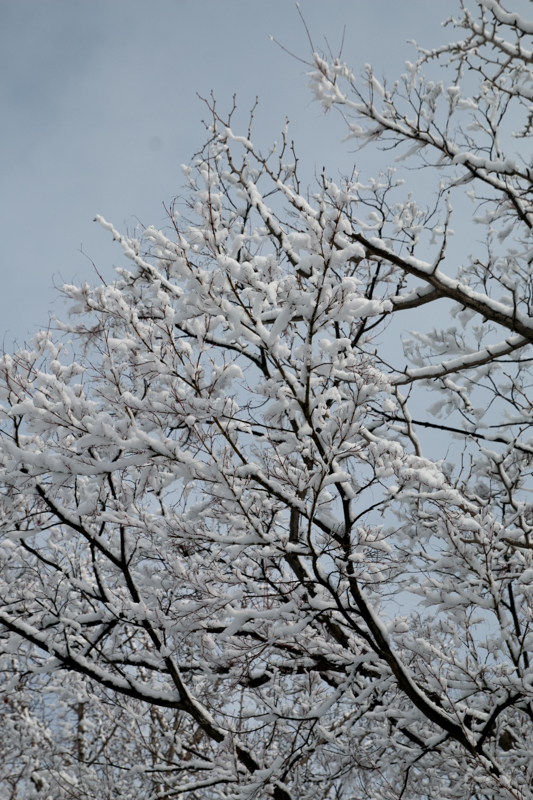 20 minutes walk from JR East Tohoku Shinkansen / Iwate Ginga Tetsudo line Morioka station. 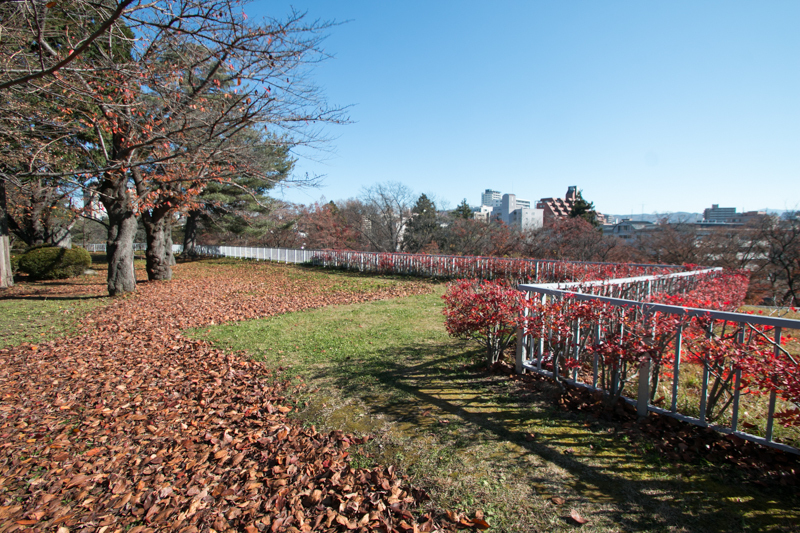 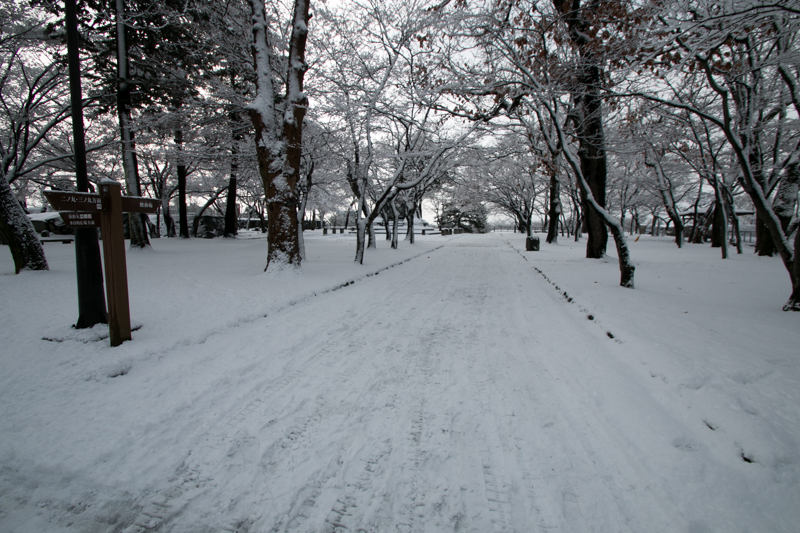 20 minutes drive from Tohoku Jidoshado Expressway Morioka interchange.